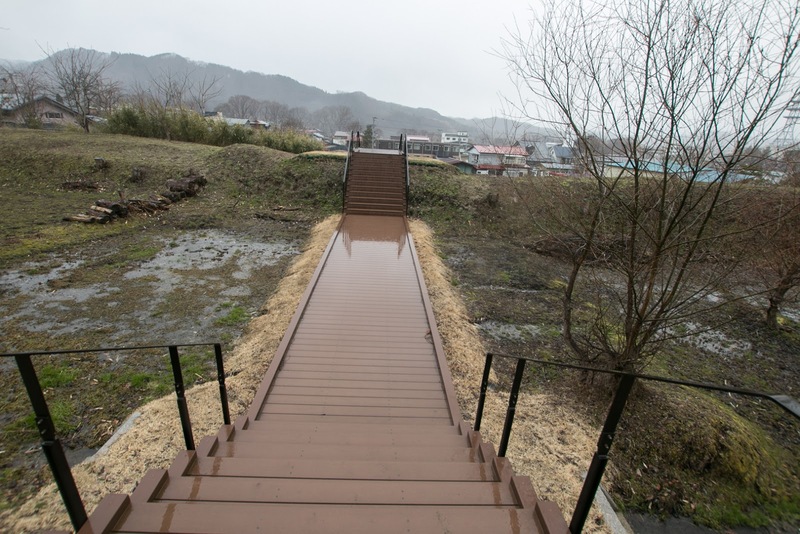 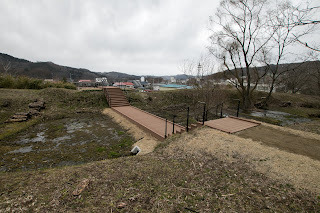 Kunohe castle (九戸城) is located at the river terrace of Mabuchi river near the center of current Ninohe city. 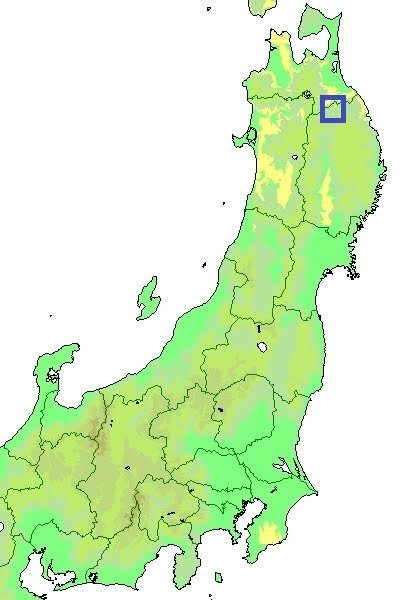 Ninohe city places at a north border of Akita prefecture, but geographically south edge of Hachinohe plain which spread at eastward of Aomori prefecture. 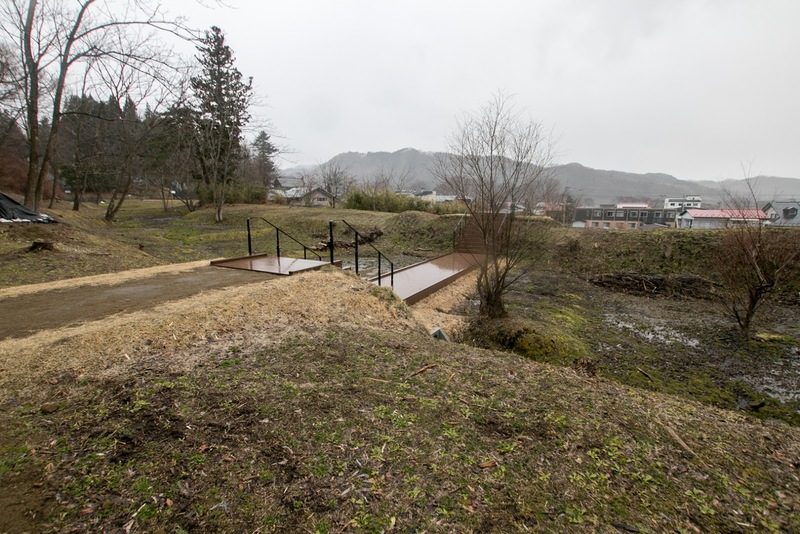 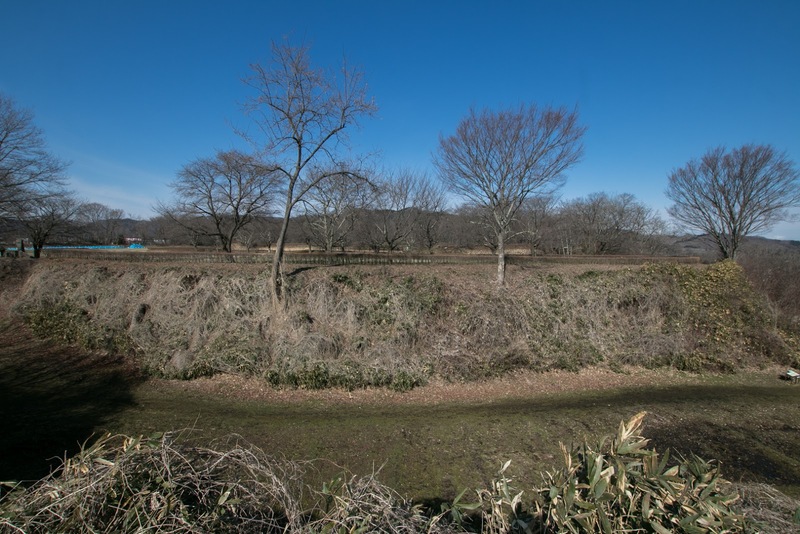 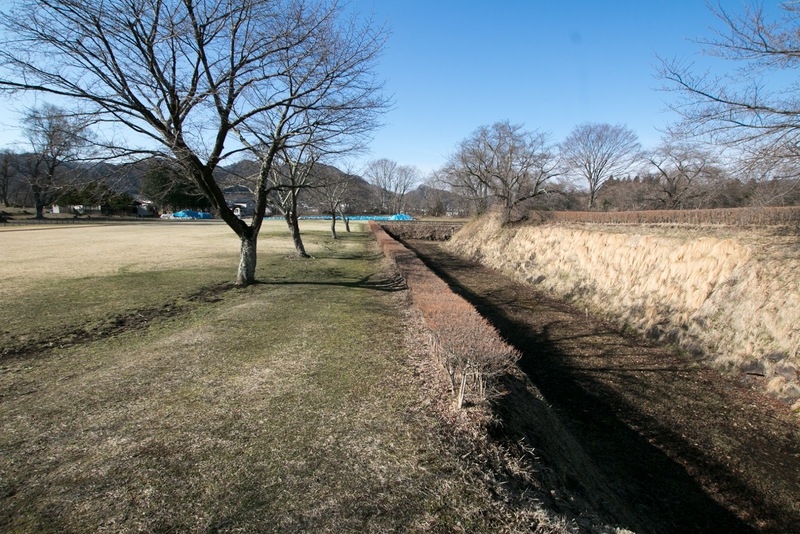 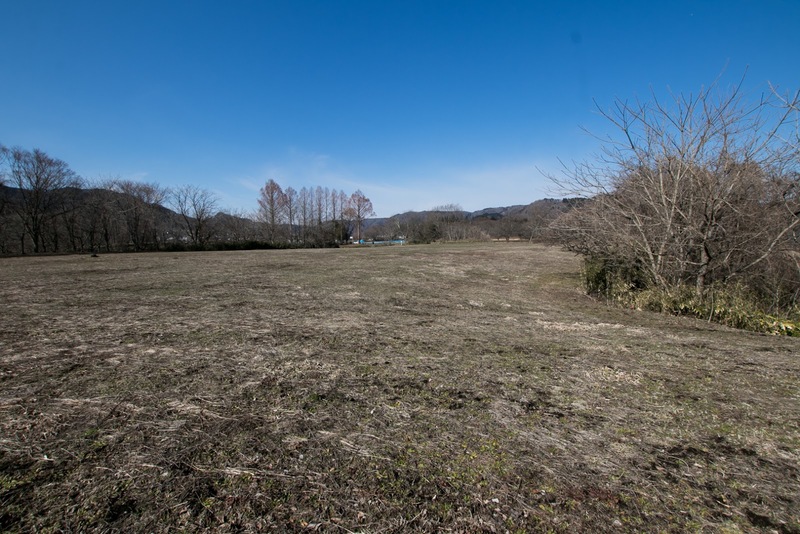 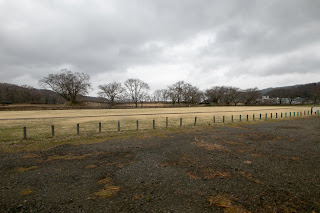 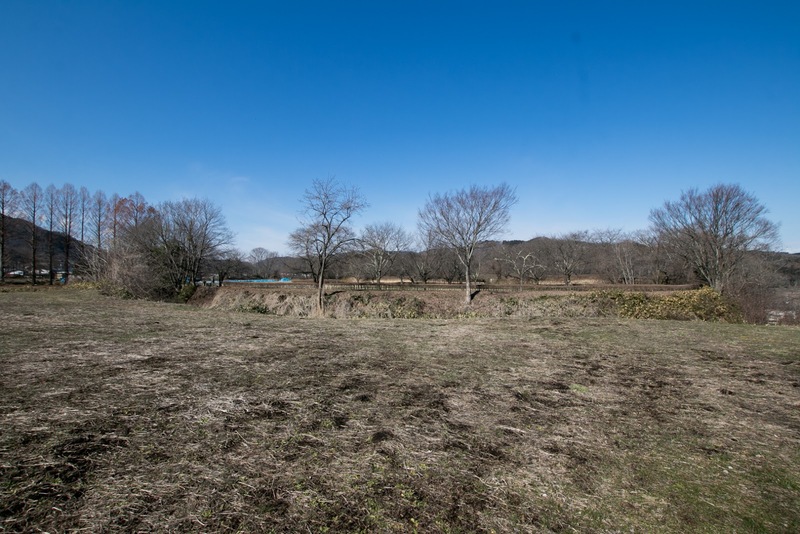 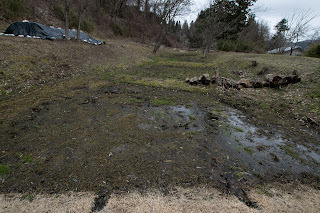 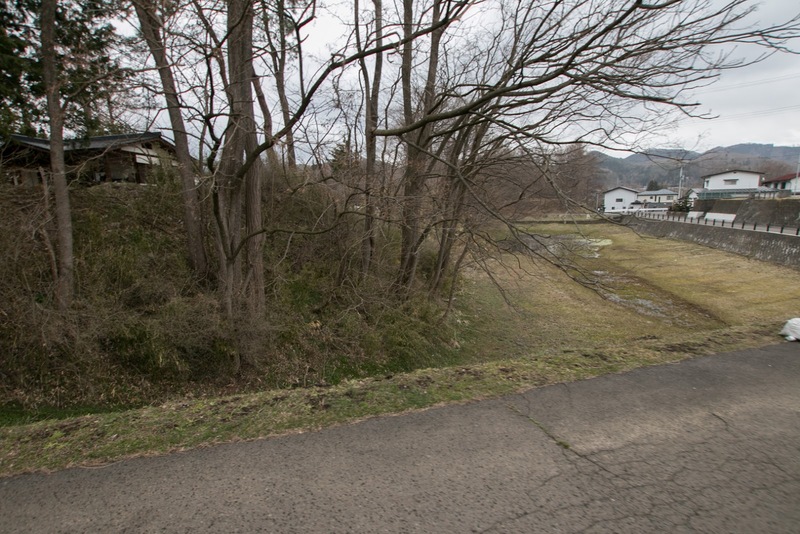 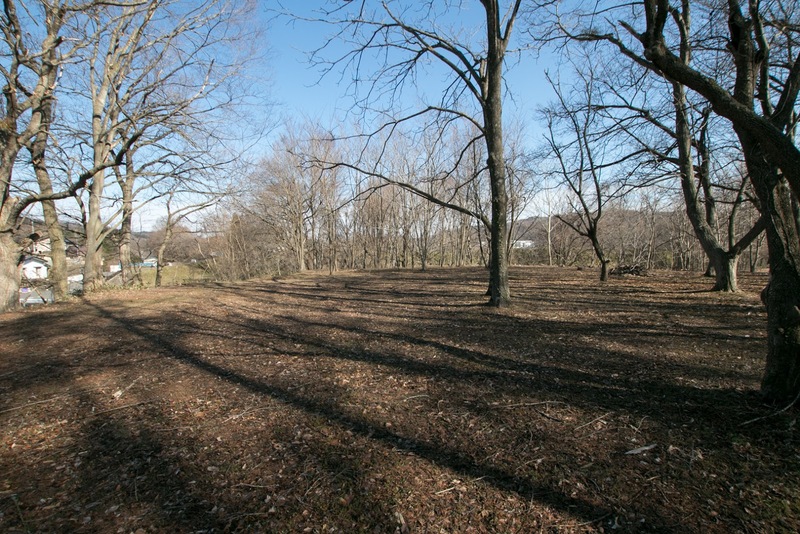 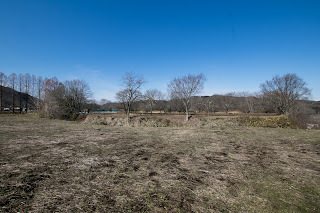 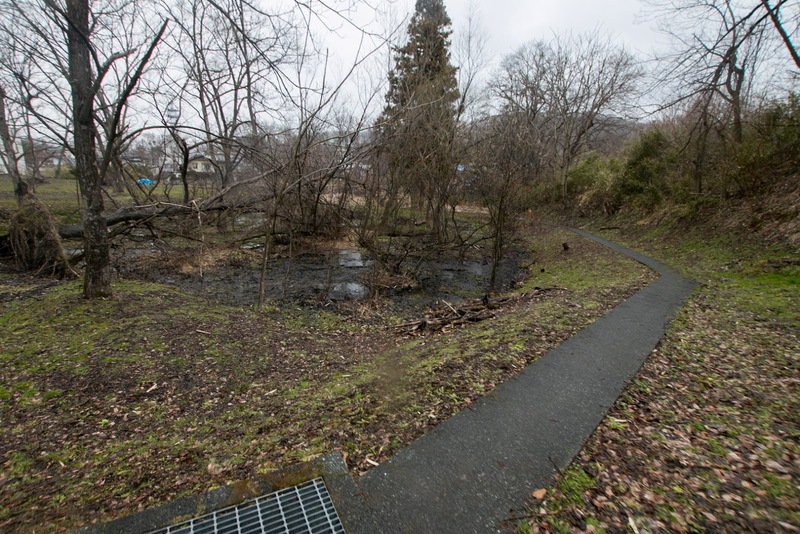 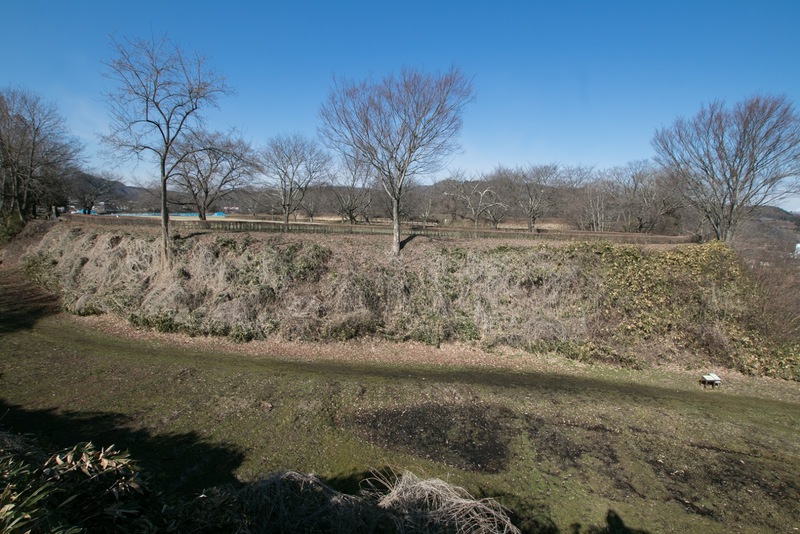 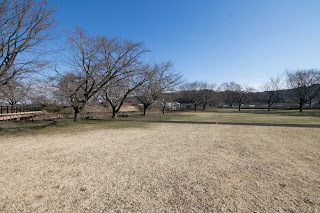 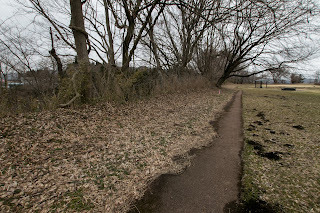 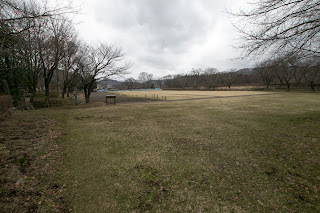 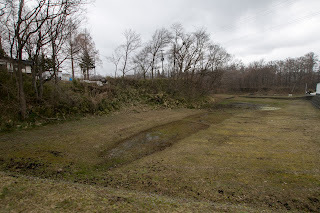 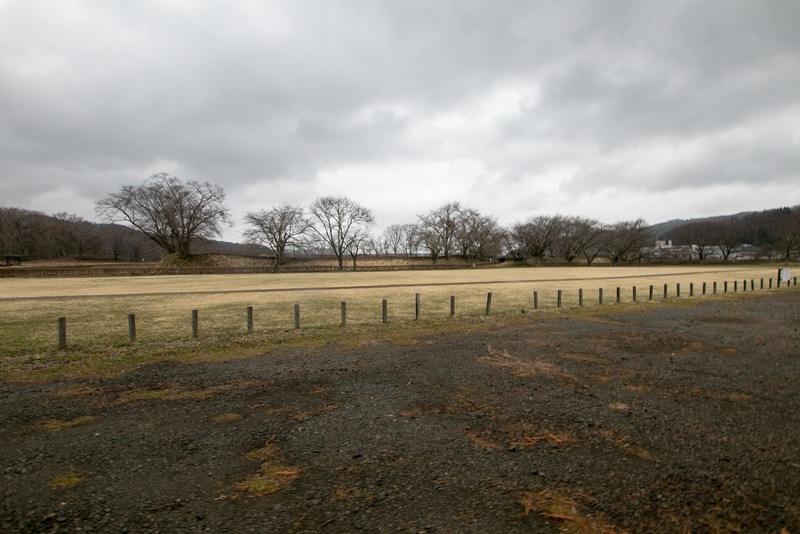 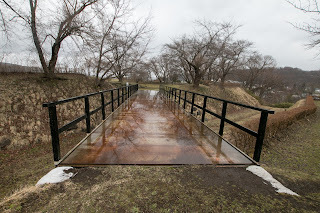 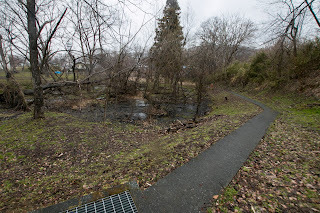 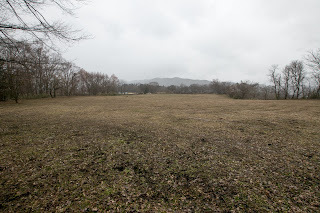 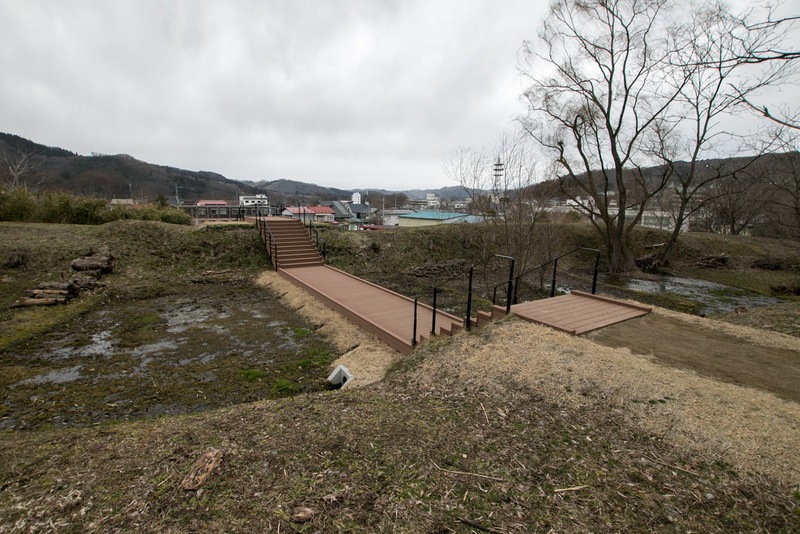 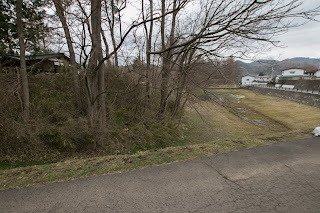 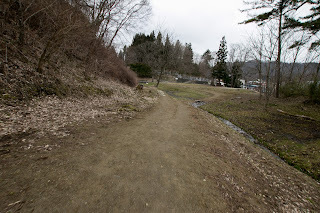 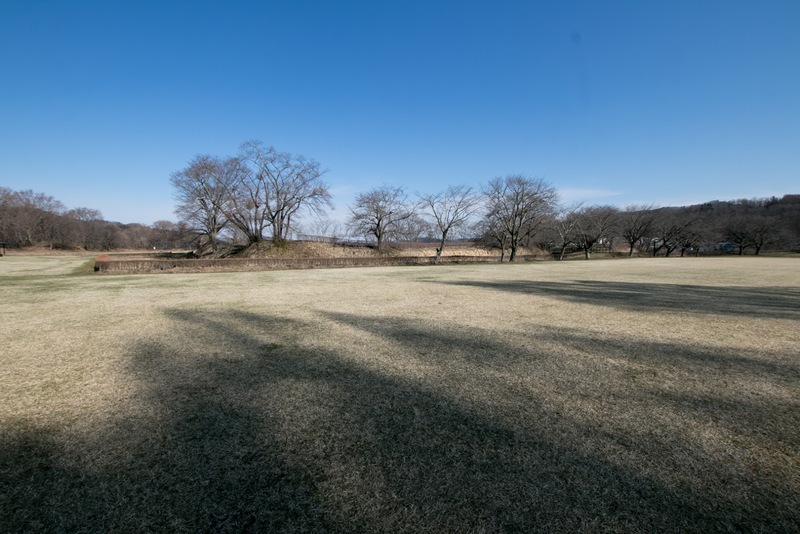 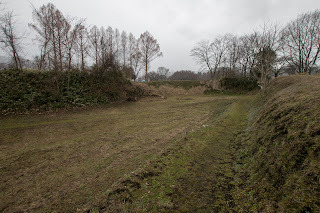 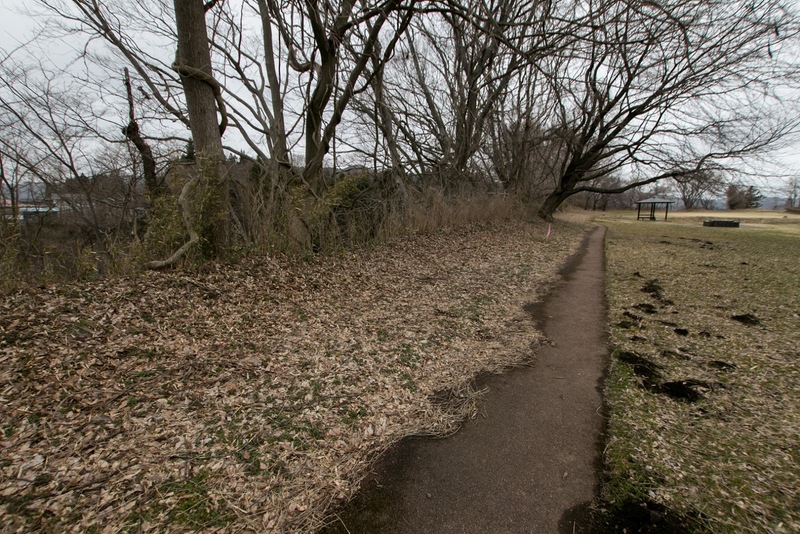 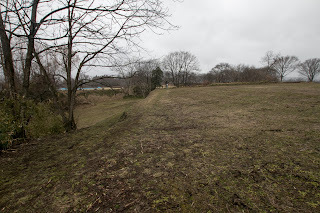 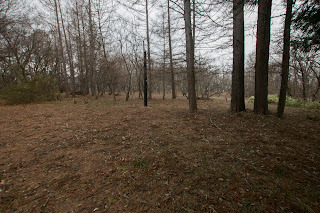 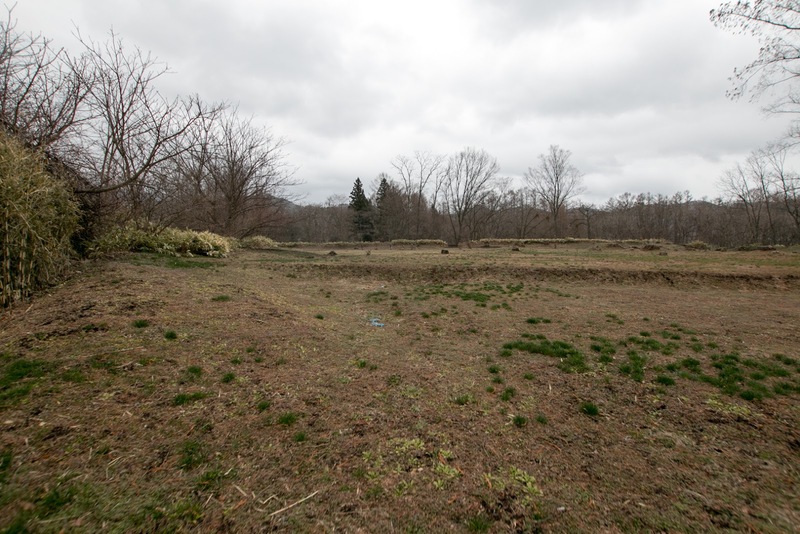 Ninohe area exists at upstream of Mabuchigawa river which flows to Hachinoe area, and 10 kilometer south of Sannnohe area which was the original place of Nanbu clan. 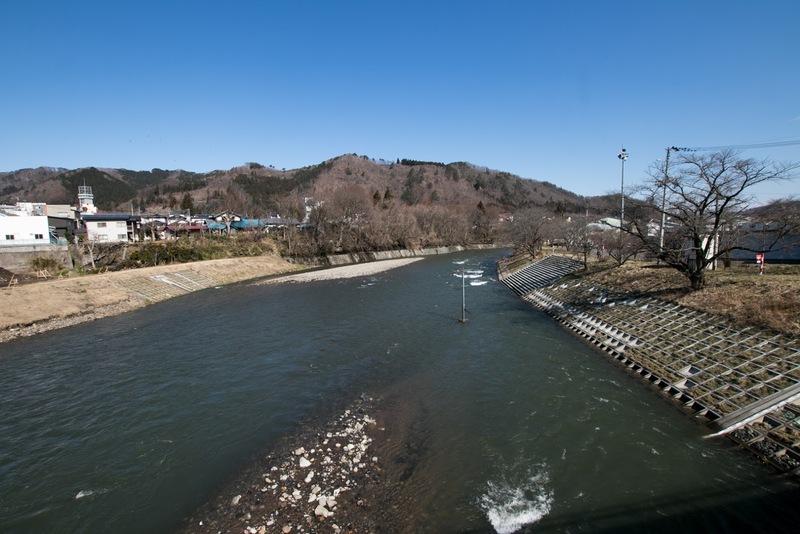 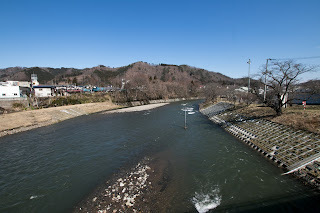 This area is a merging point of Mabuchigawara river from southward and Appigawa river from southwestward. The former is a route to Morioka area and the latter is a way to Akita area or Hirosaki area passing mountains, and currently Ninohe area is an important place of communication where many railroads and roads gathers. 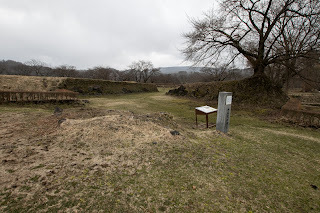 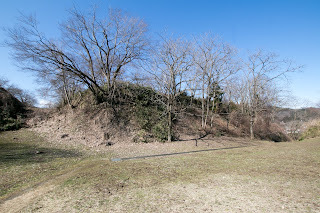 Kunohe castle is known as the site of rebellion of Masazane Kunohe (1536-1591) occurred in 1591, the last disturbance against unification of Japan by Toyotomi government. 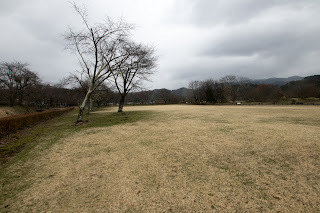 Many songs says “be against the world”, but it is quite rare to do so actually. 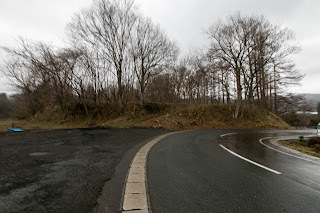 In such case some people can seize glory, but mostly it ends in tragic result. 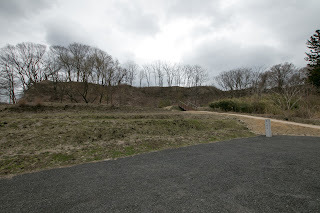 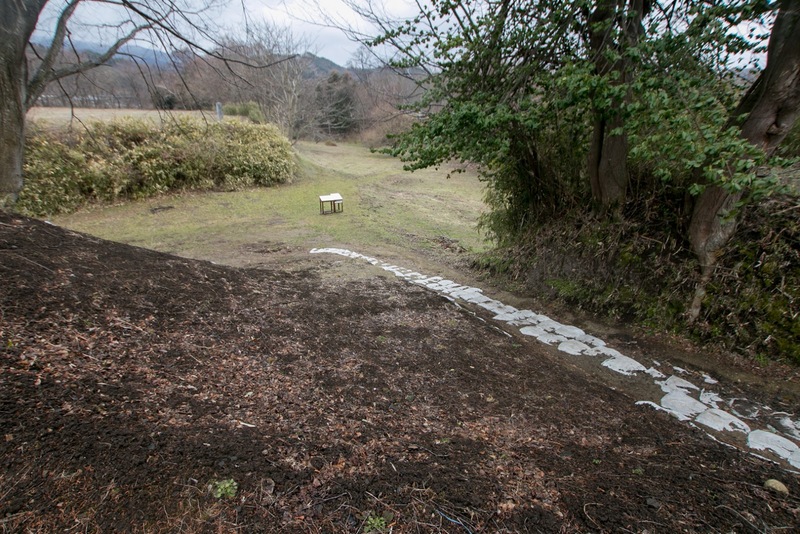 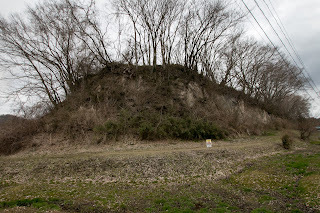 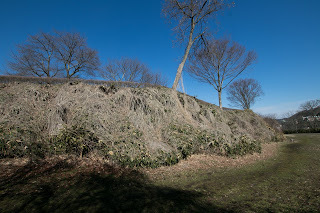 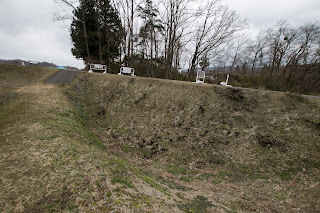 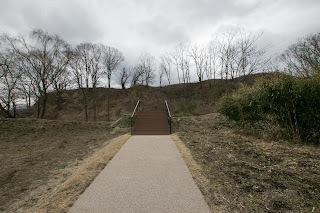 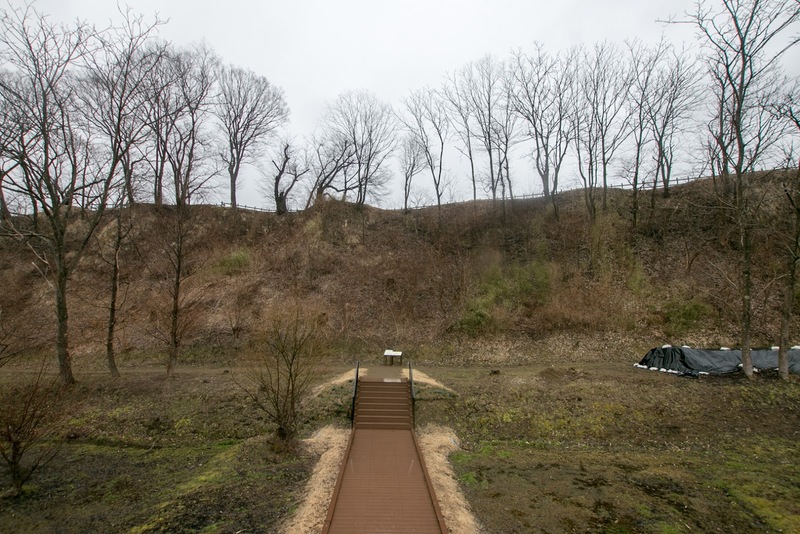 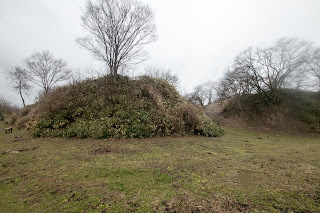 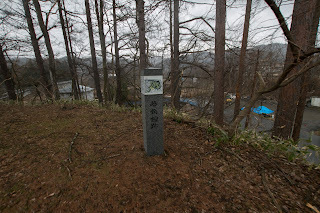 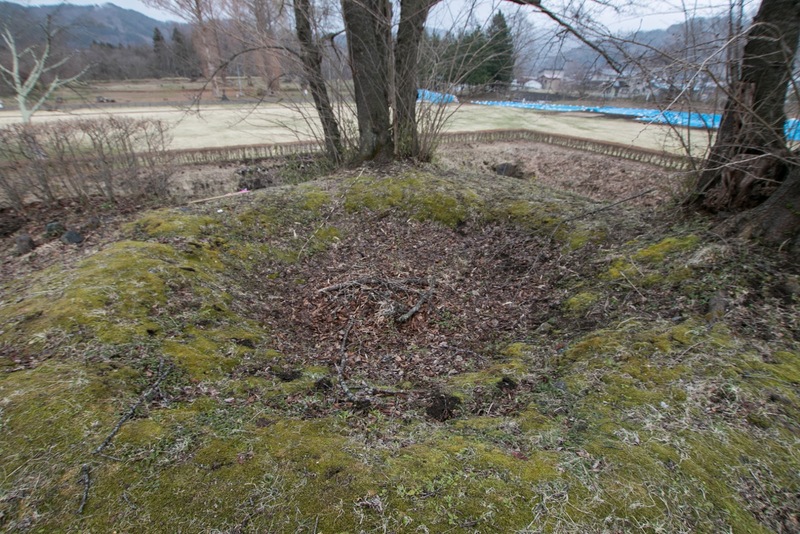 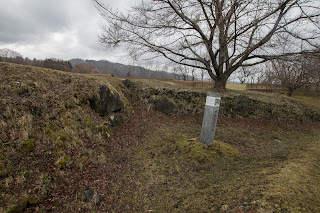 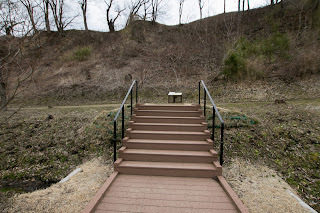 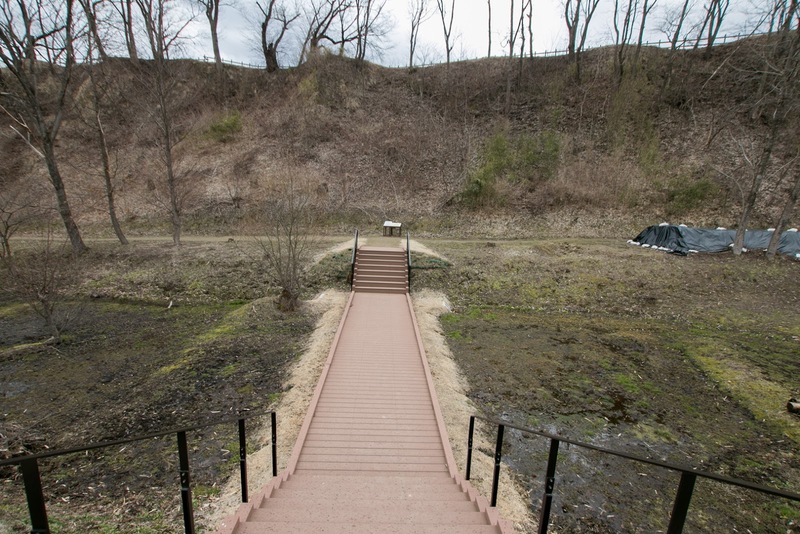 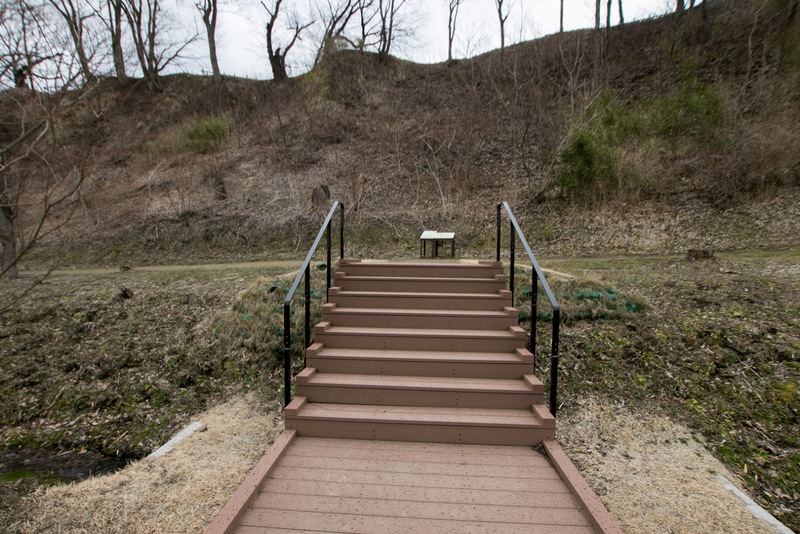 Masazane Kunohe actually did it, and Kunohe castle is the place of rebellion and suppression. But this rebellion was not just a matter of heroism, but occurred from conflict of centralization and decentralization. 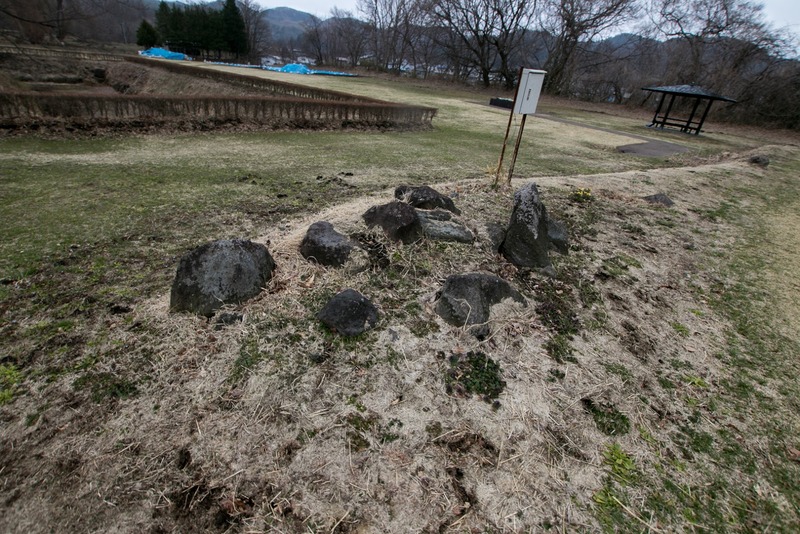 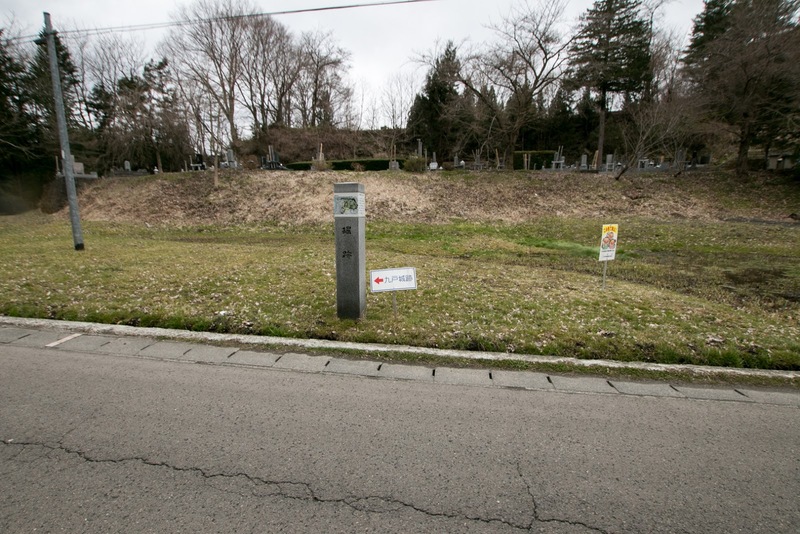 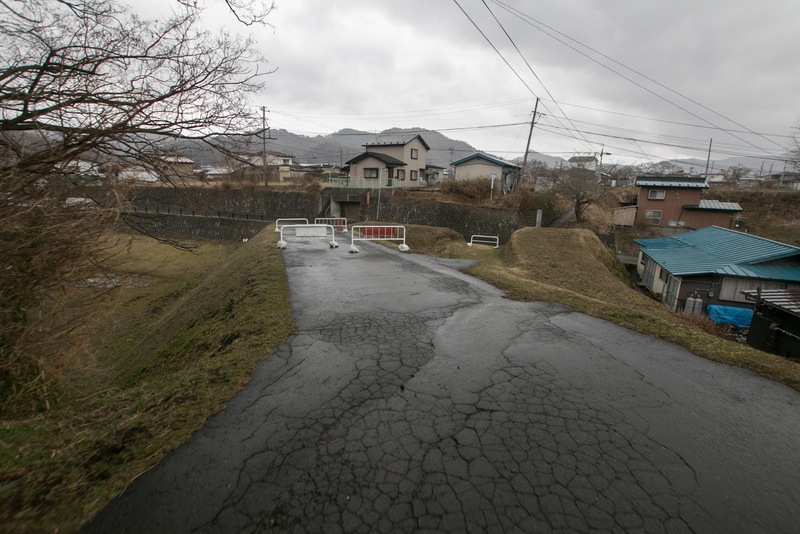 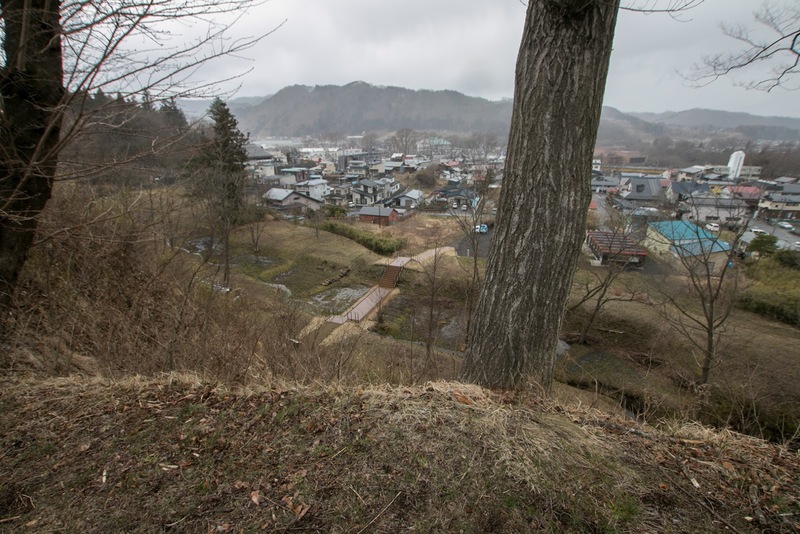 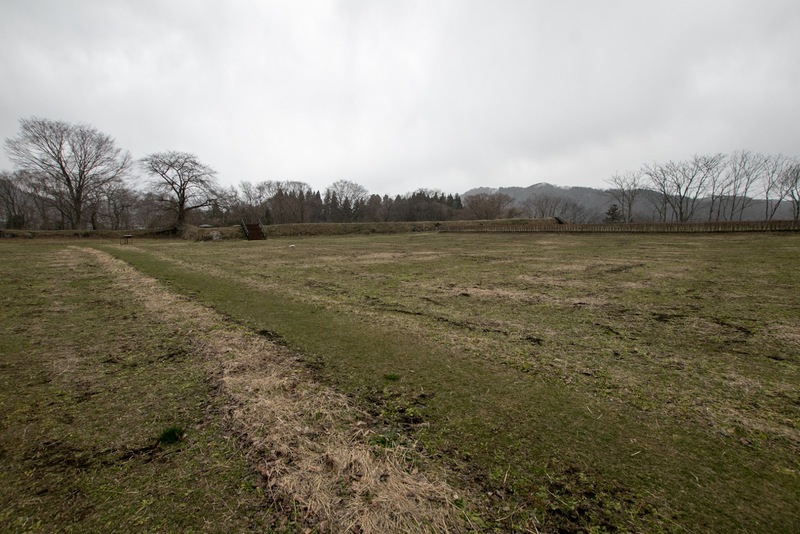 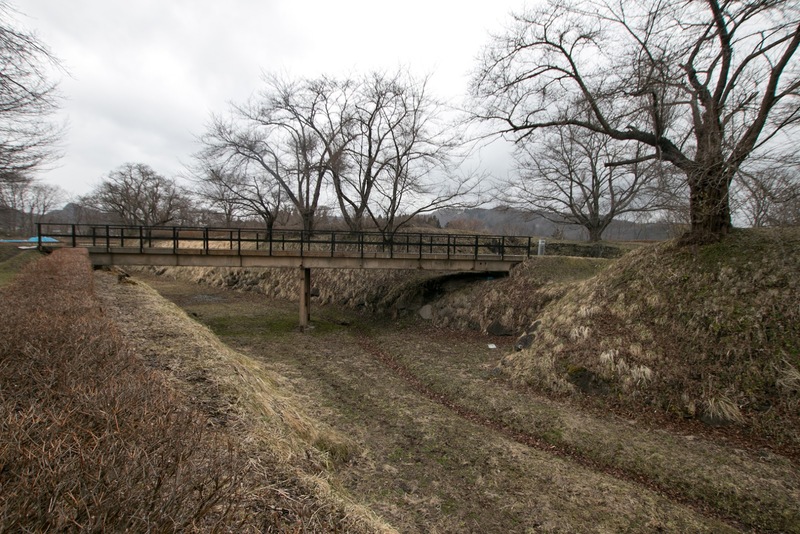 Fault of rebellion of Kunohe clan meant the end of autonomy in Tohoku region. 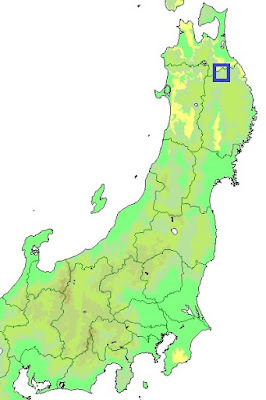 After 7th century, Tohoku region was gradually integrated into ancient Japan and completely treated as a part of Japan by the end of 10th century. 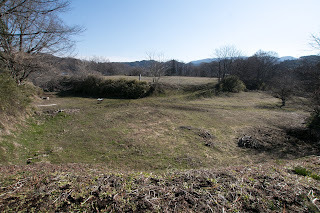 But because of its distance from central area, especially north part of Tohoku region kept certain degree of authonomy throughout medieval era. Semi independent government such as Ohshu Fujiwara clan in 12th century or Ohshu Shogunate was suppressed by central government, but central government could only indirectly govern these area throught major local lords such as Date clan or Nanbu clan. 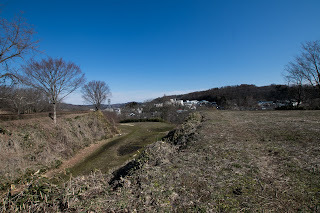 Especially Hachinohe area is a one of the most distant area which was separated by mountains, and Nanbu clan autonomously governed this area in medieval area. Precise origin of Nanbu clan is unknown but is said as originally a lord of Nanbu area in Kai province (Yamanashi prefecture). 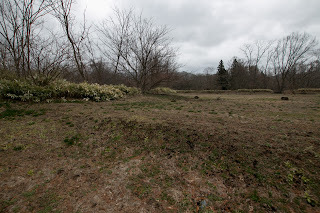 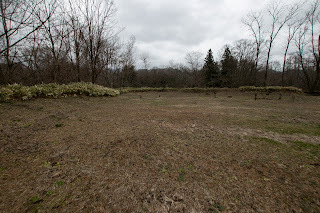 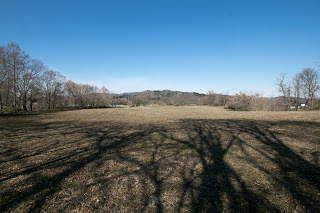 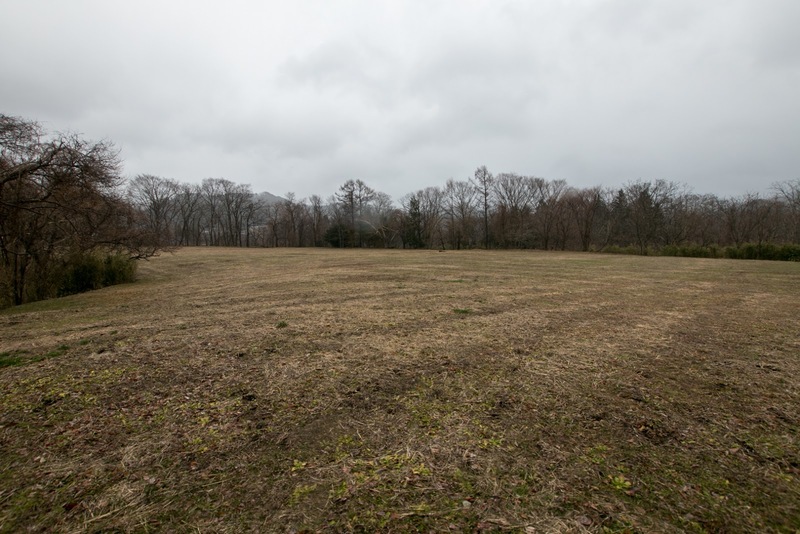 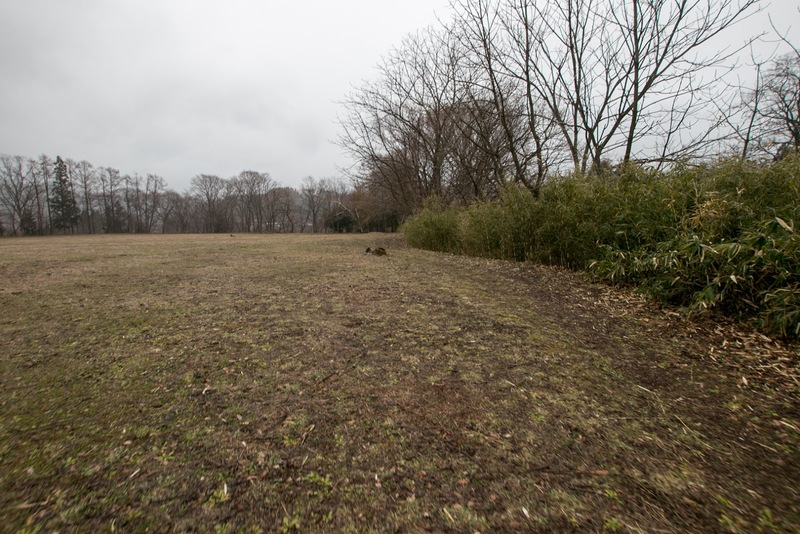 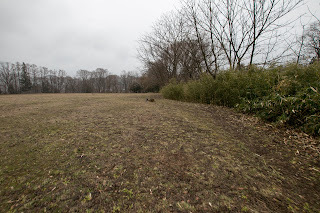 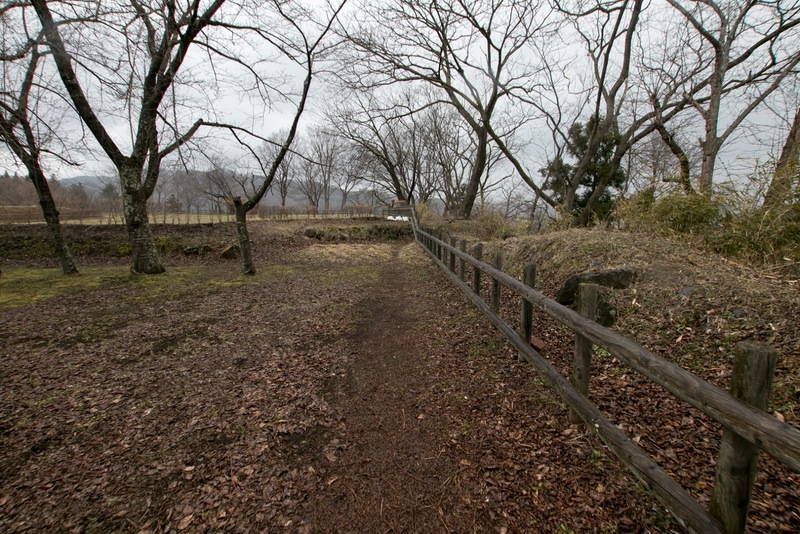 Around 13th century or 14 th century Nanbu clan achieved territory in Hachinohe plain and moved to this region. 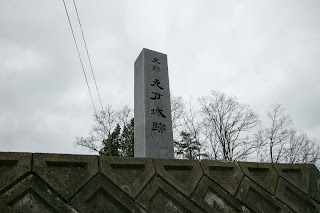 At first Hachinohe Nanbu clan was the leader of the clan, but later Sannohe Nanbu clan grew their power and became the head family of the clan. Nanbu clan aggressively attacked surrounding lords in 15th century, and once lost their power. 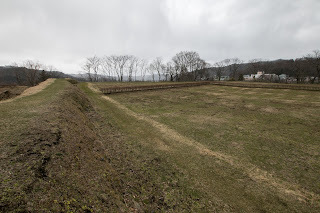 But in the former half of 16th century, under its leader Harumasa Nanbu (1517-1582) who built Sannohe castle, Nanbu clan expanded their territory into Tsugaru area and became its peak period. But is spite of it large territory, Nanbu clan was not sufficiently centralized and rather a loose coalition of branch families and strong generals. Precise origin of Kunohe clan is also unknown but is said as a branch family of Nanbu clan. Originally Kunohe clan located at Kunohe area, next of Ninohe city, but later moved to Ninohe area and built Kunohe castle around 15th century. 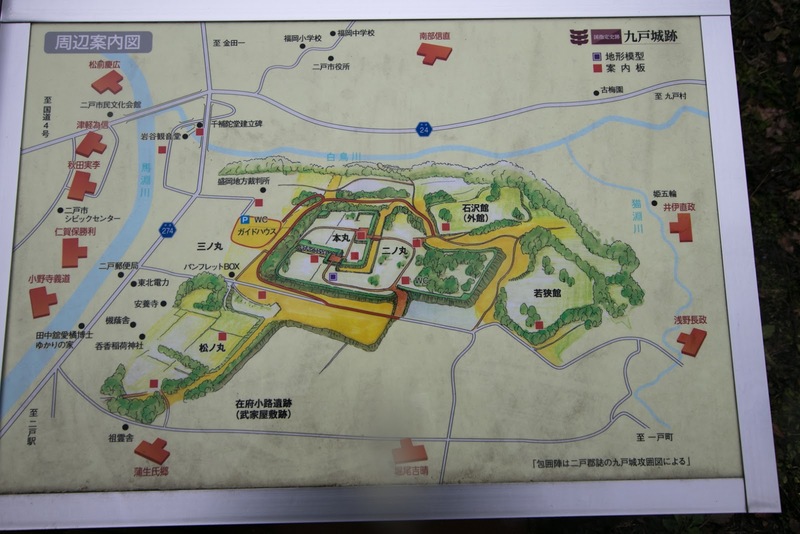 As Kunohe clan is located at the front of Nanbu clan to surrounding enemies, Kunohe clan grew as a military core of Nanbu clan. 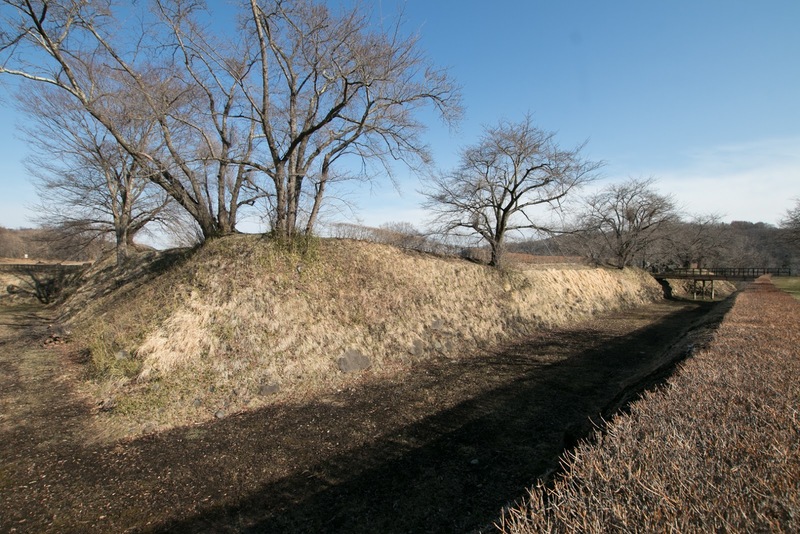 Especially Masazane Kunohe was a brave general and contributed to the victory against Ando clan at Akita area or Shiba clan at Morioka area. As a vanguard of Nanbu clan, reputation of Masazane was high and seemed as equivalent to the leader of Nanbu clan. 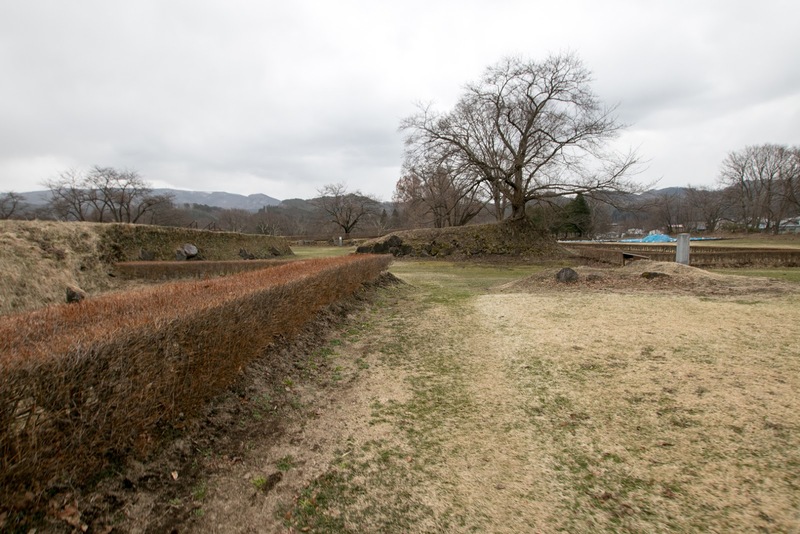 As a strong general of Nanbu clan, Masazane expanded Kunohe castle into a large castle. 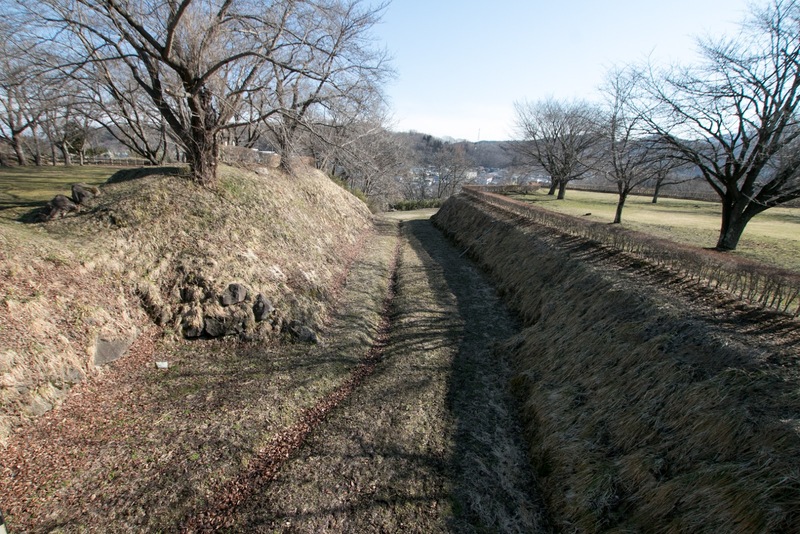 Kunohe castle spread over the river terrace at the merging point of Mabuchigawa river at west side and Shiratorigawa river at north side. 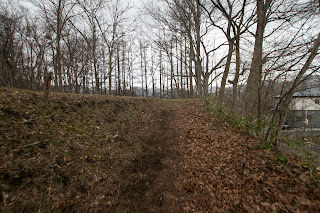 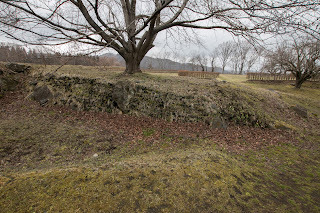 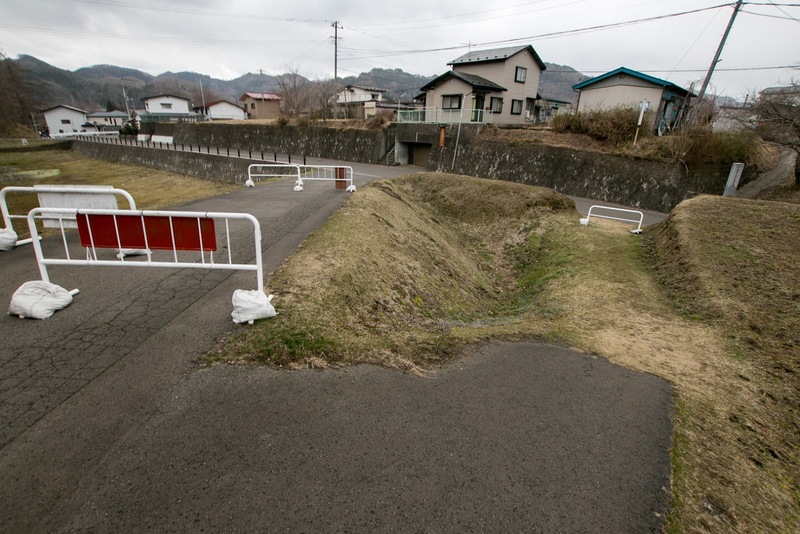 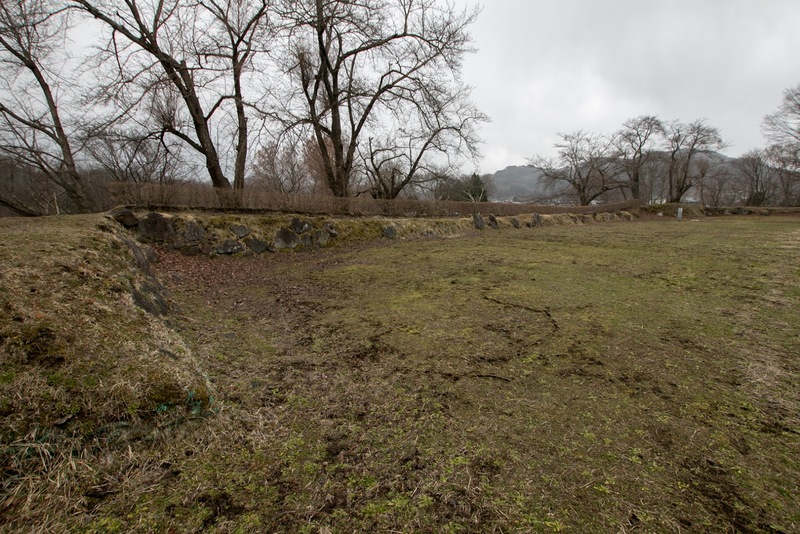 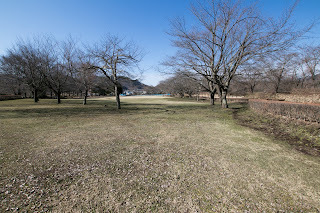 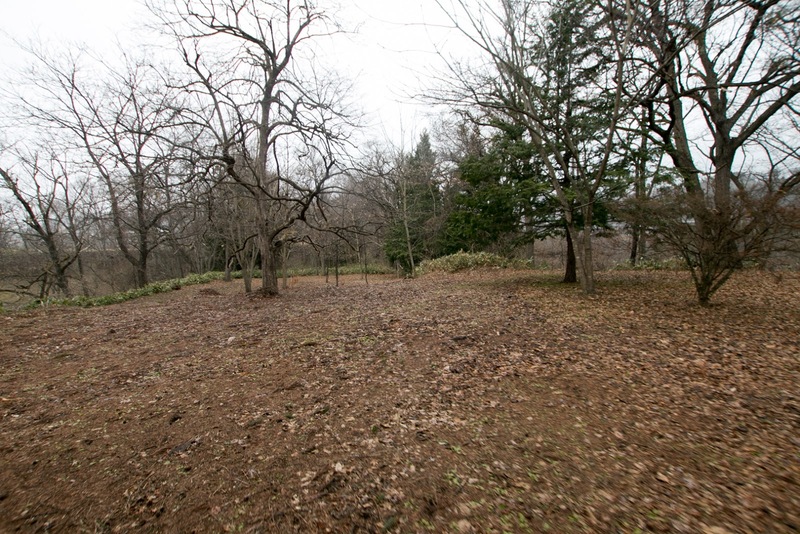 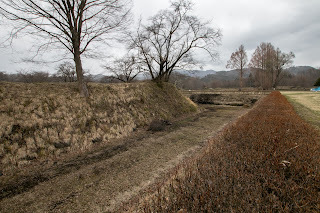 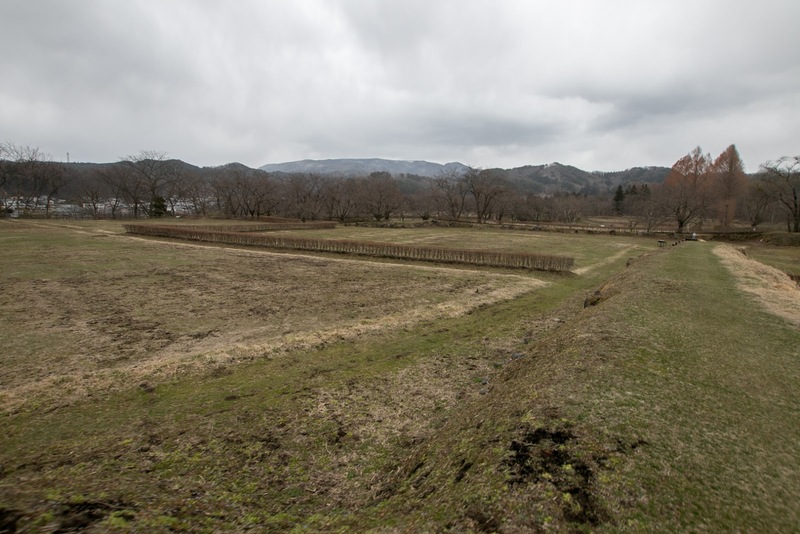 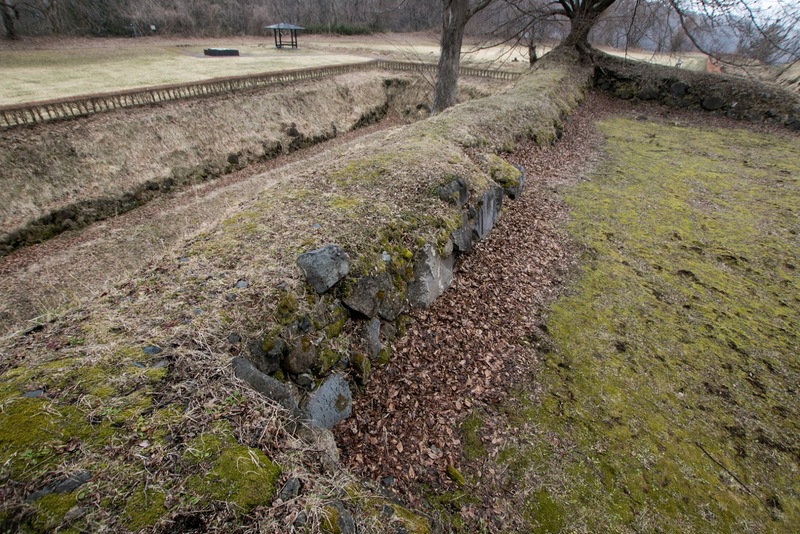 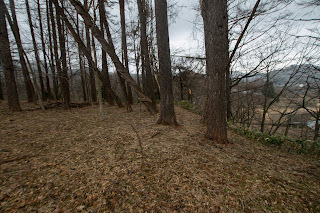 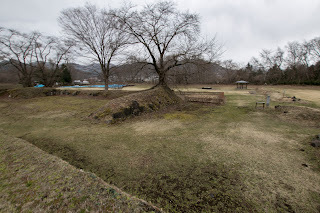 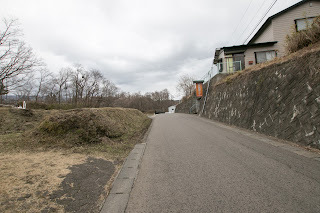 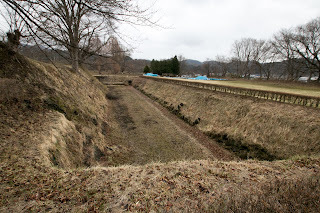 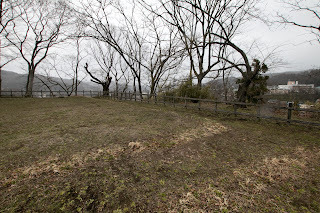 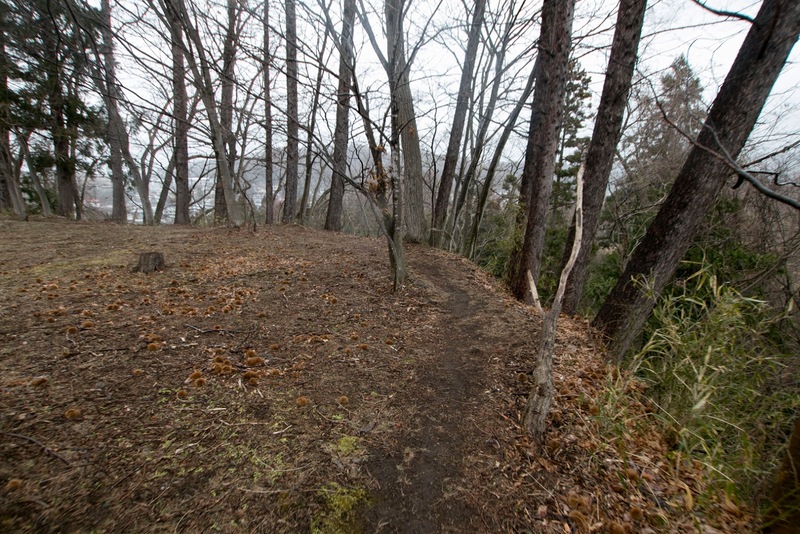 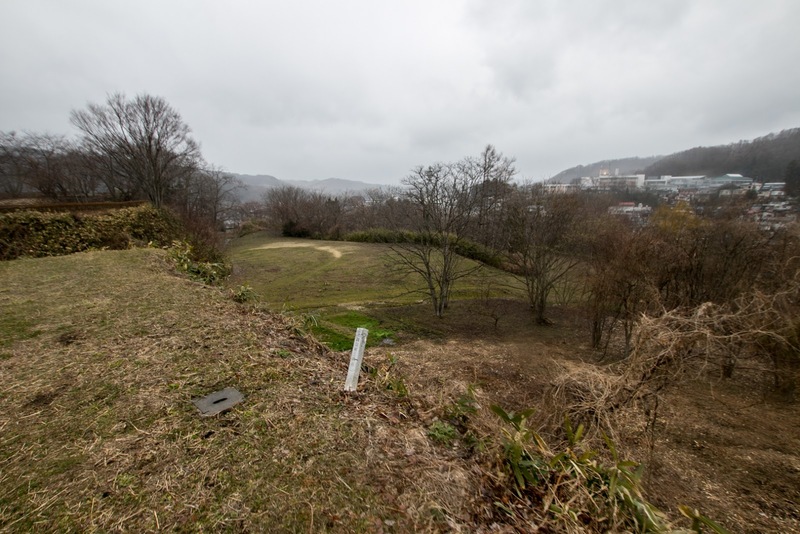 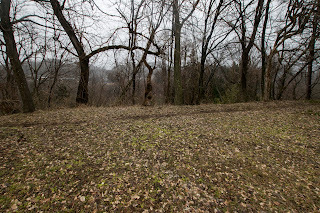 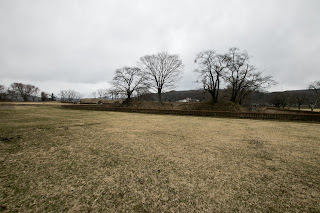 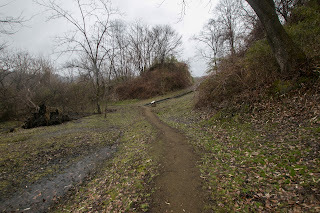 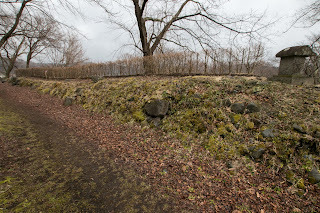 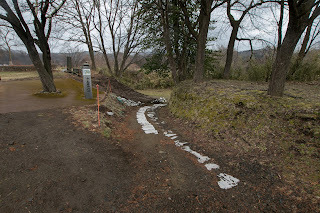 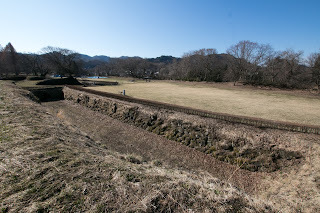 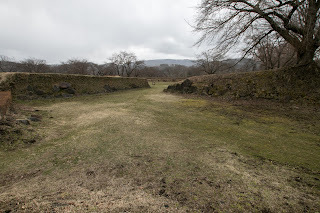 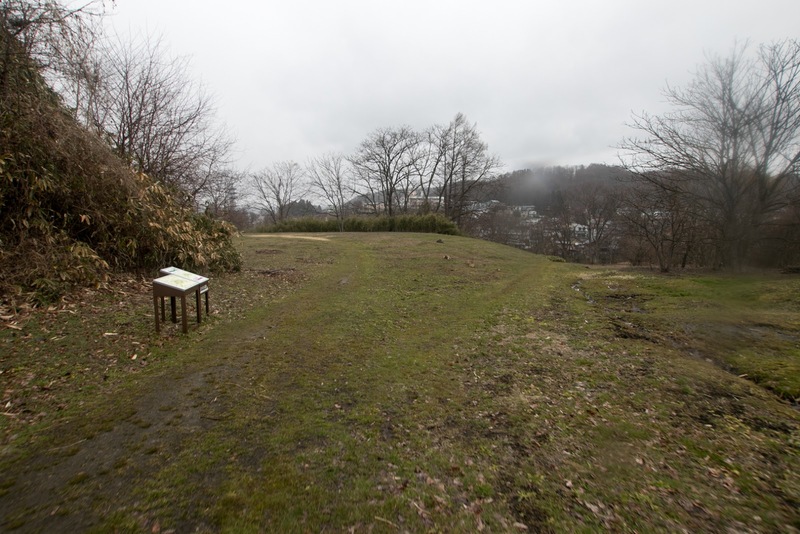 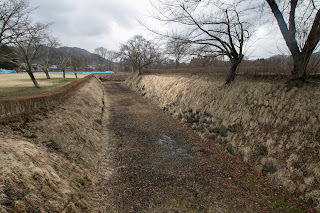 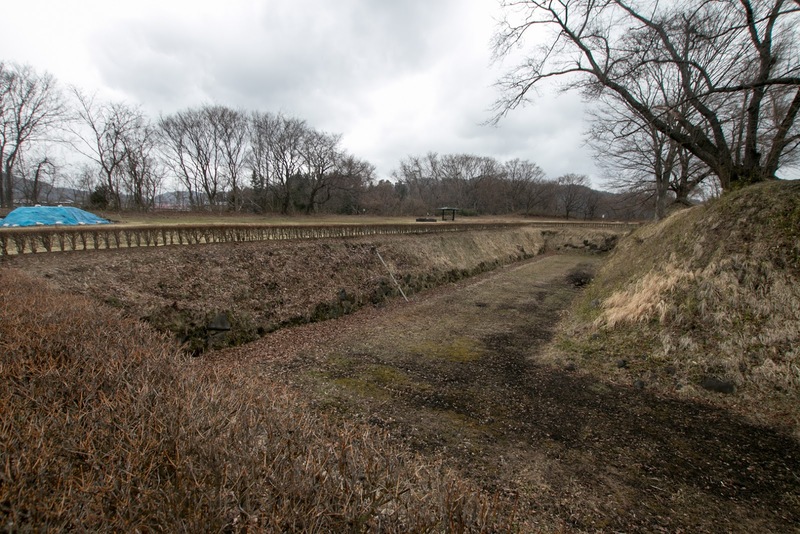 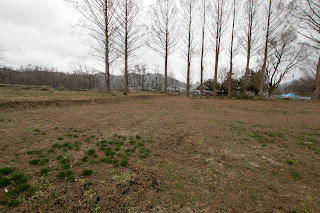 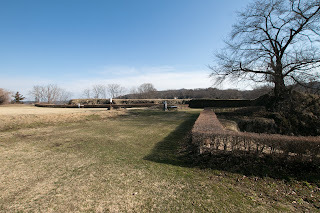 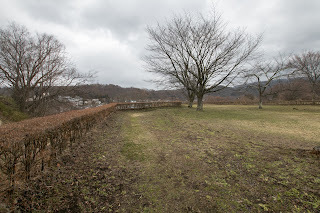 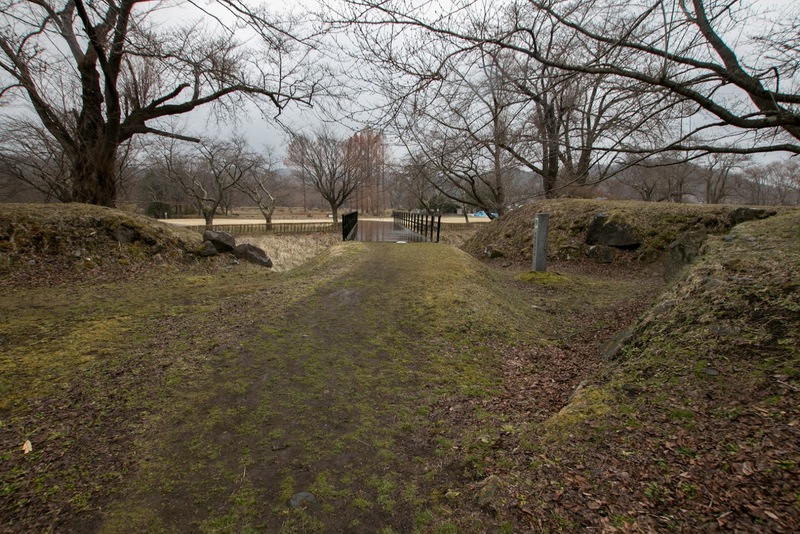 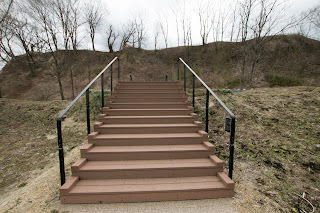 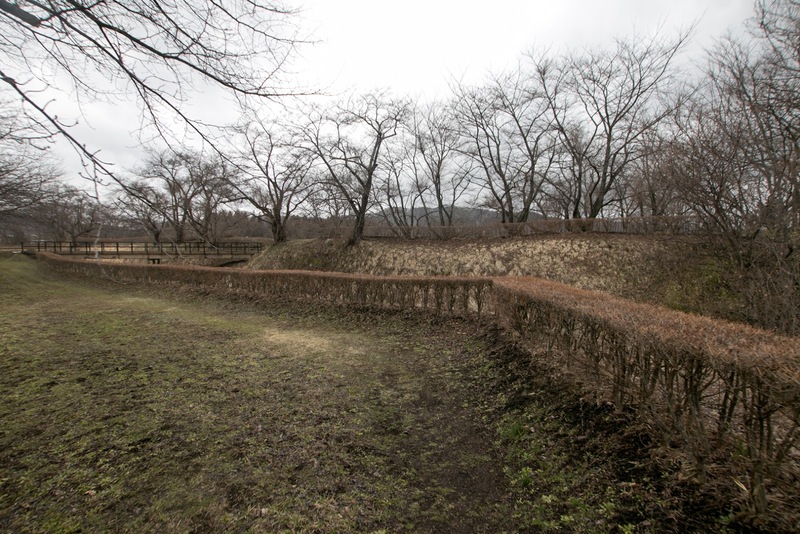 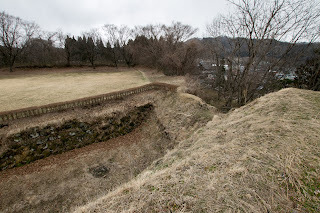 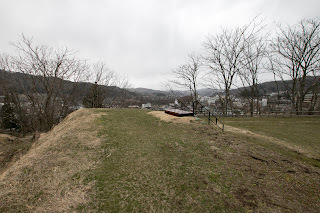 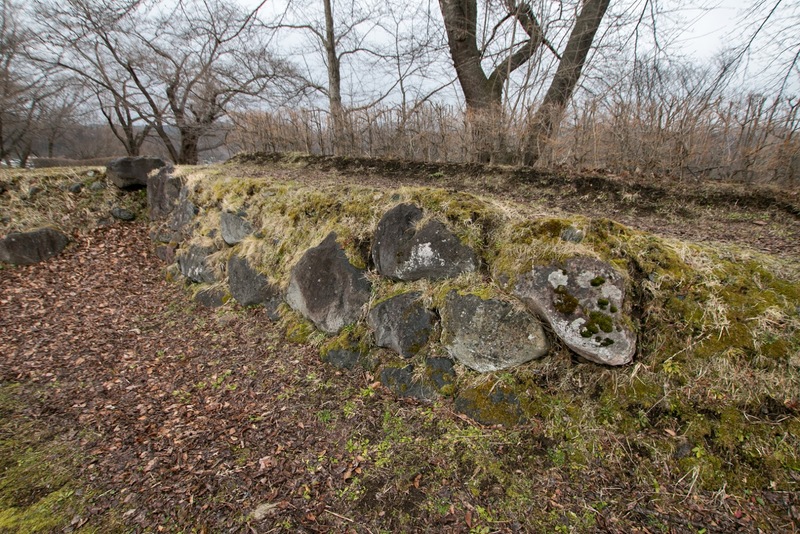 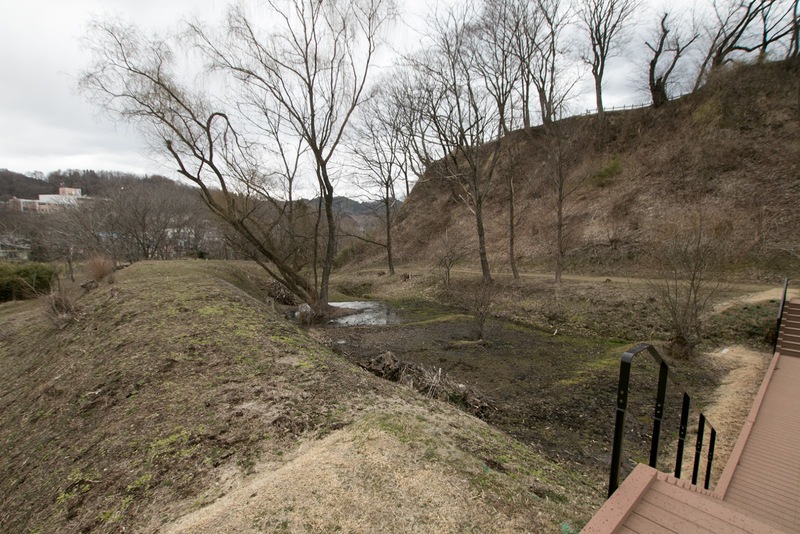 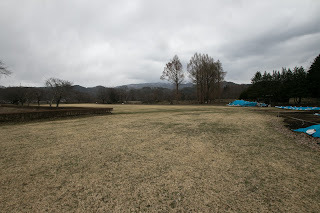 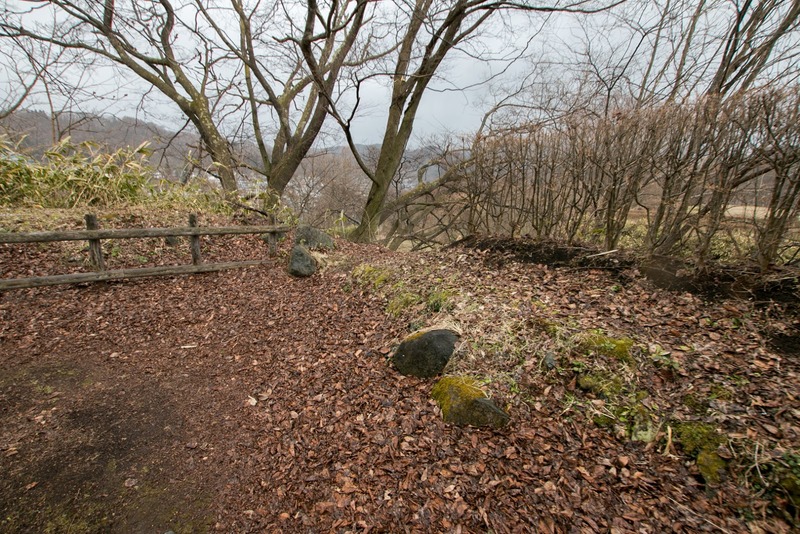 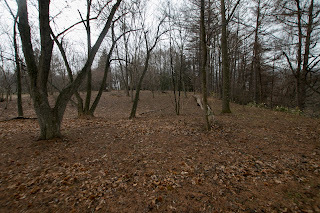 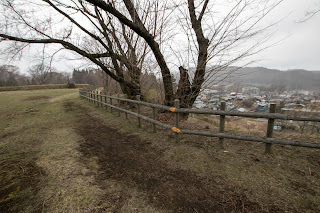 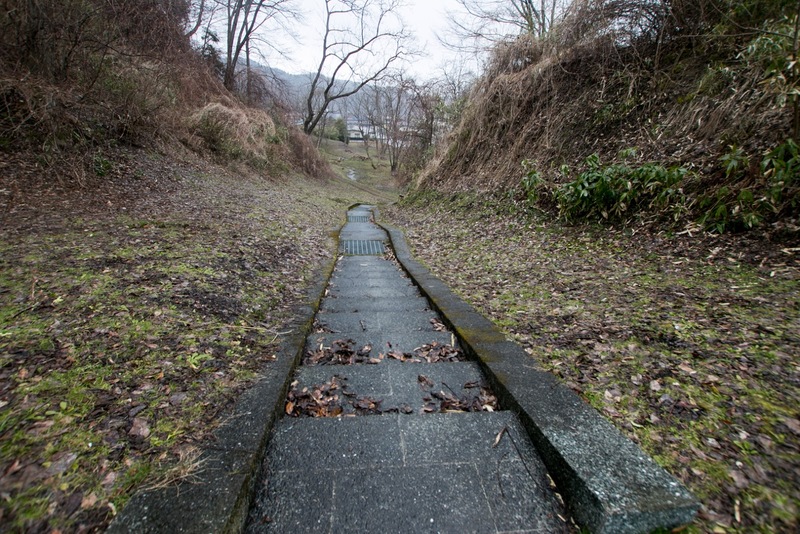 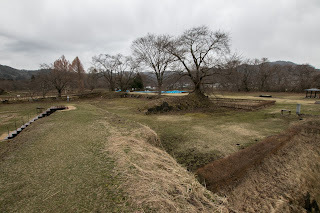 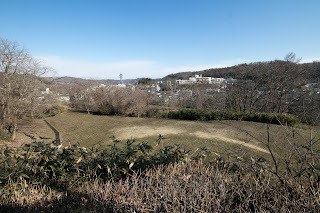 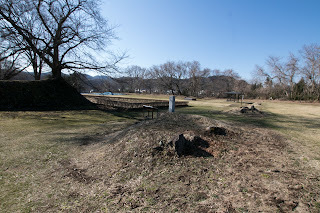 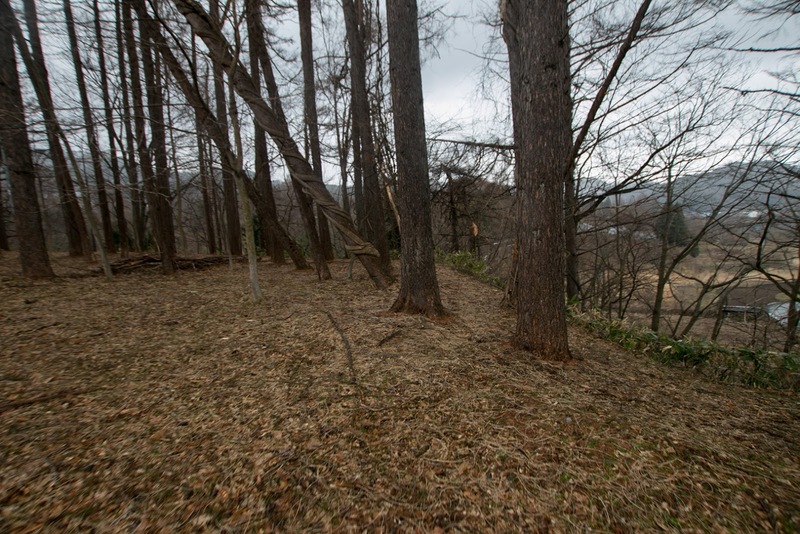 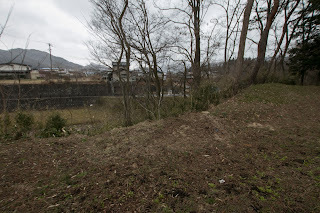 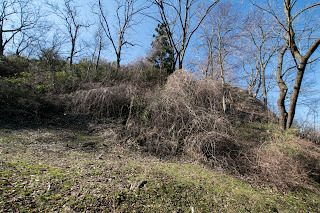 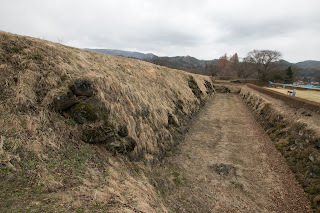 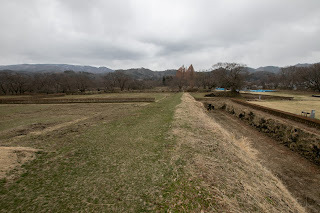 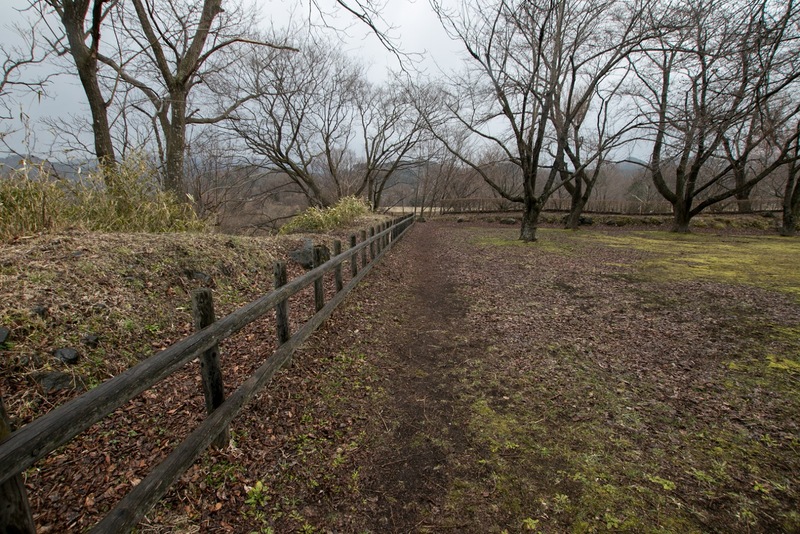 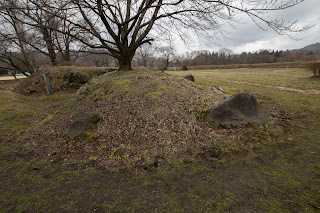 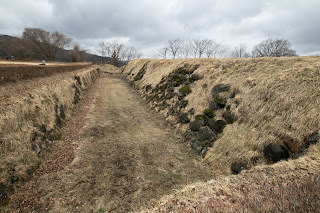 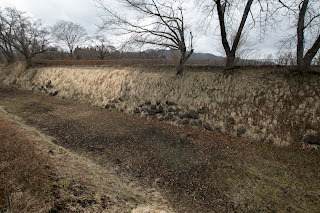 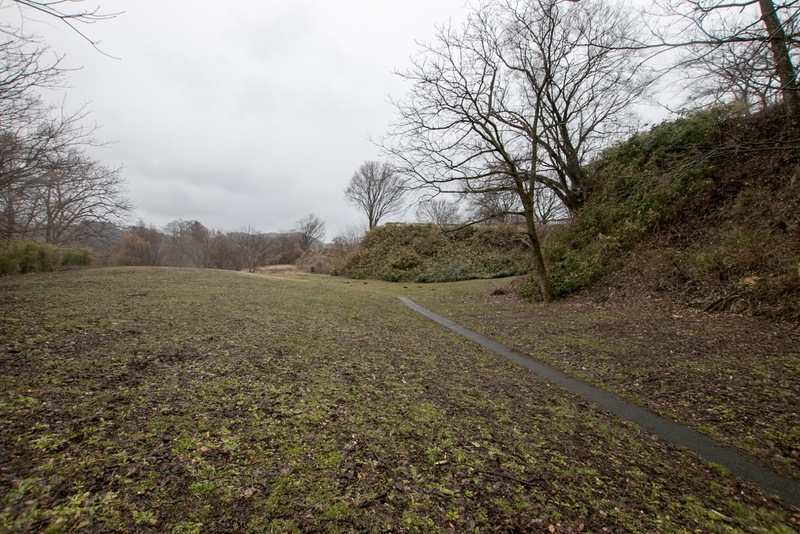 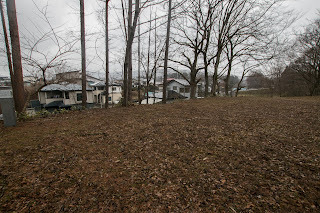 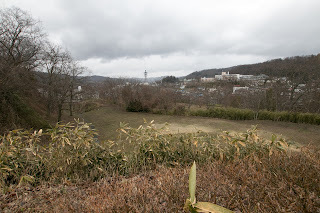 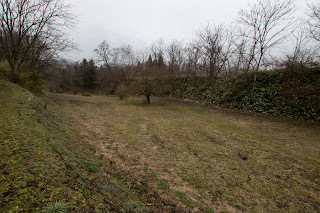 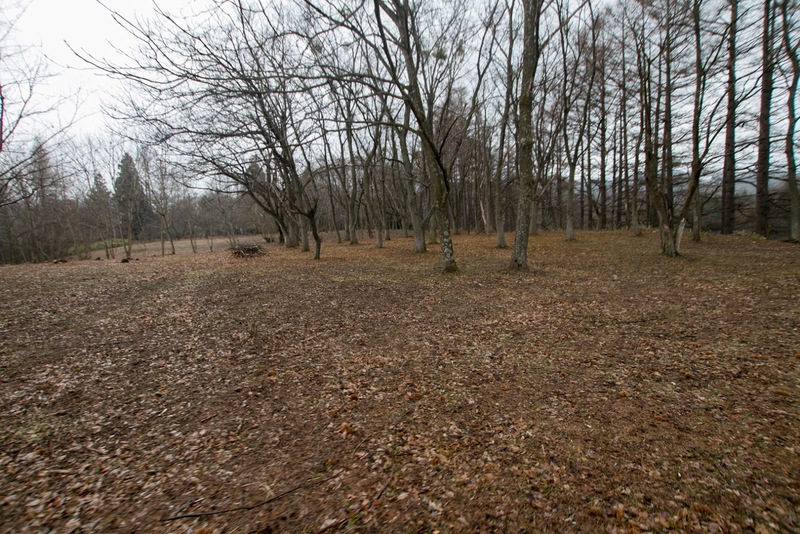 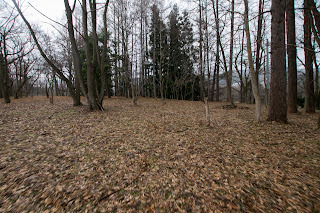 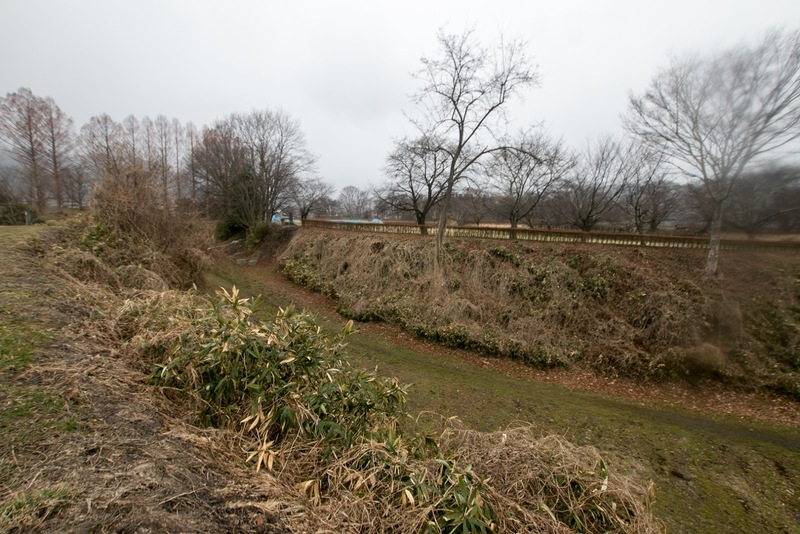 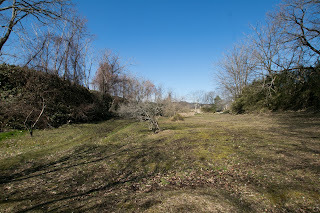 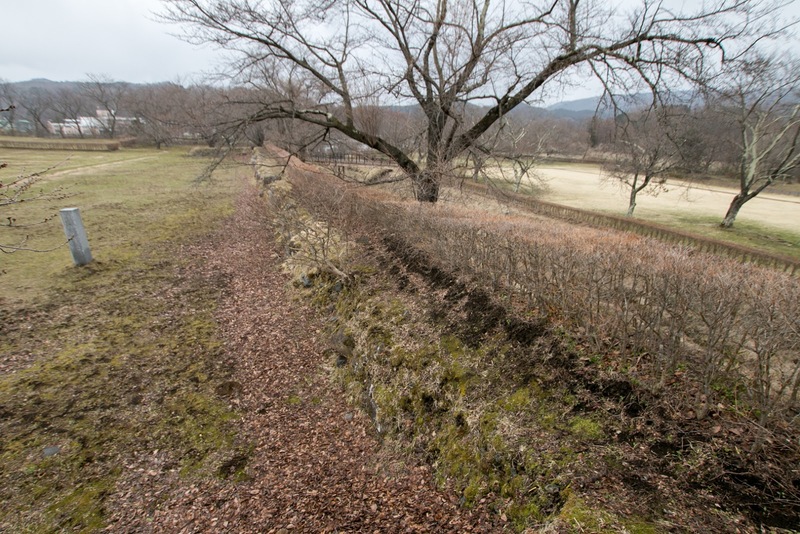 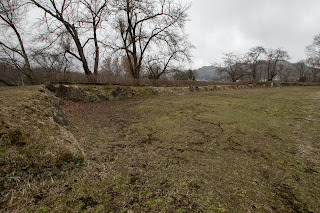 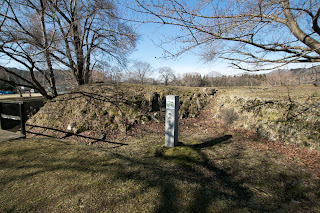 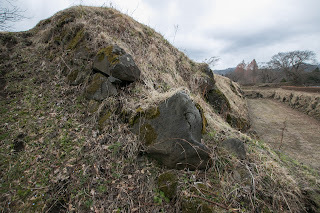 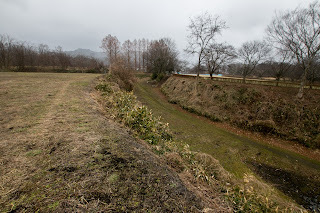 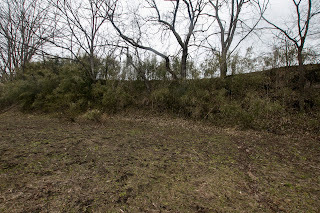 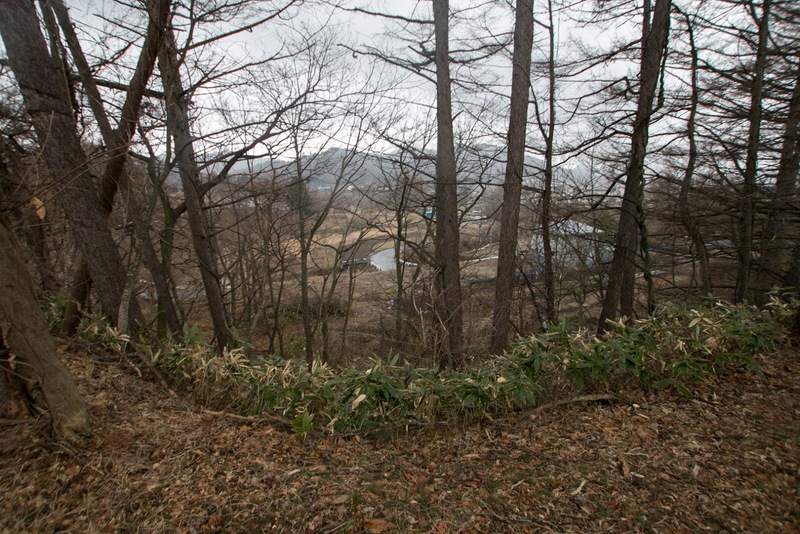 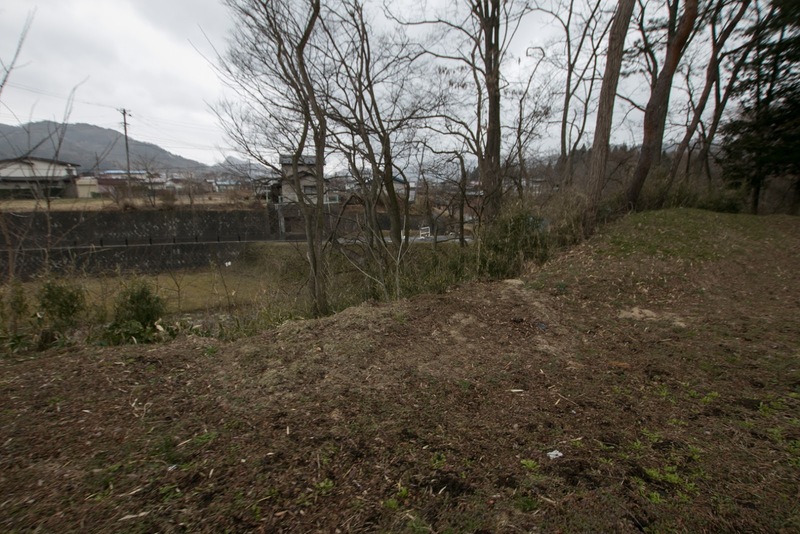 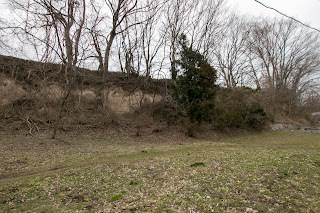 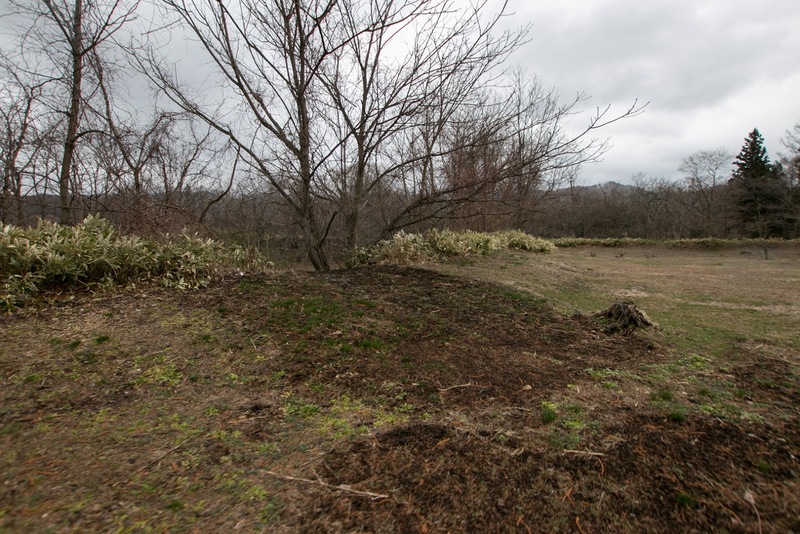 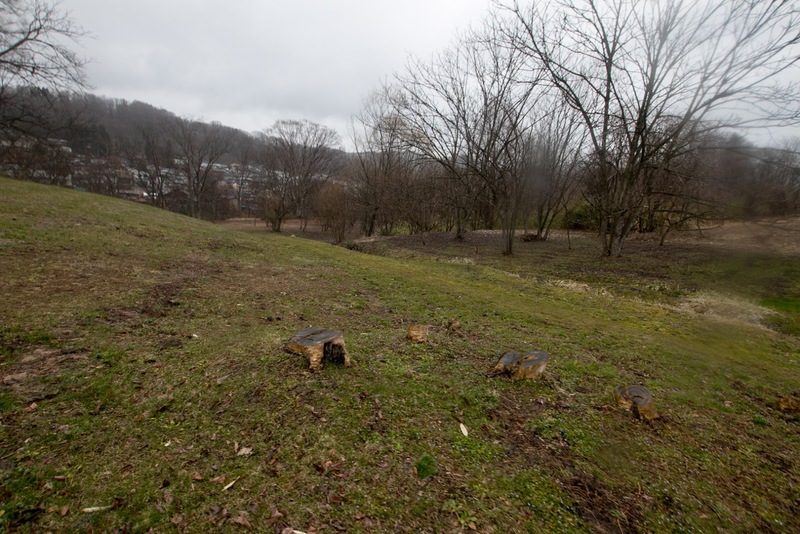 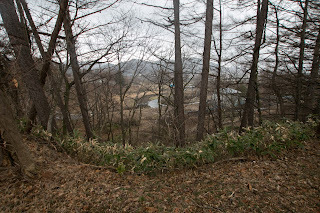 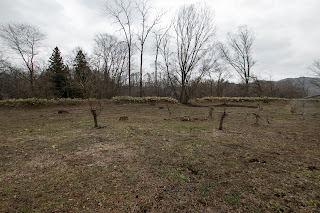 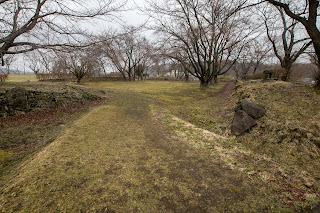 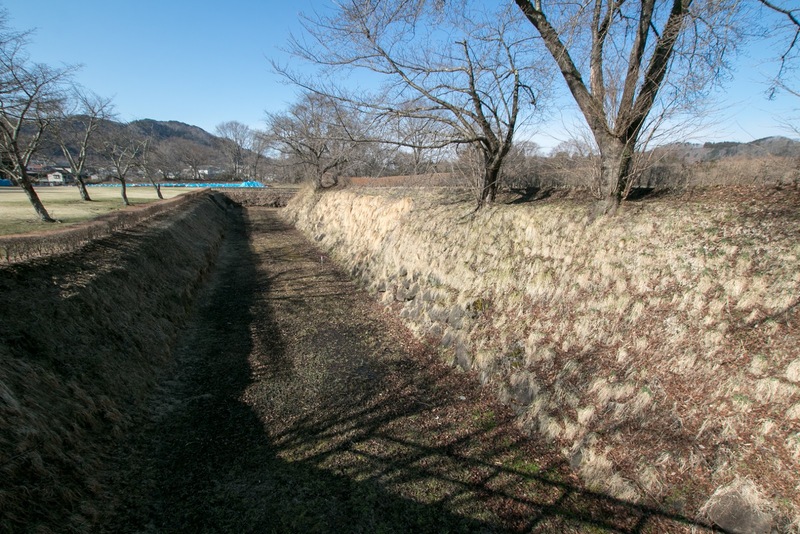 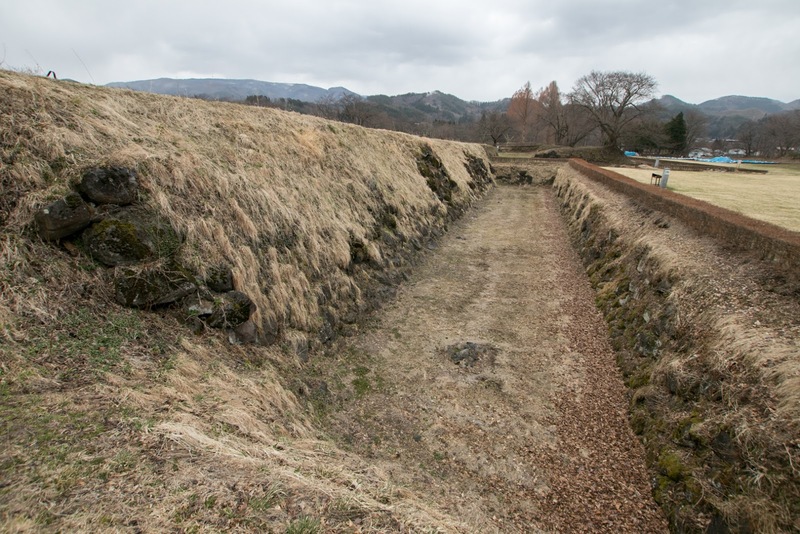 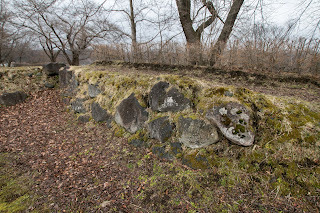 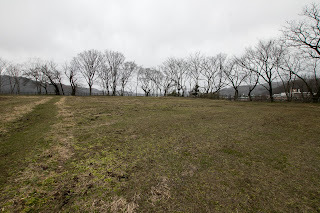 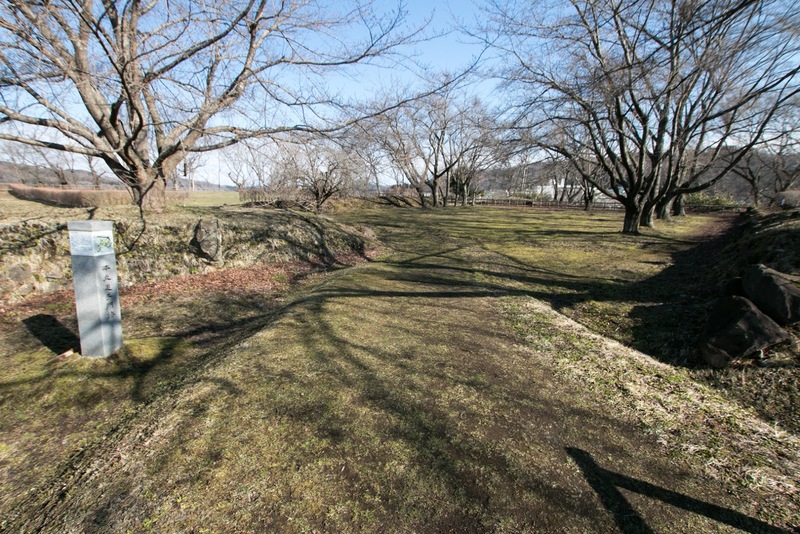 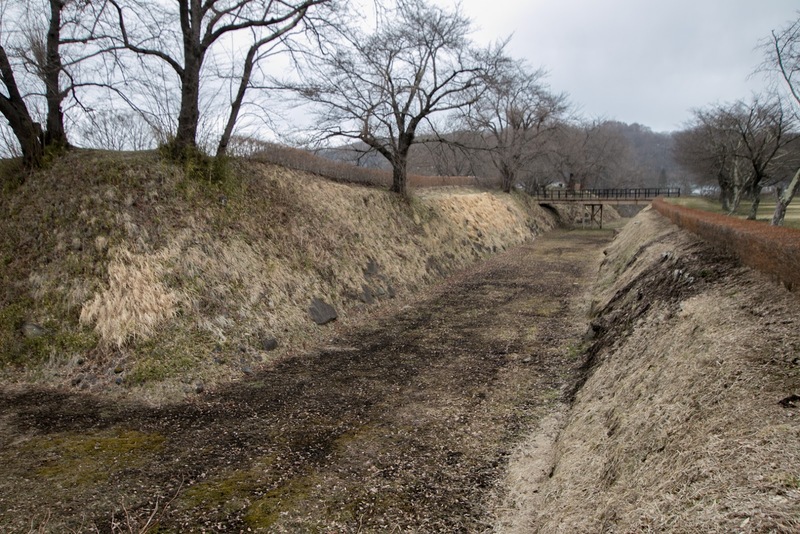 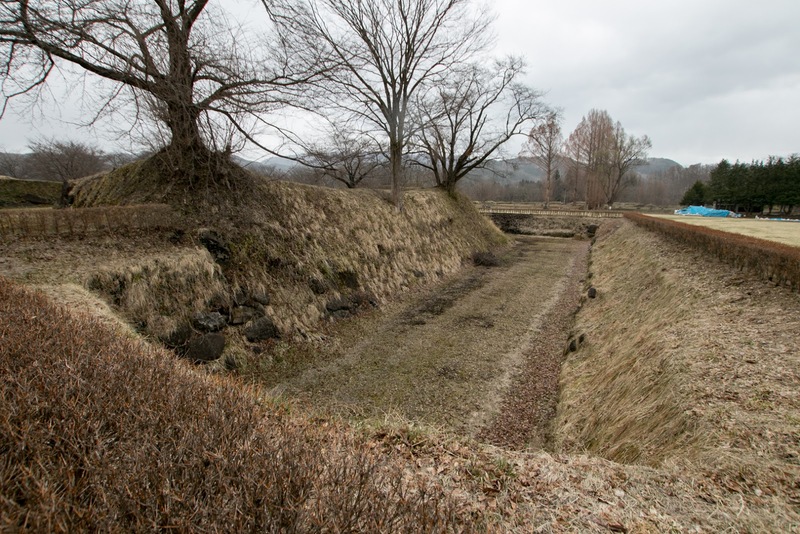 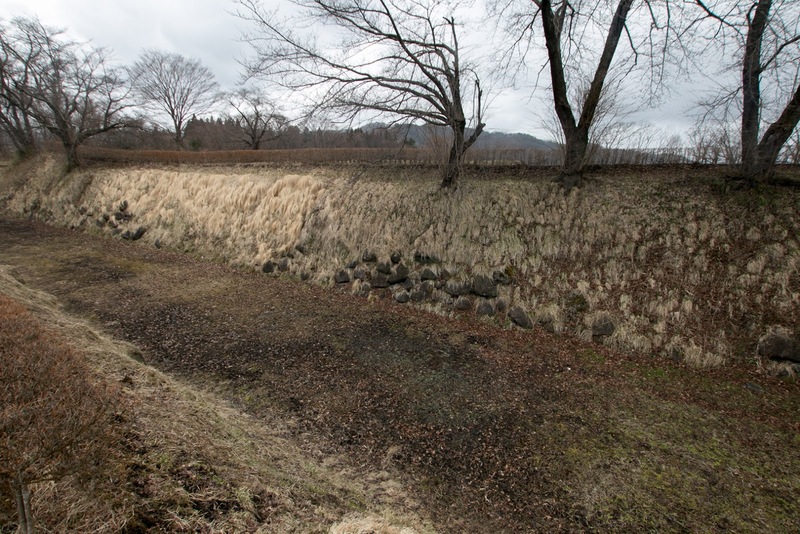 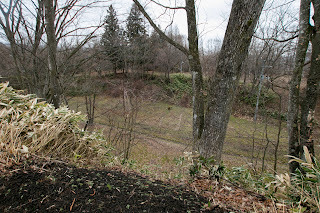 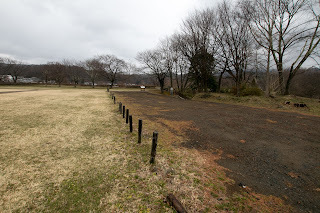 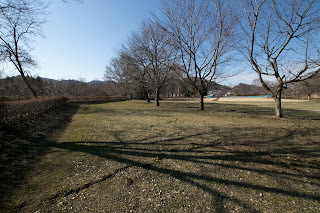 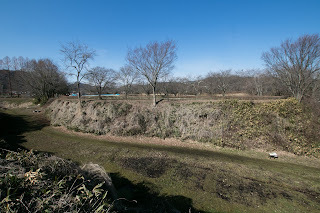 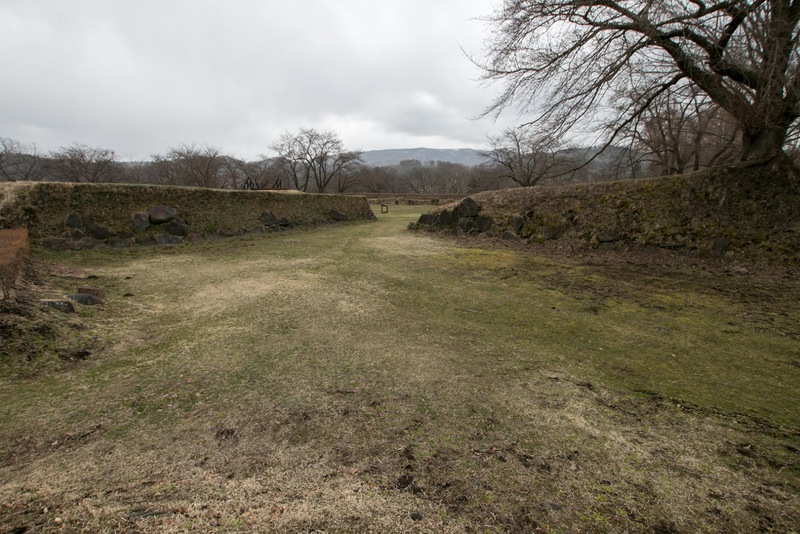 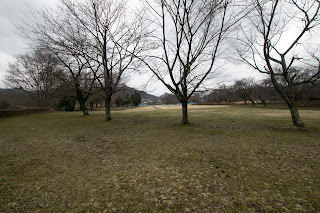 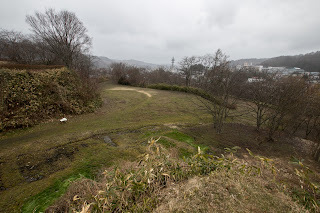 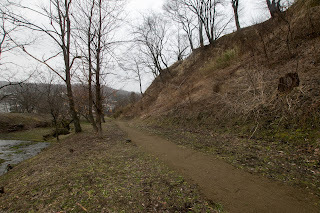 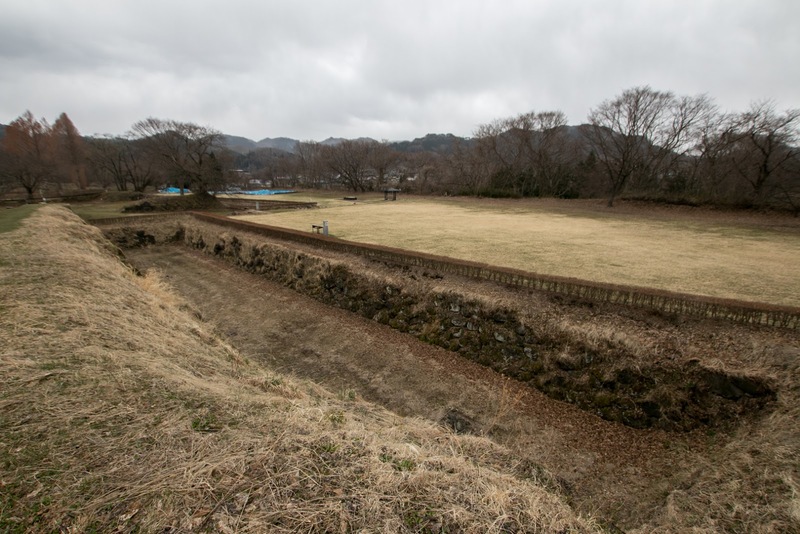 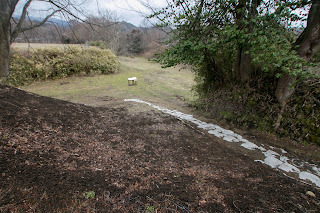 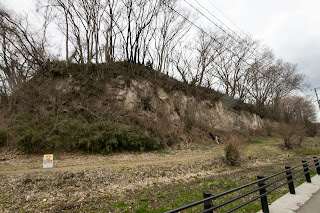 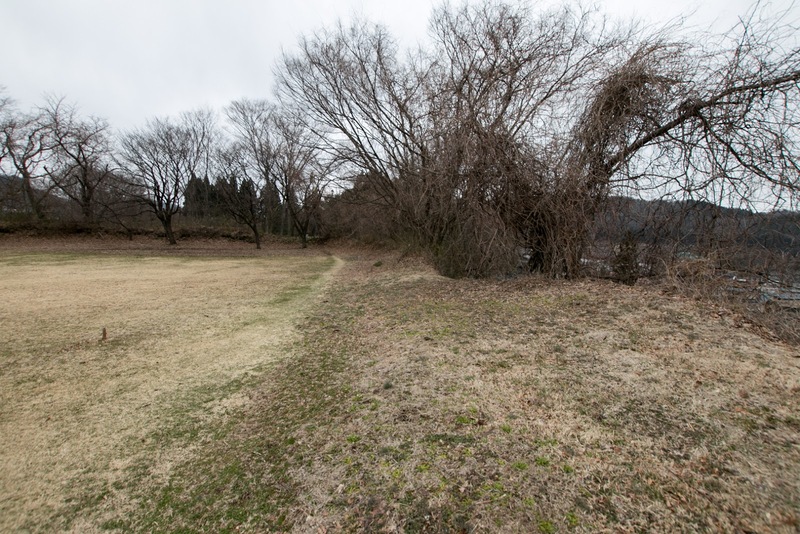 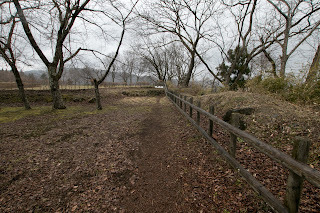 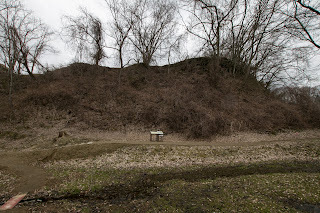 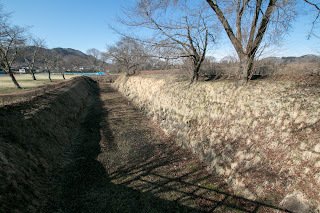 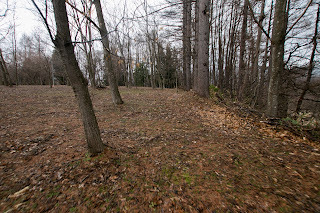 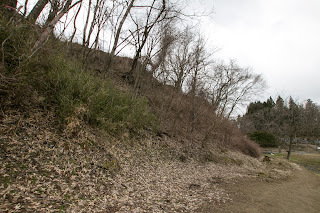 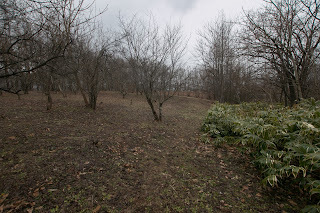 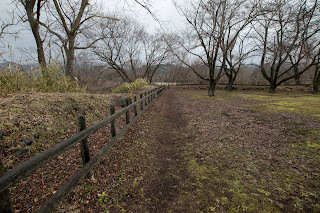 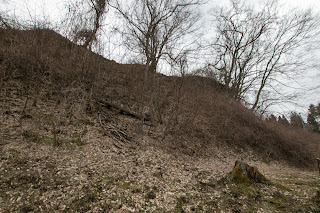 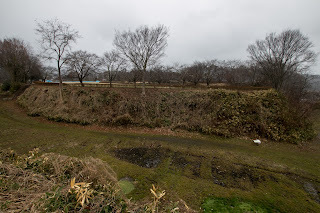 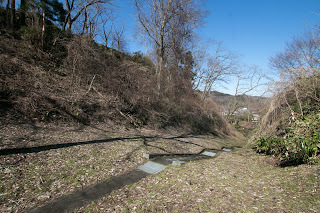 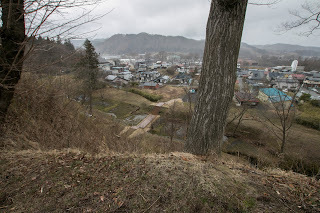 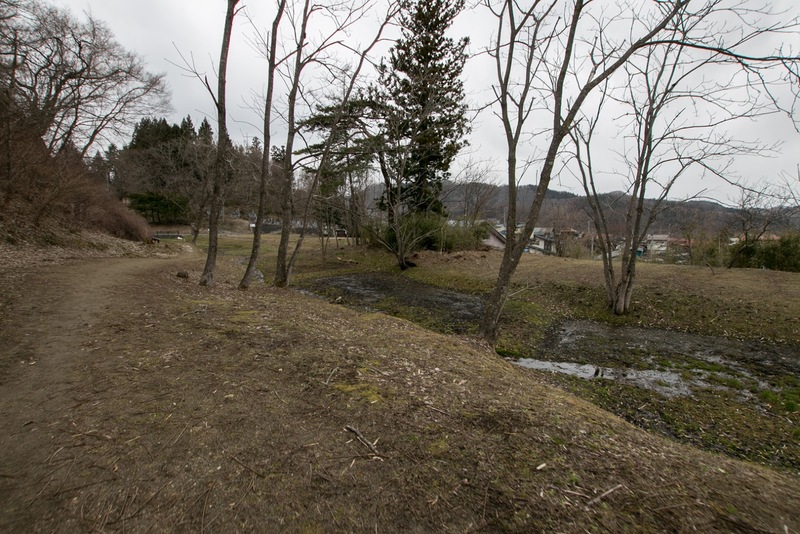 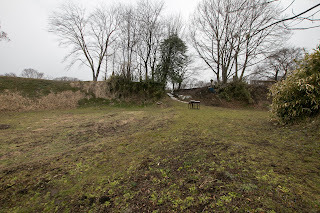 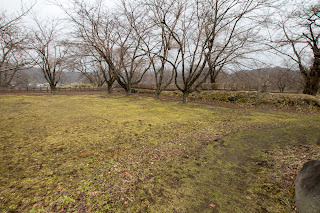 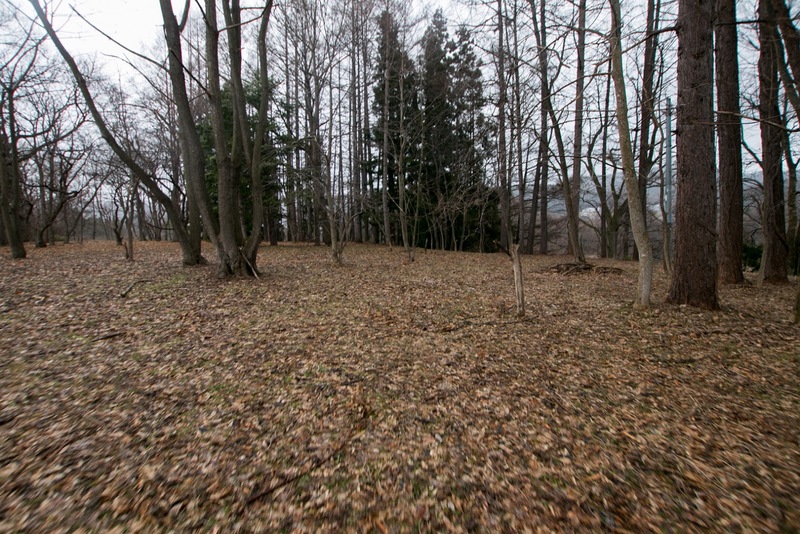 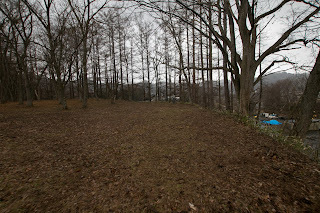 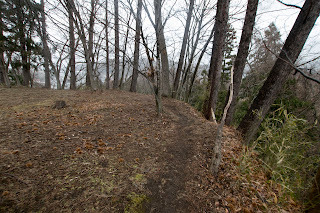 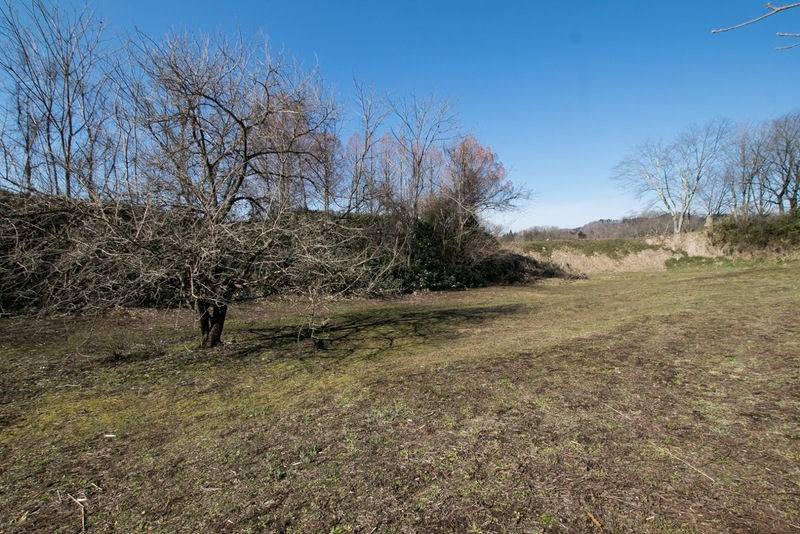 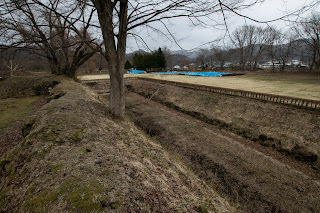 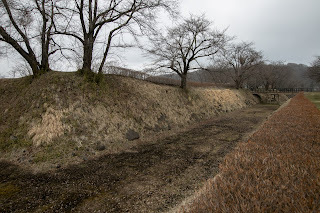 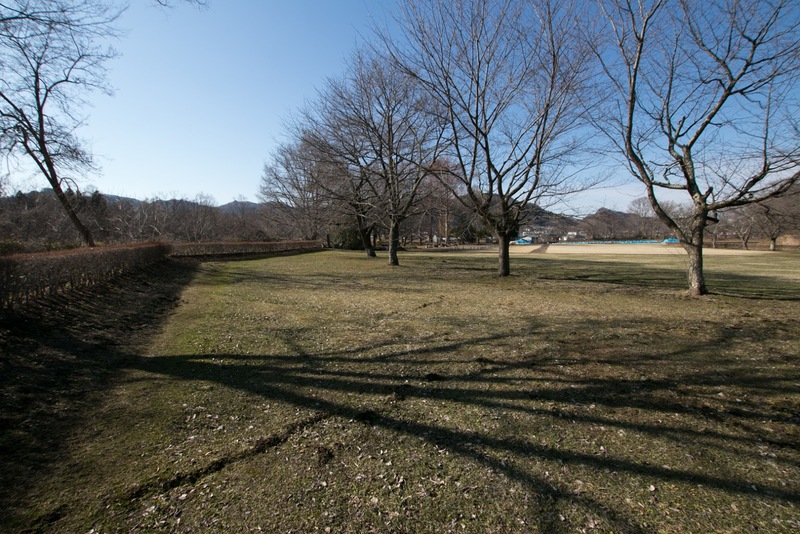 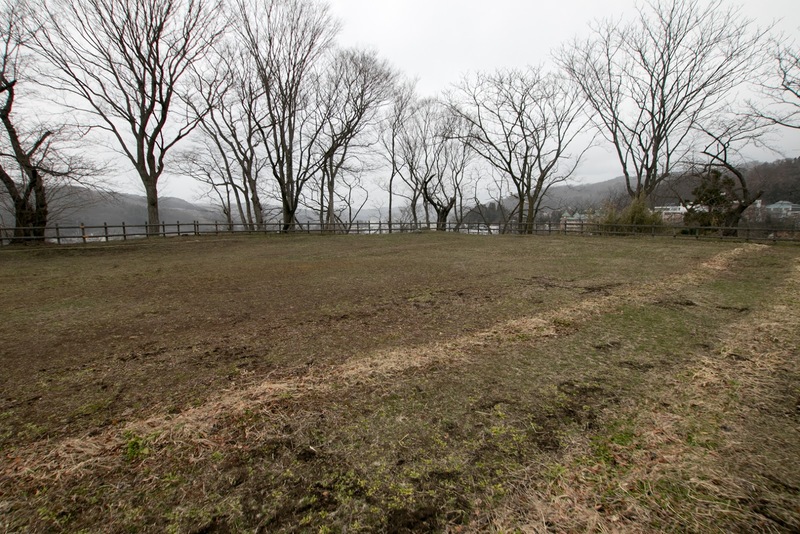 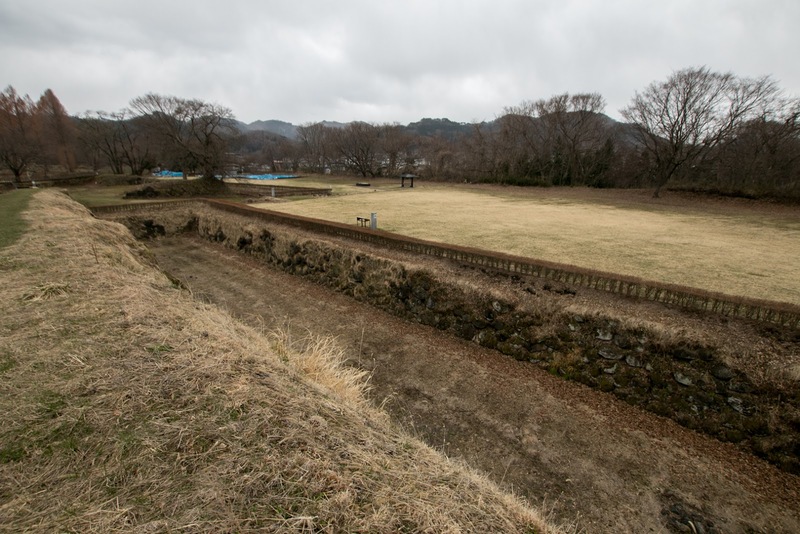 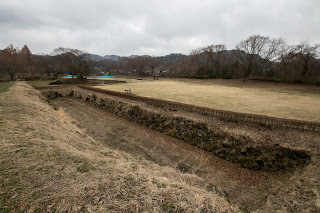 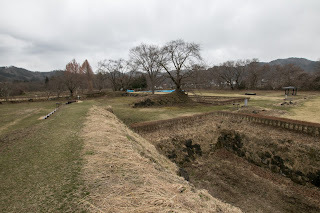 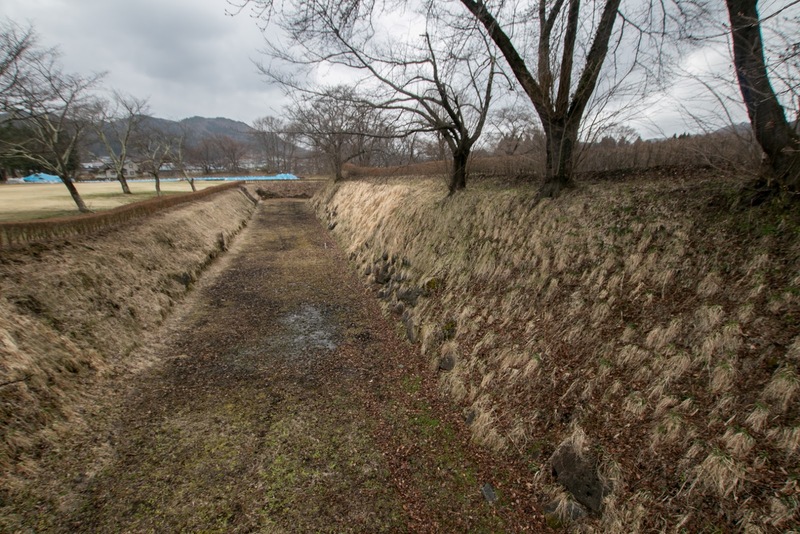 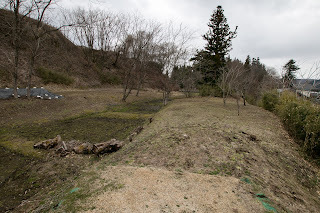 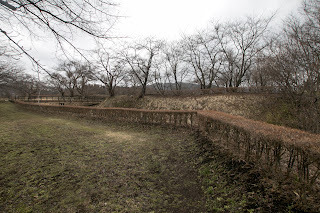 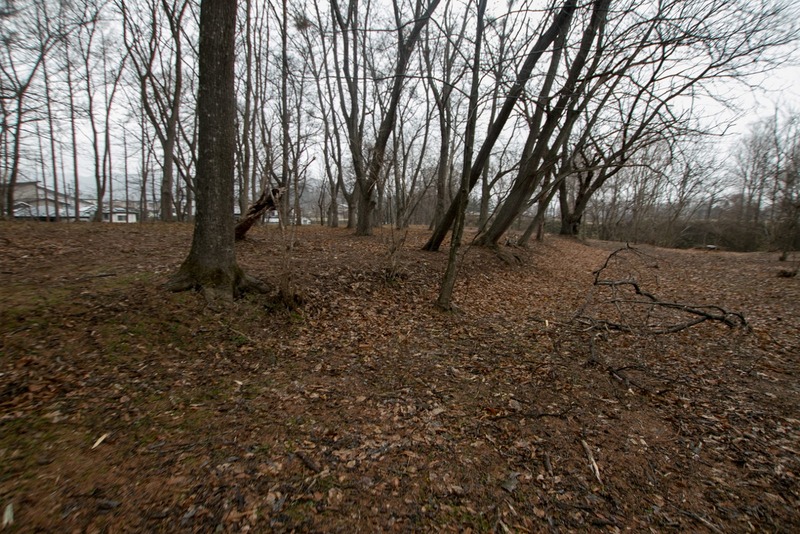 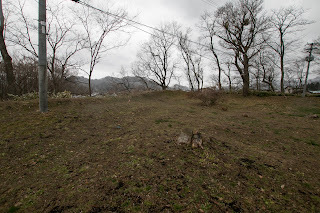 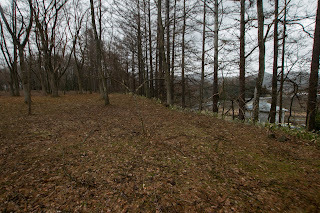 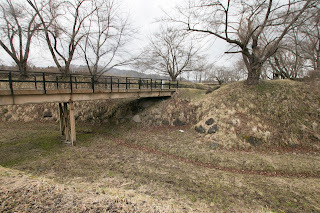 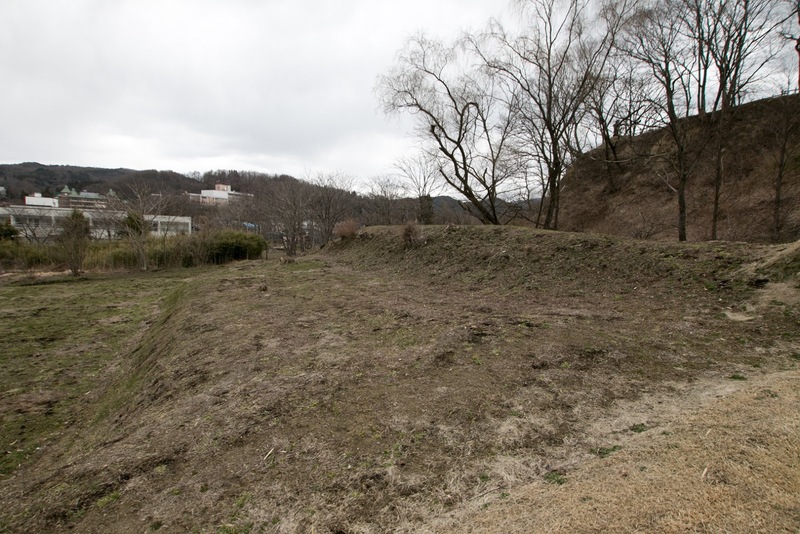 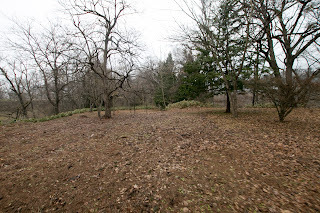 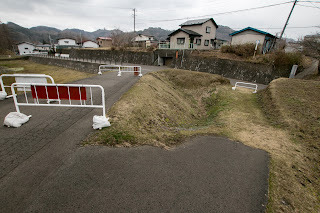 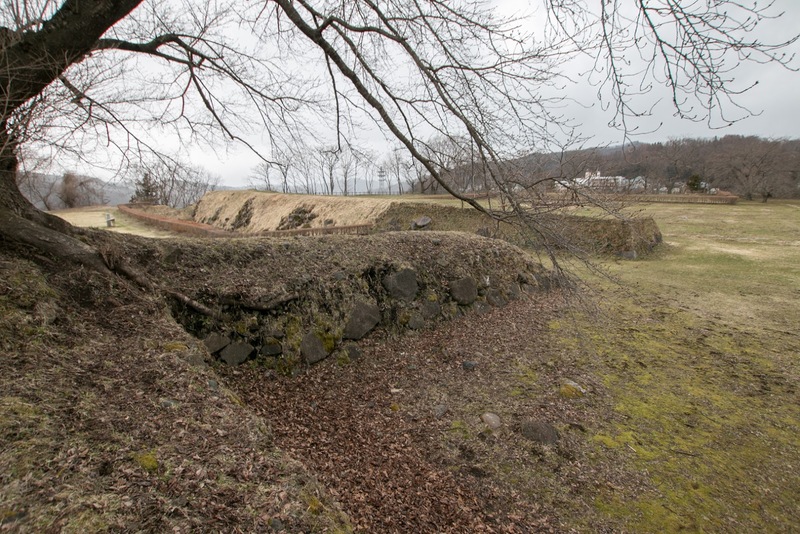 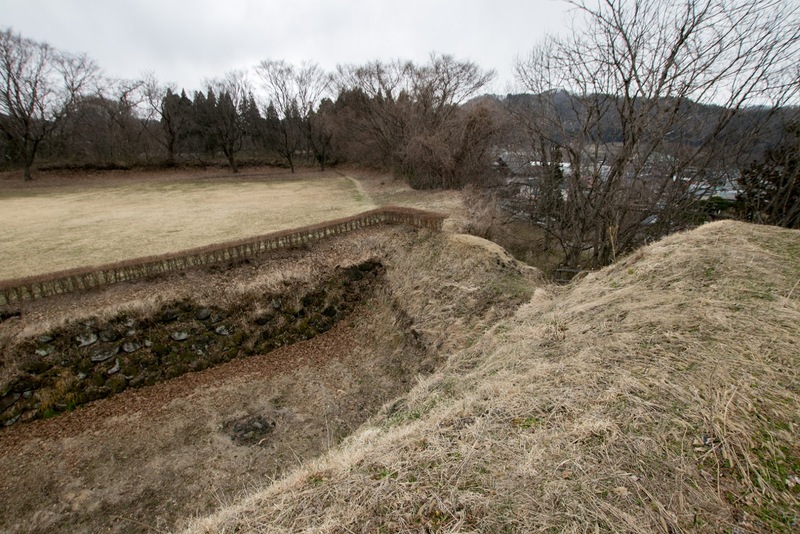 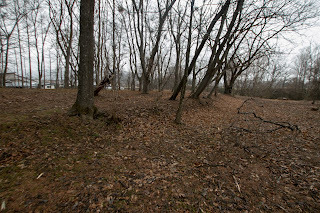 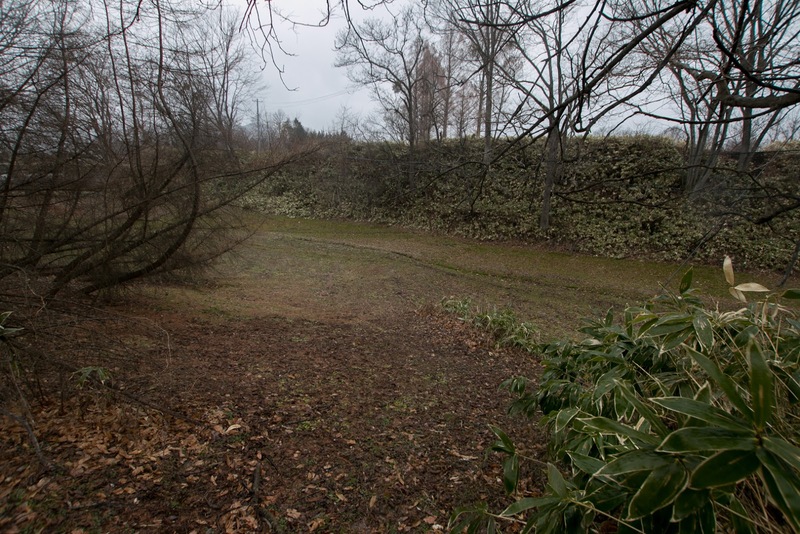 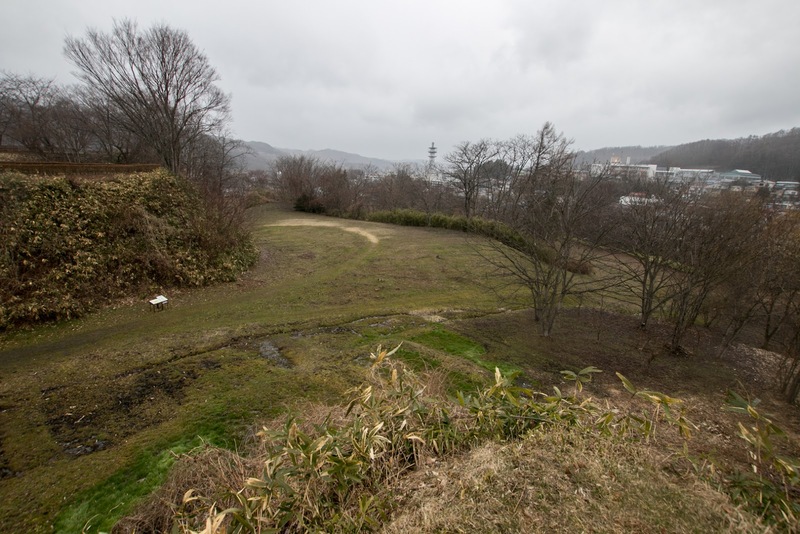 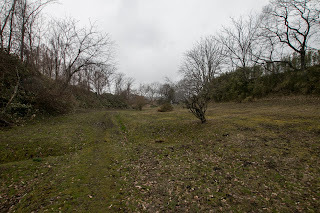 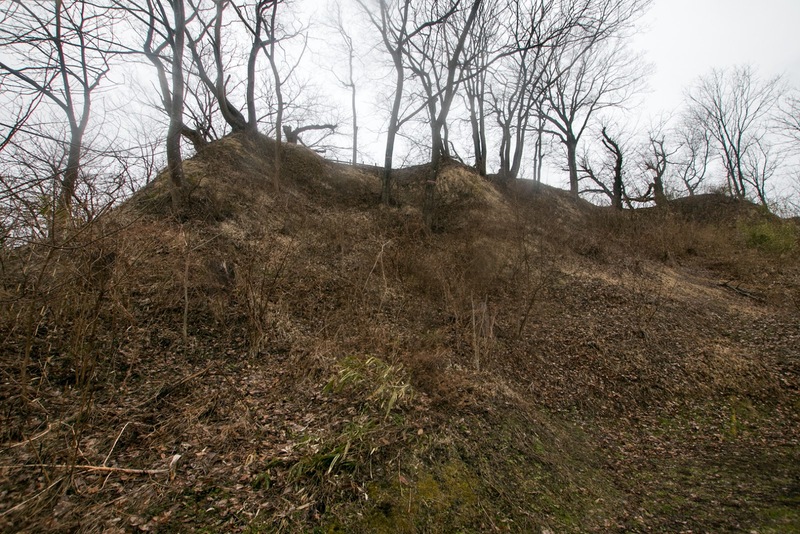 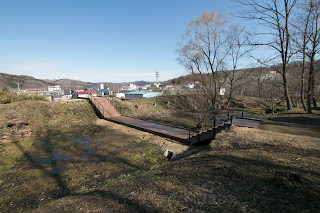 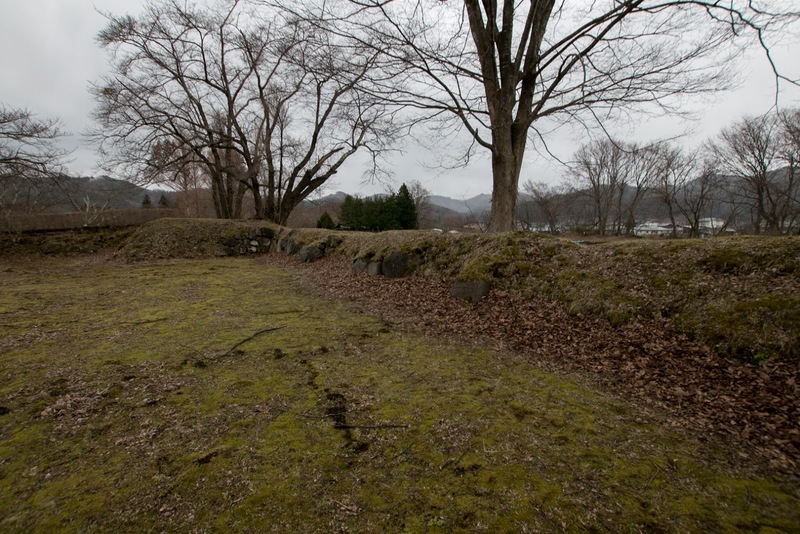 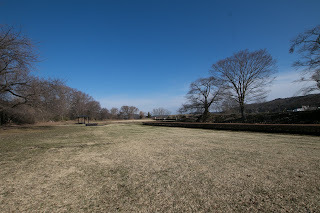 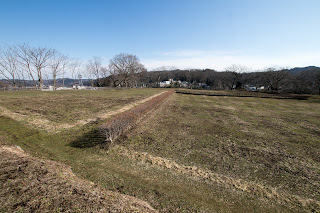 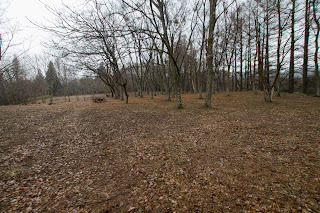 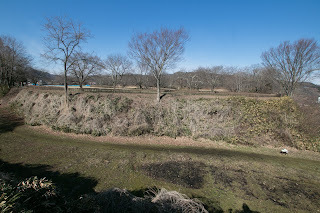 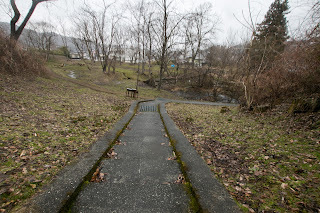 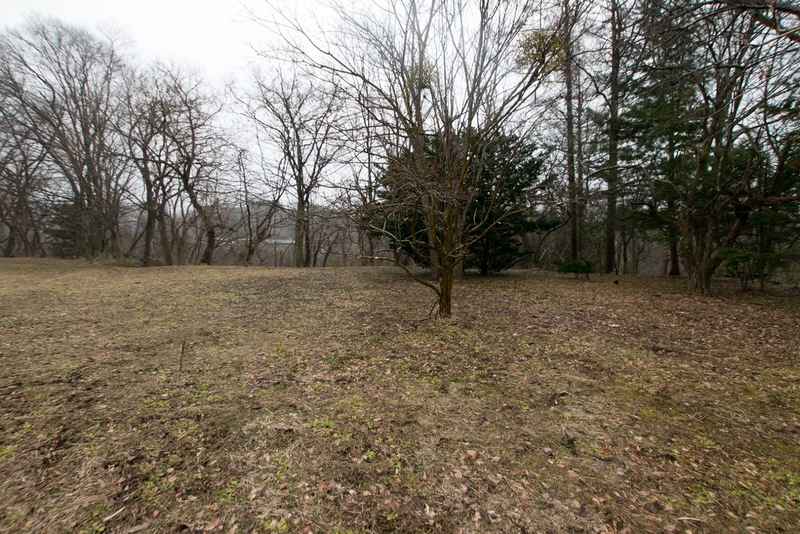 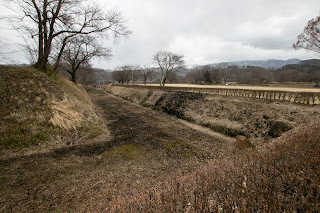 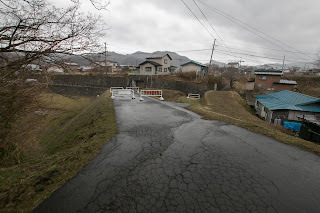 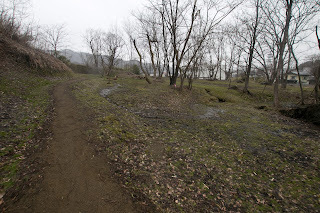 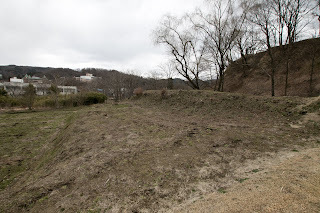 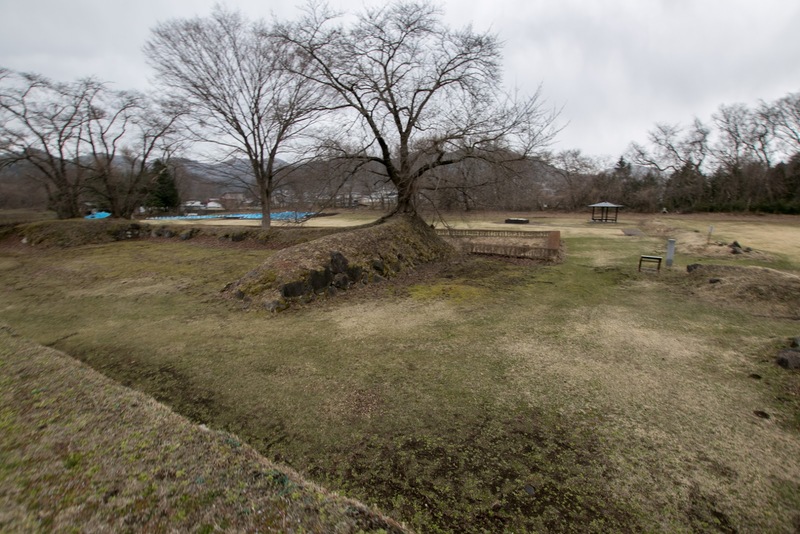 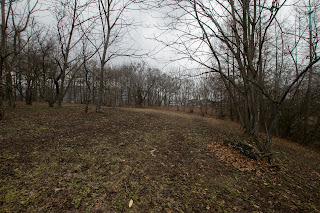 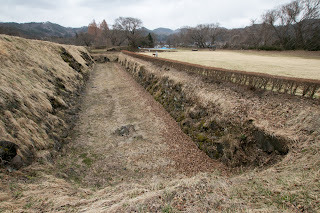 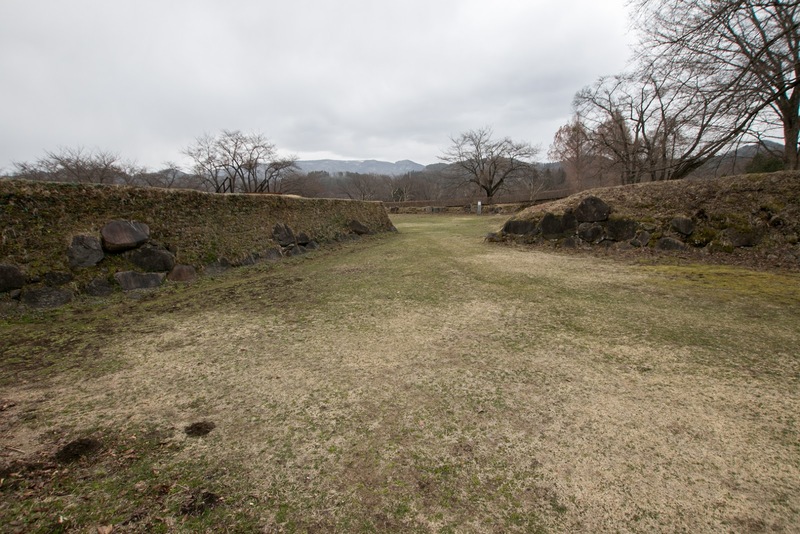 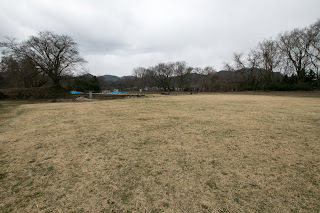 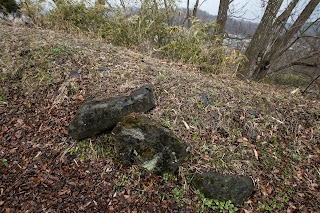 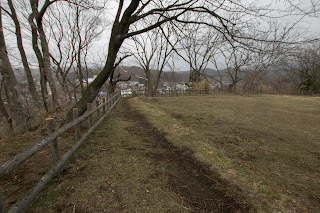 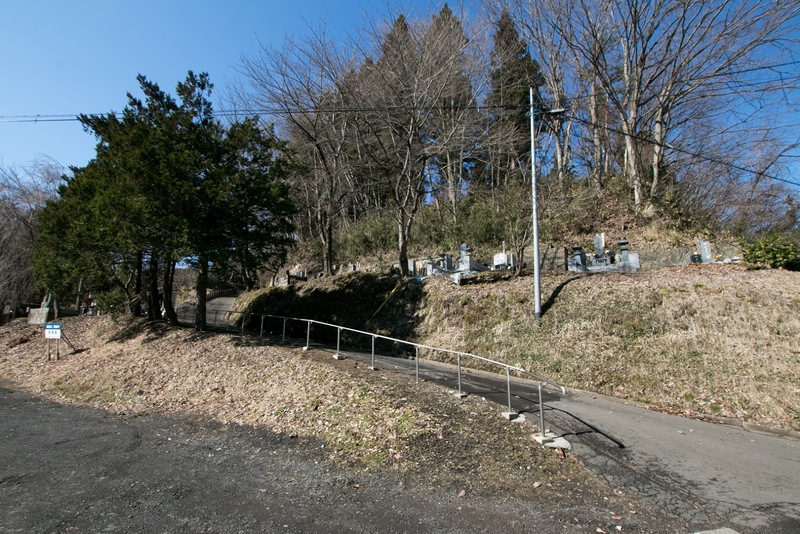 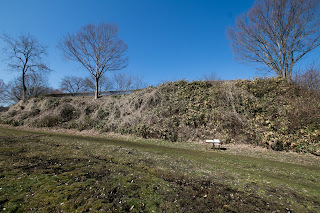 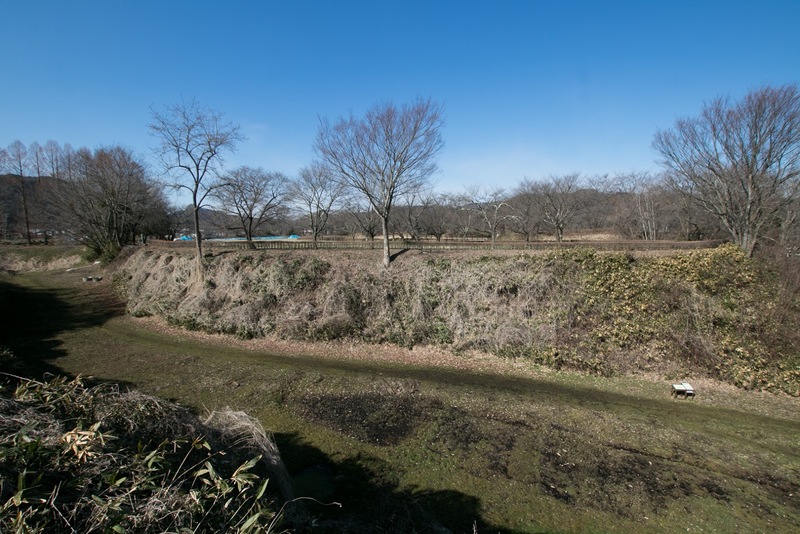 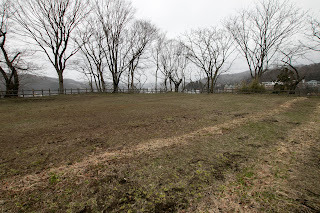 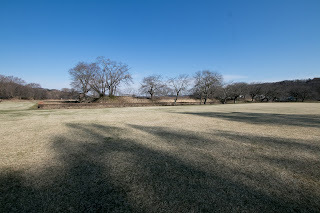 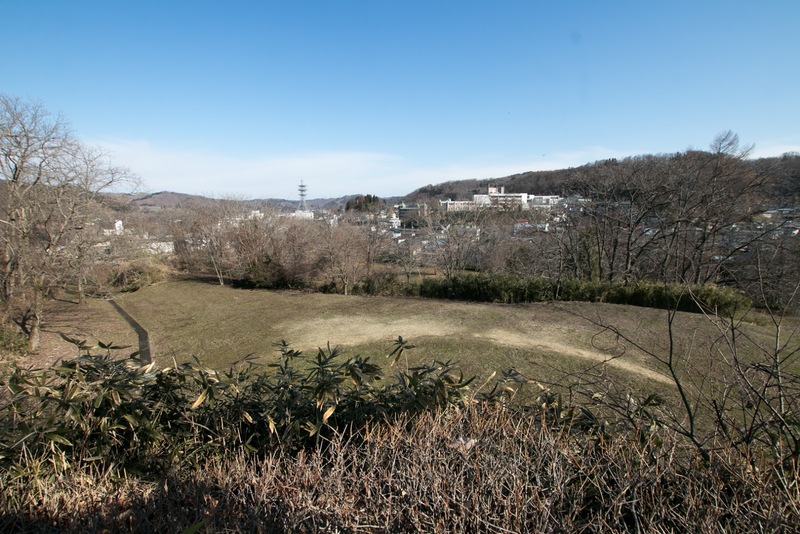 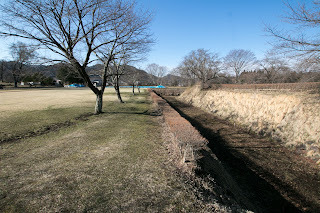 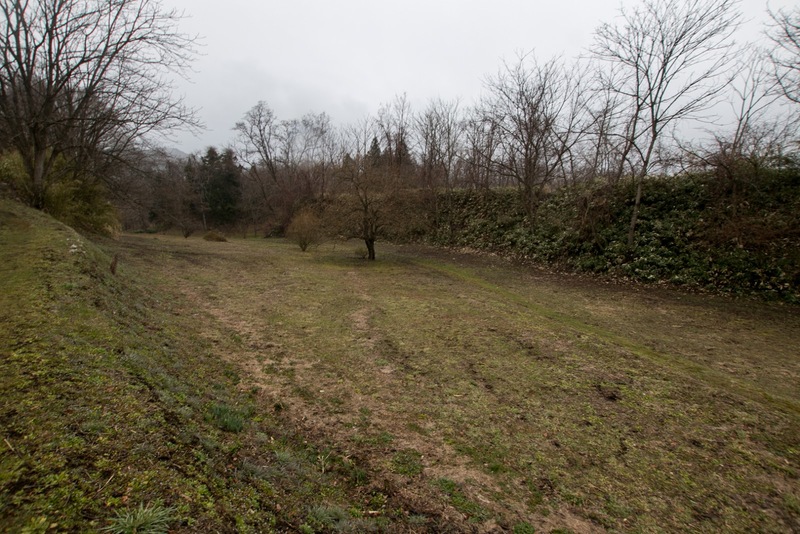 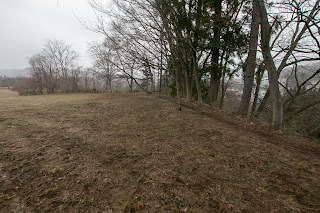 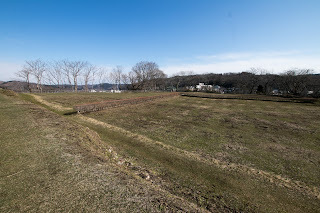 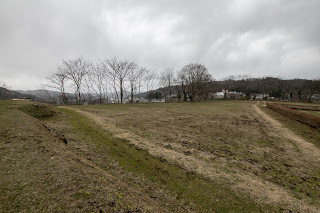 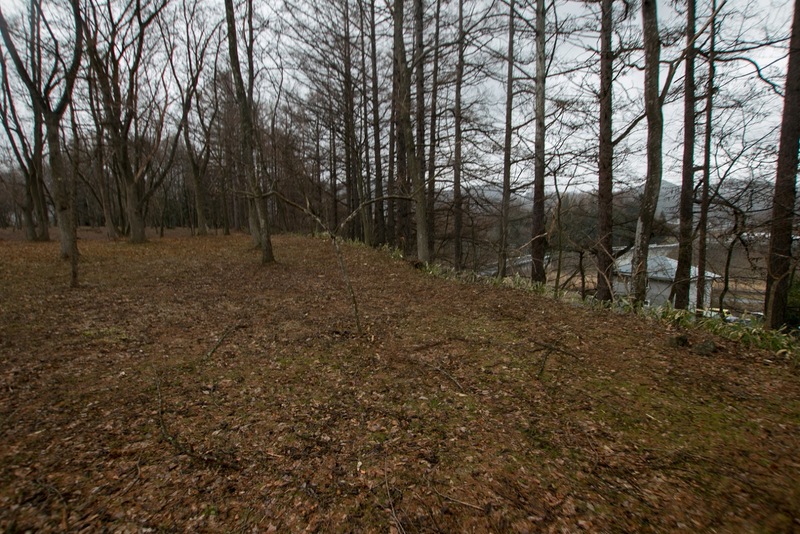 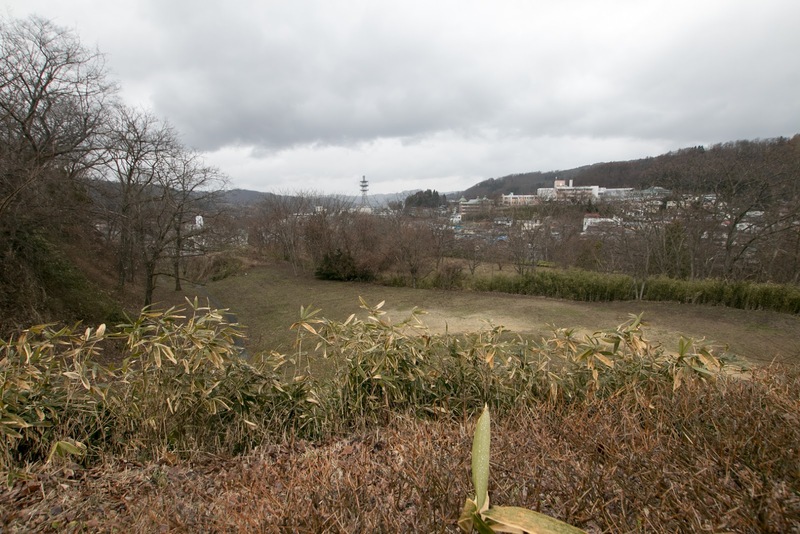 As east side of the castle was divided by tributary of Shiratorivawa river, three dimension of the castle was protected by river and valley and only south front connected to the terrace. Precisely it is a suitable place to build a castle. 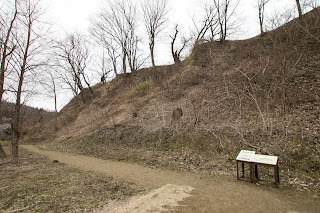 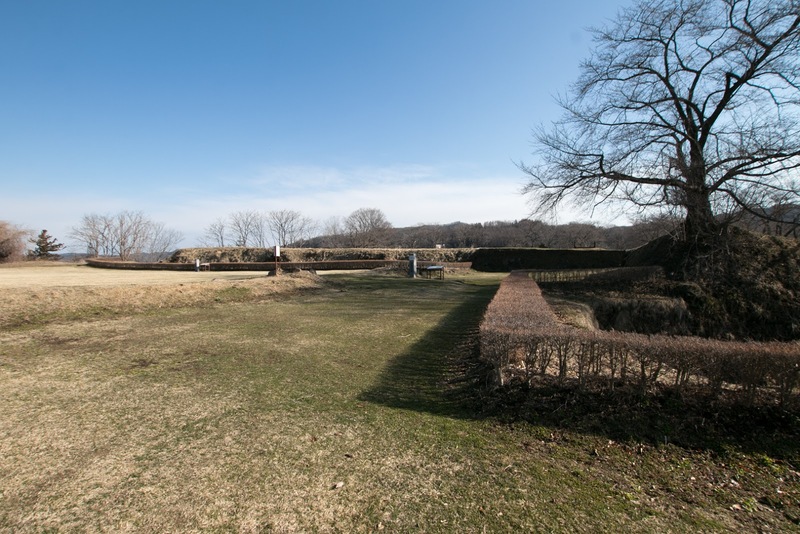 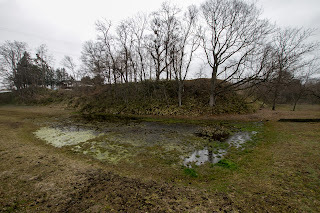 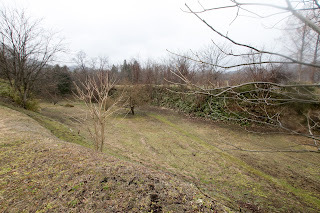 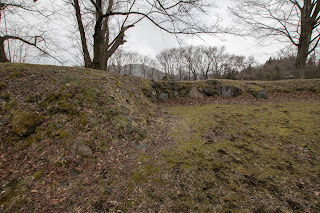 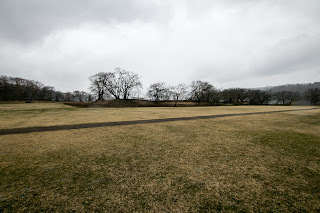 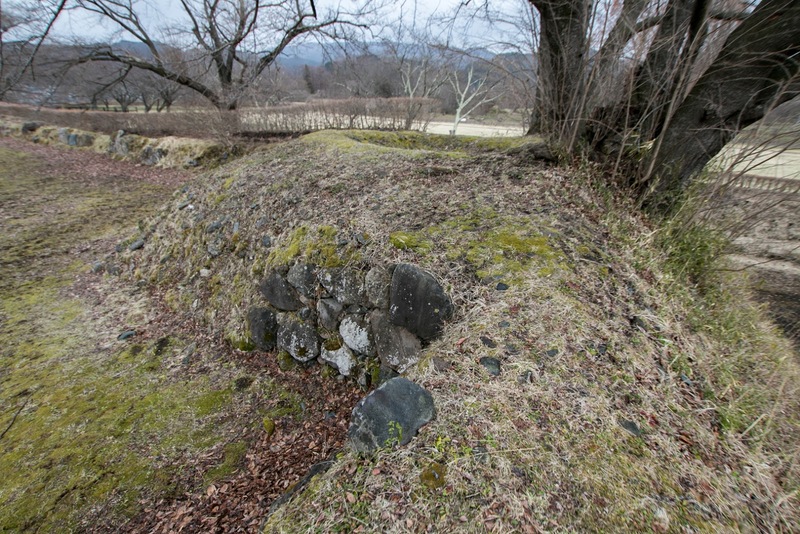 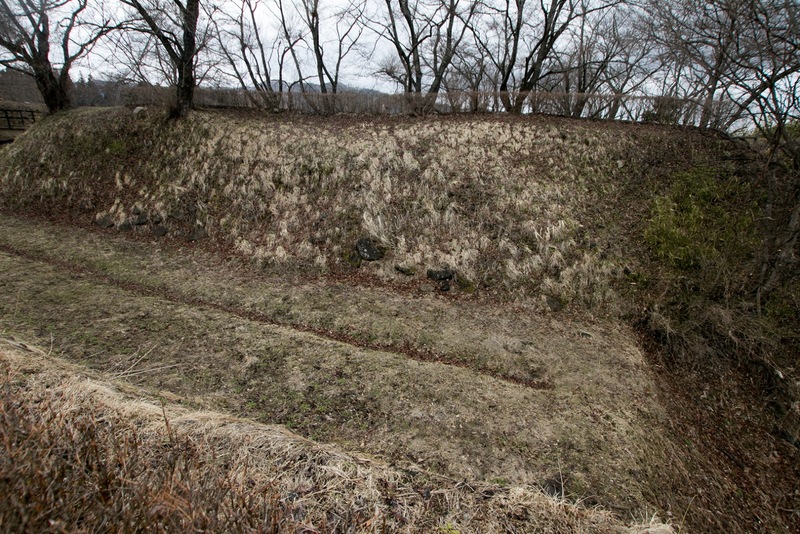 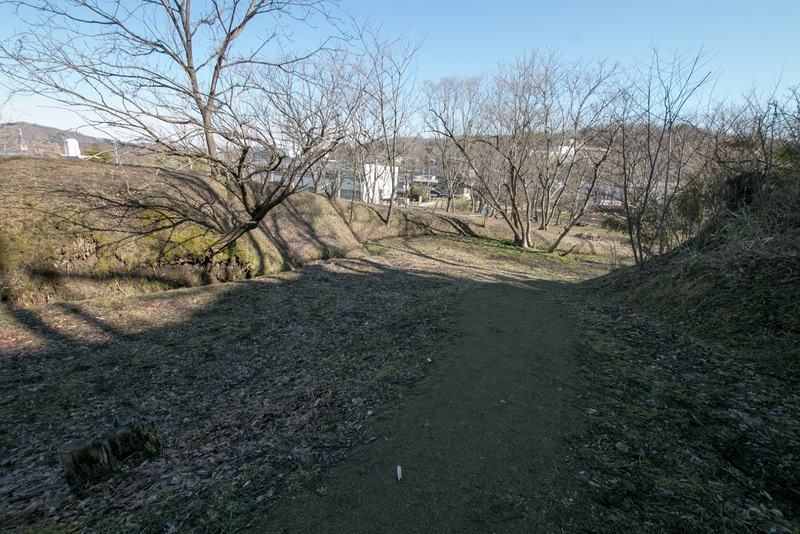 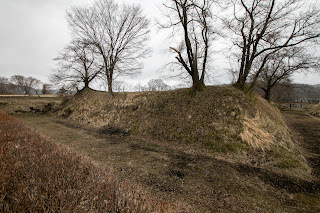 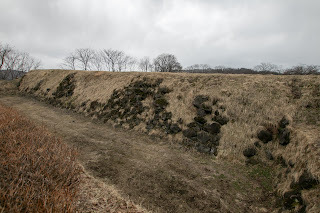 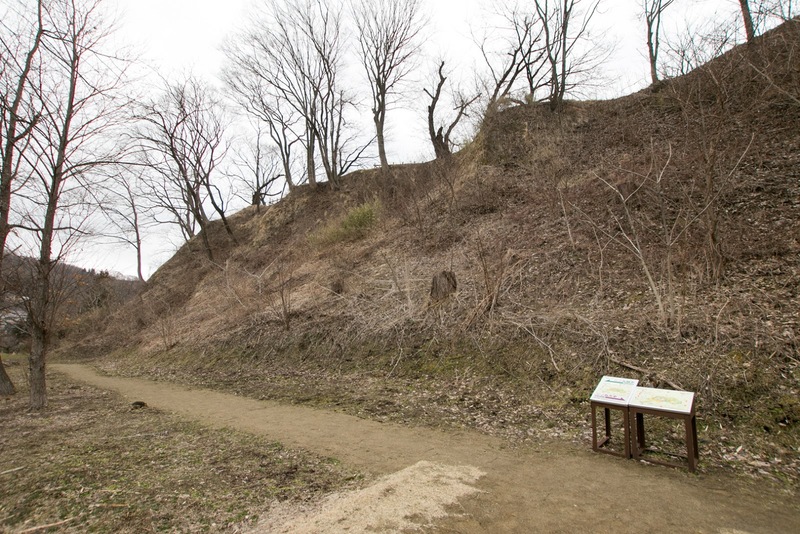 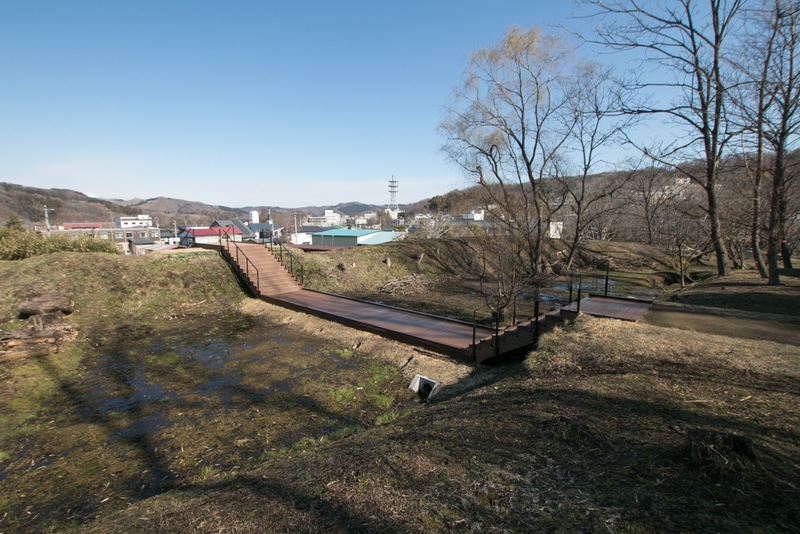 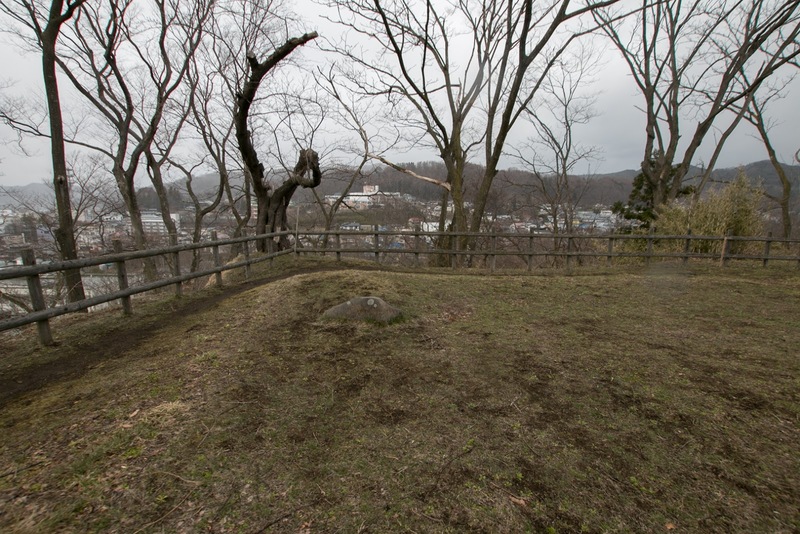 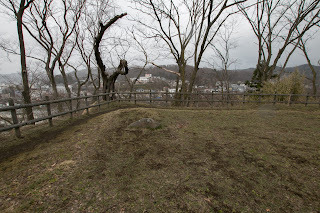 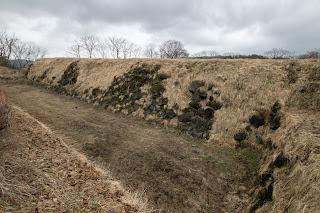 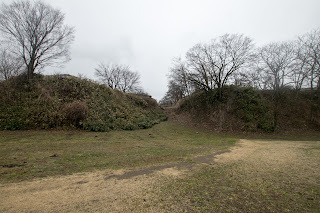 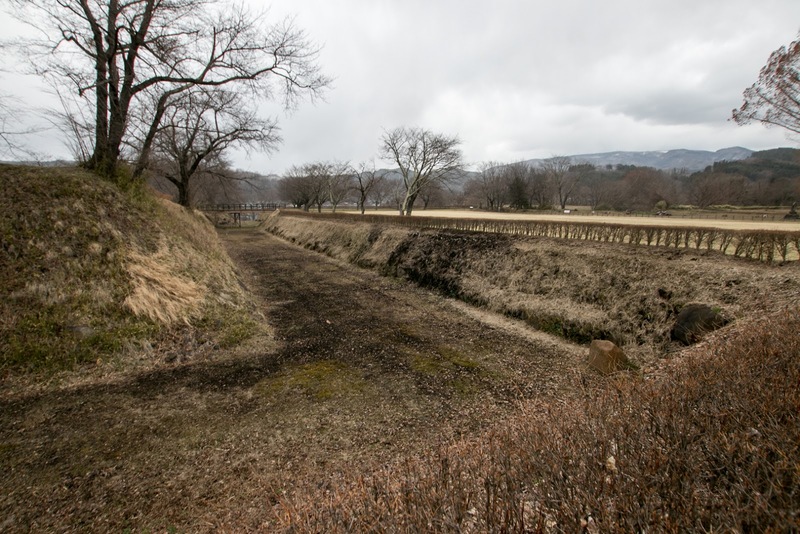 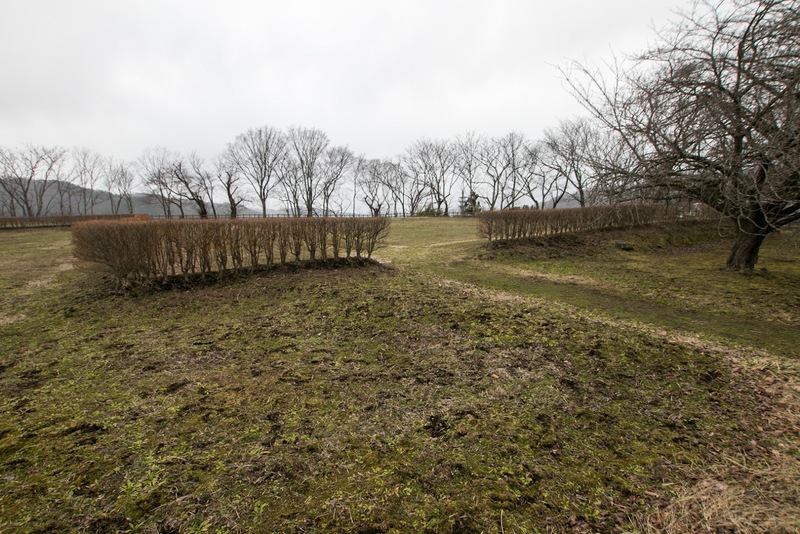 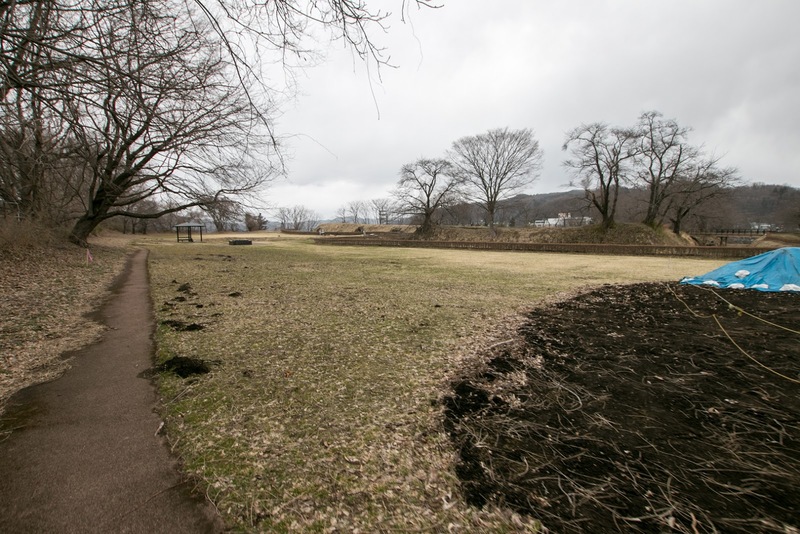 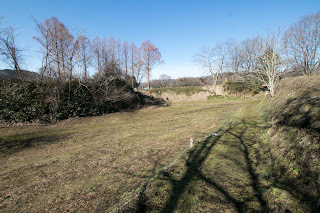 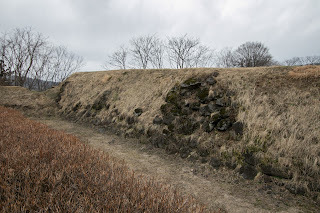 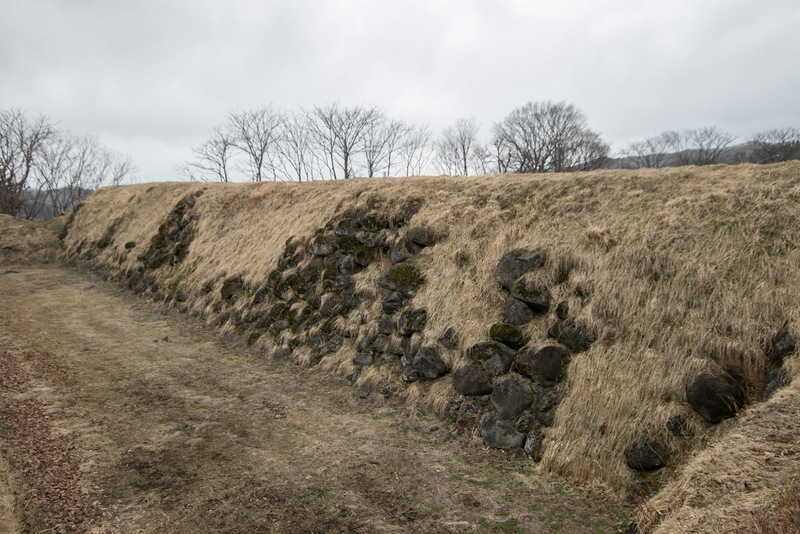 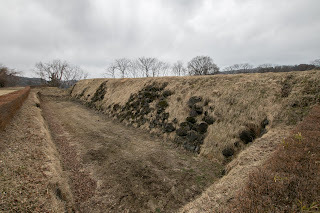 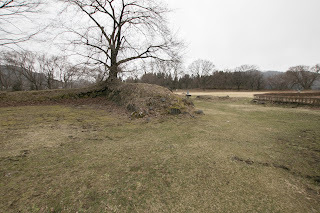 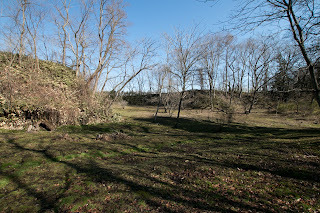 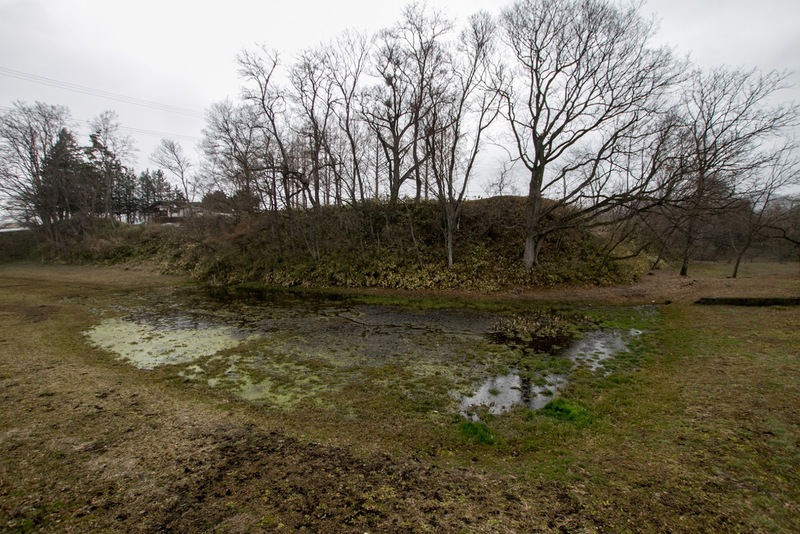 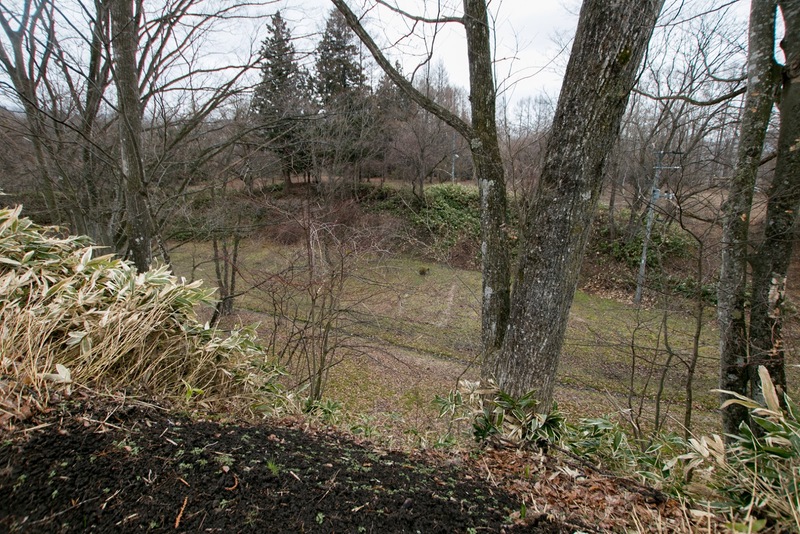 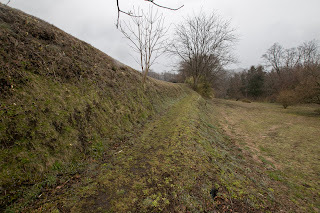 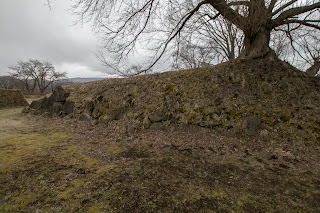 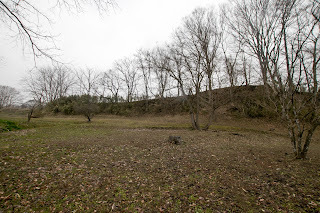 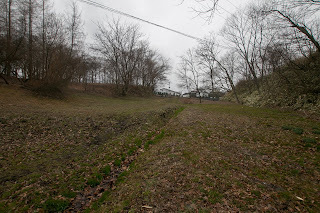 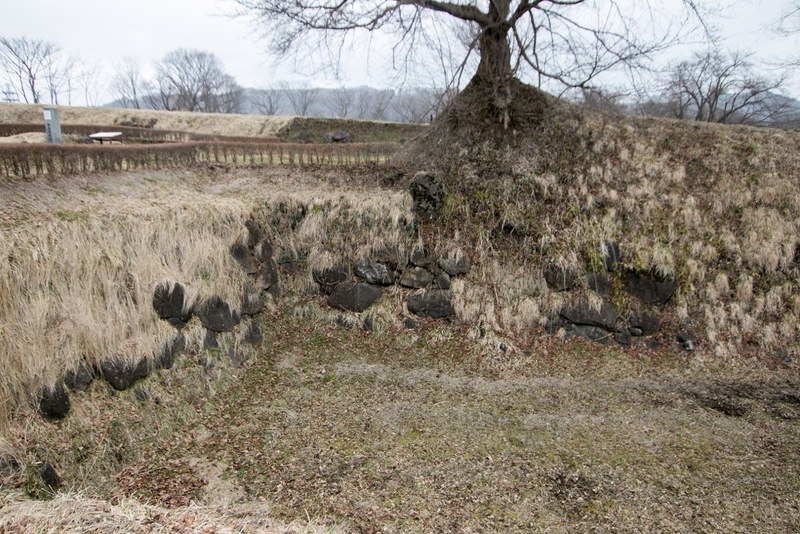 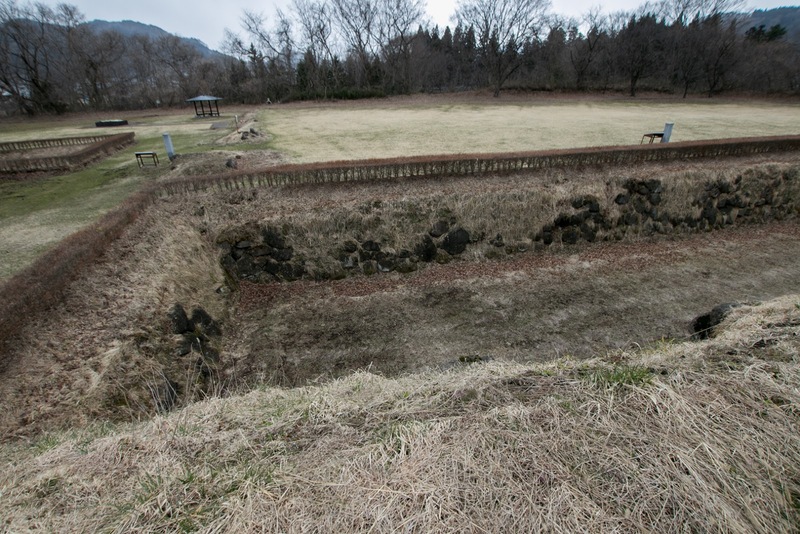 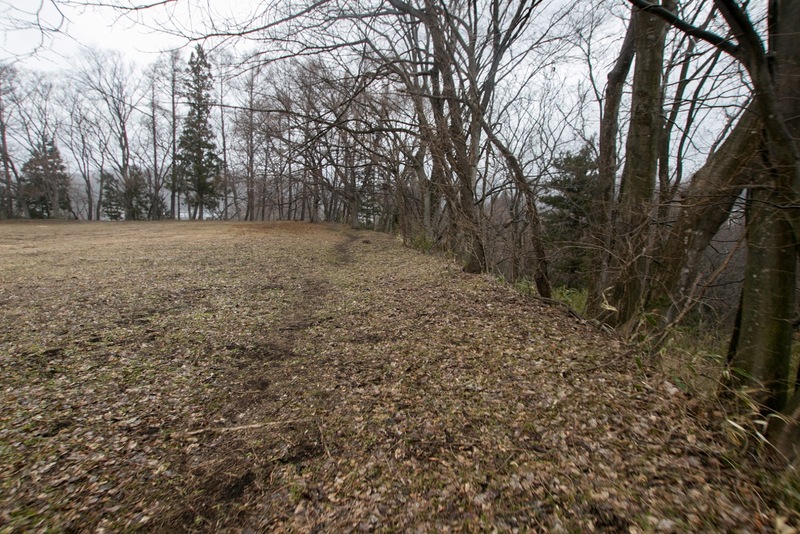 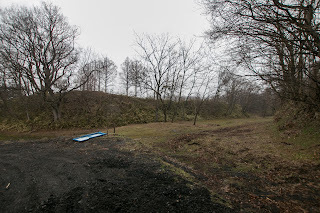 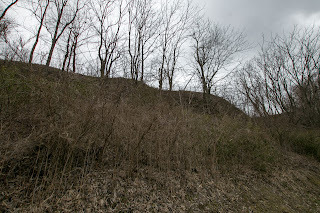 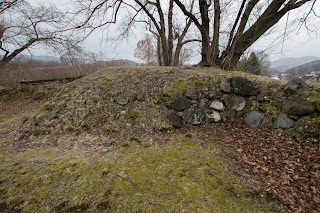 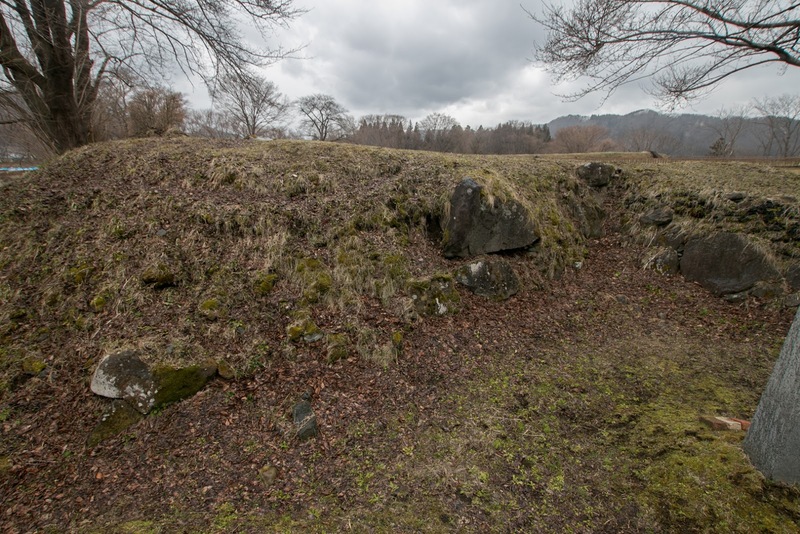 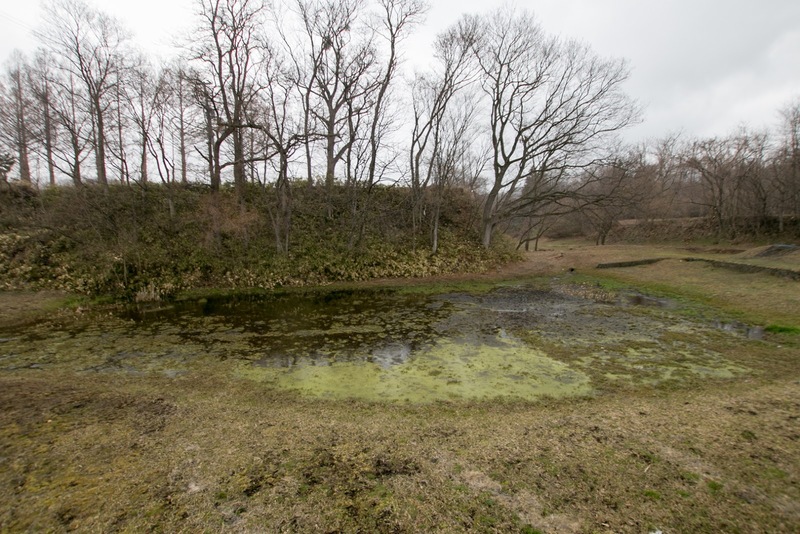 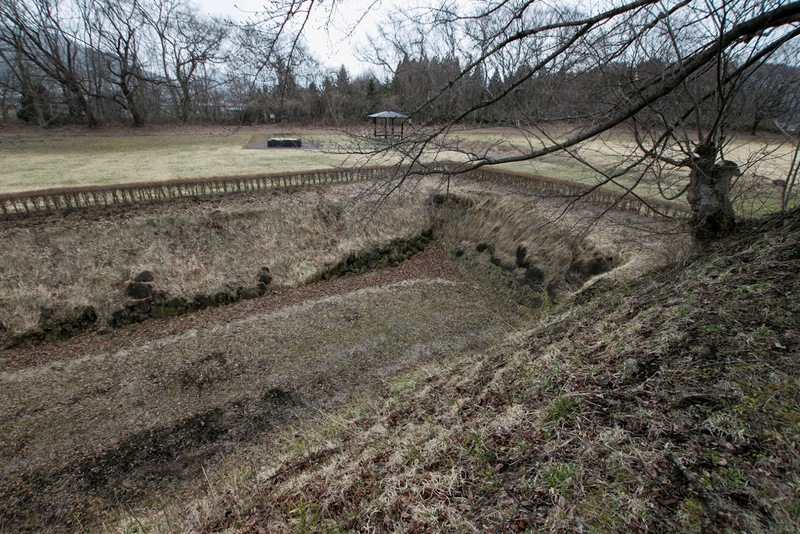 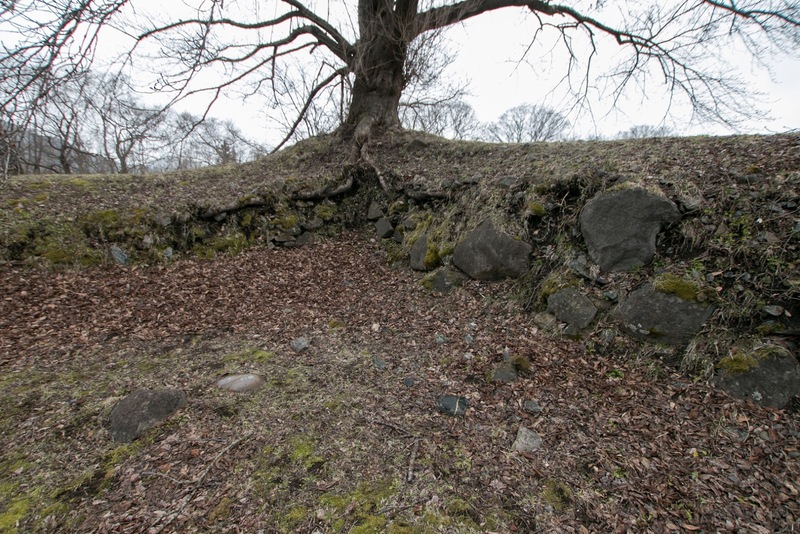 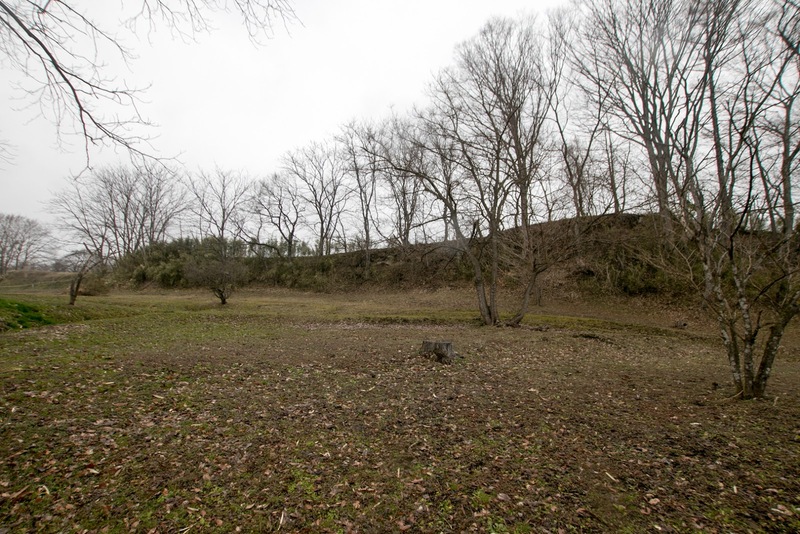 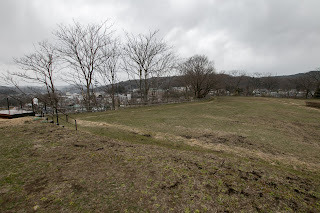 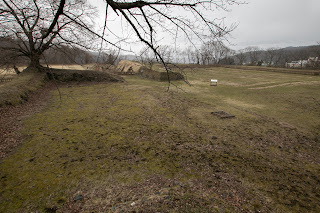 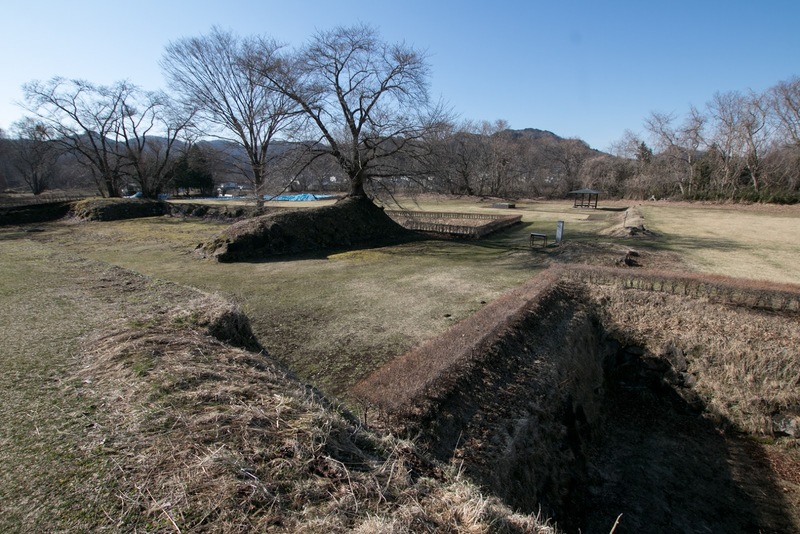 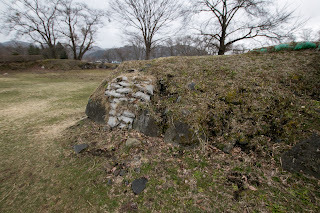 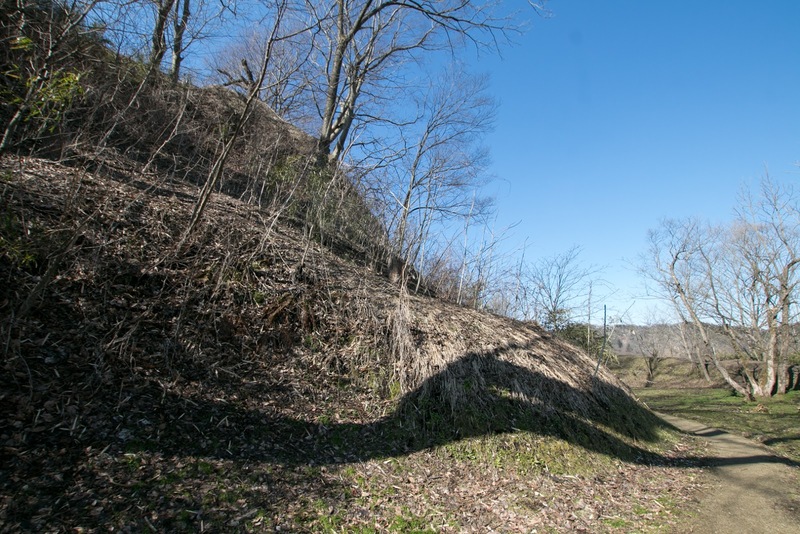 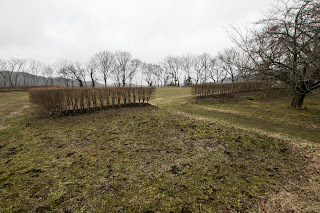 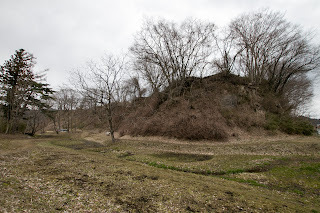 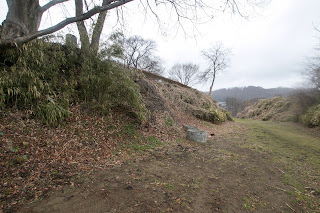 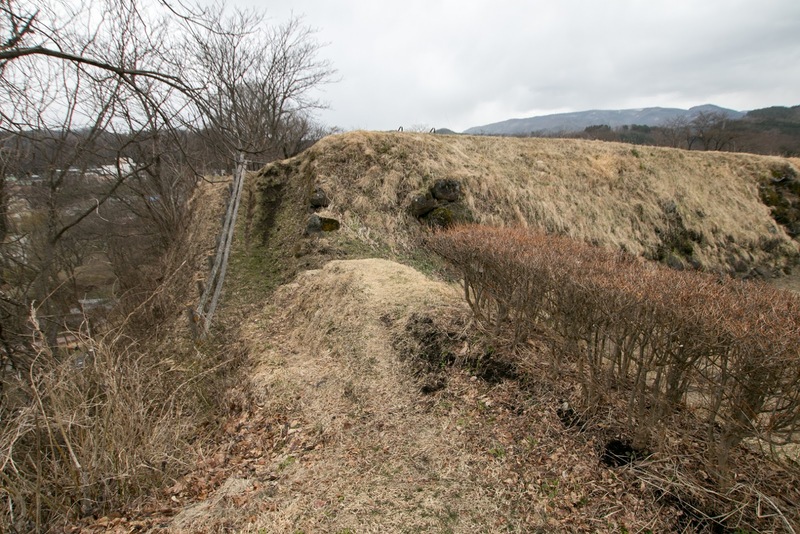 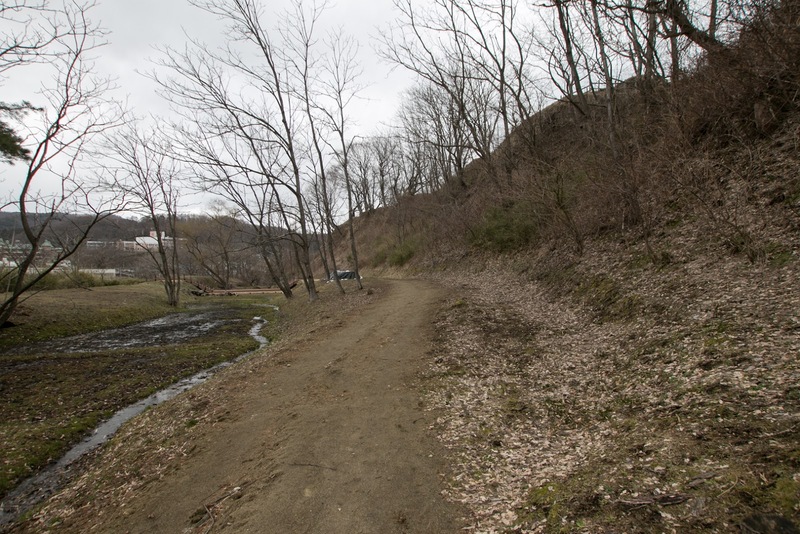 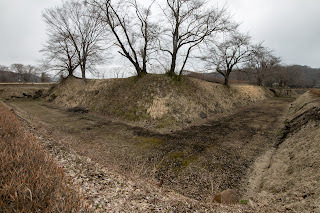 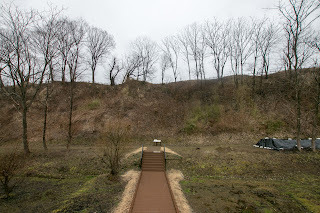 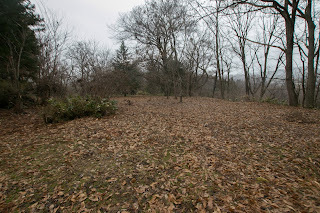 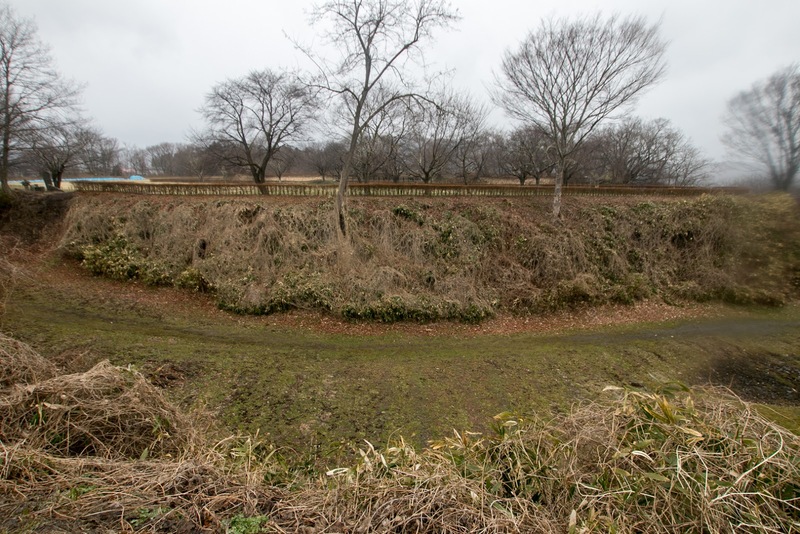 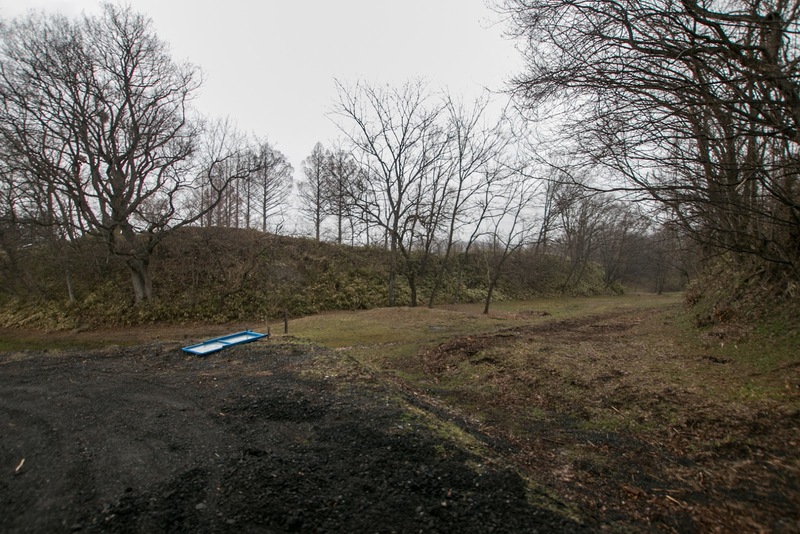 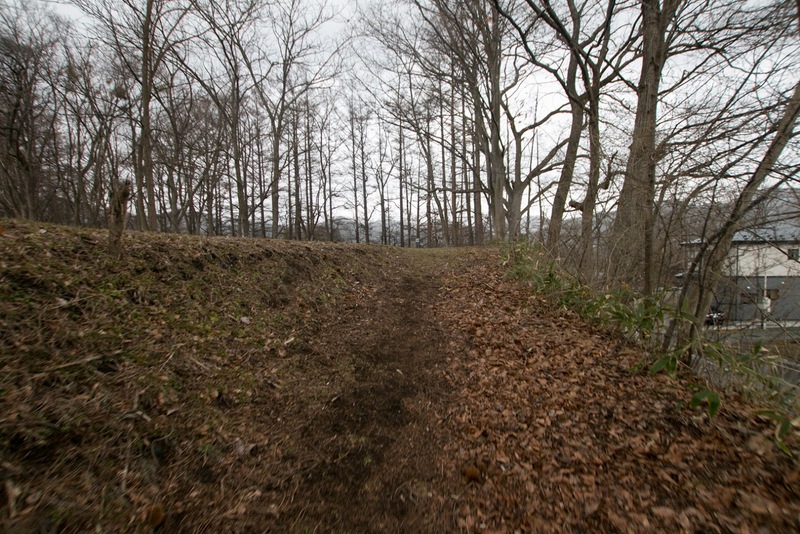 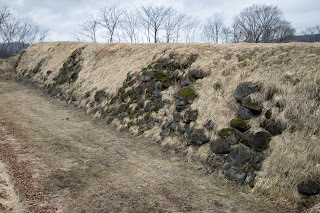 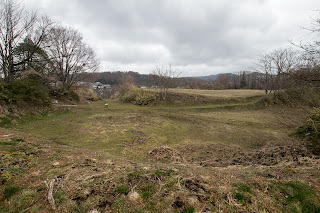 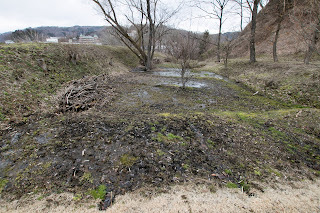 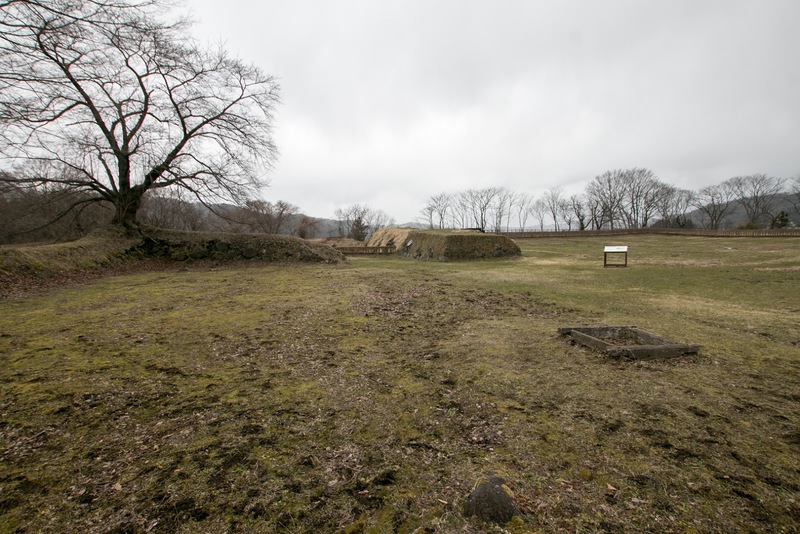 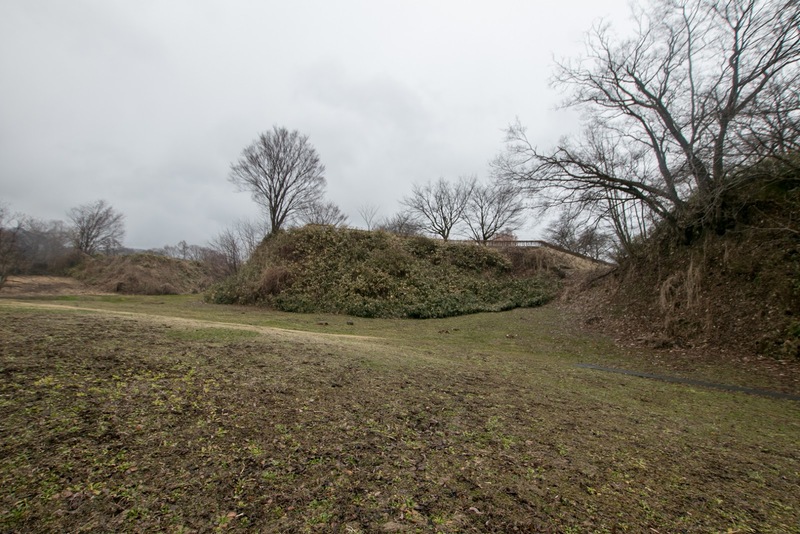 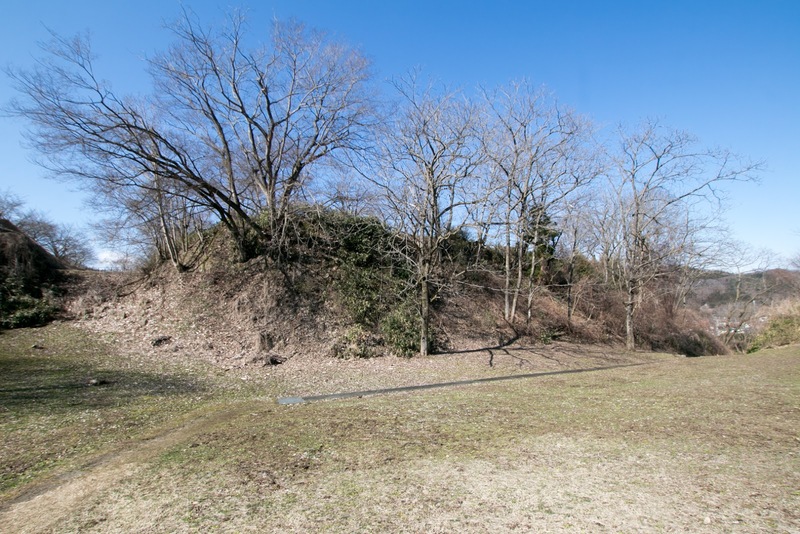 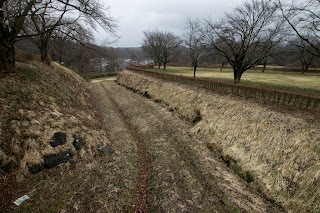 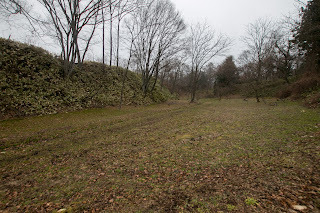 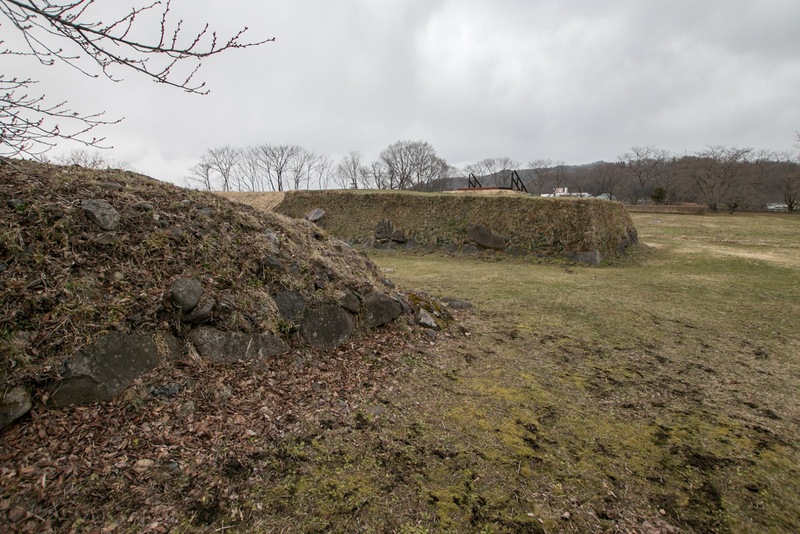 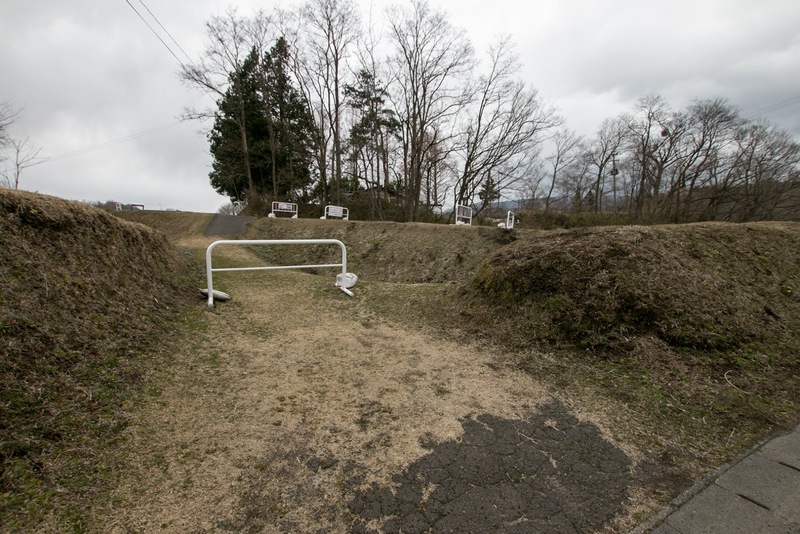 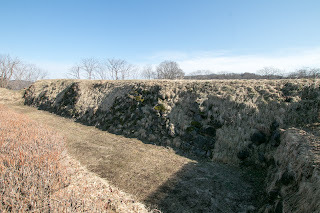 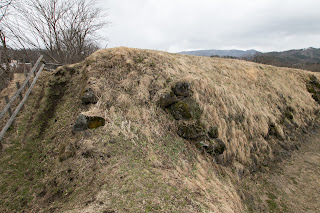 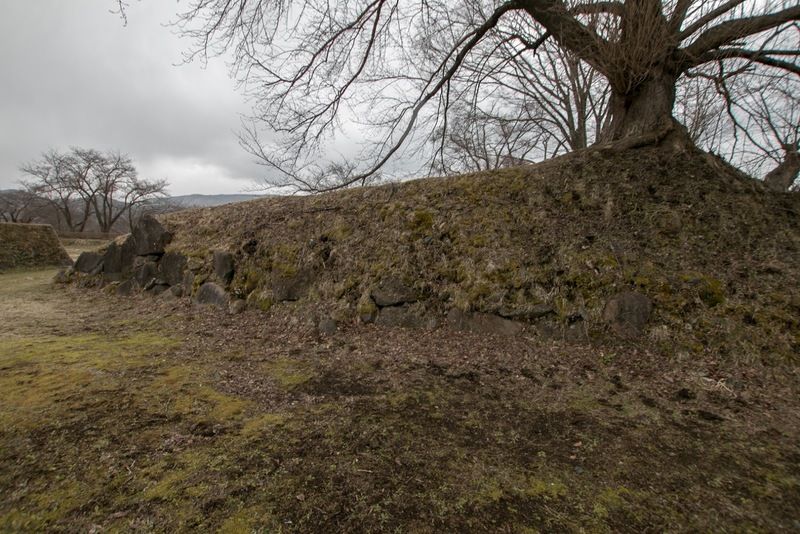 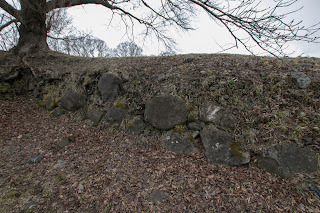 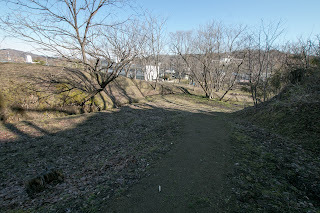 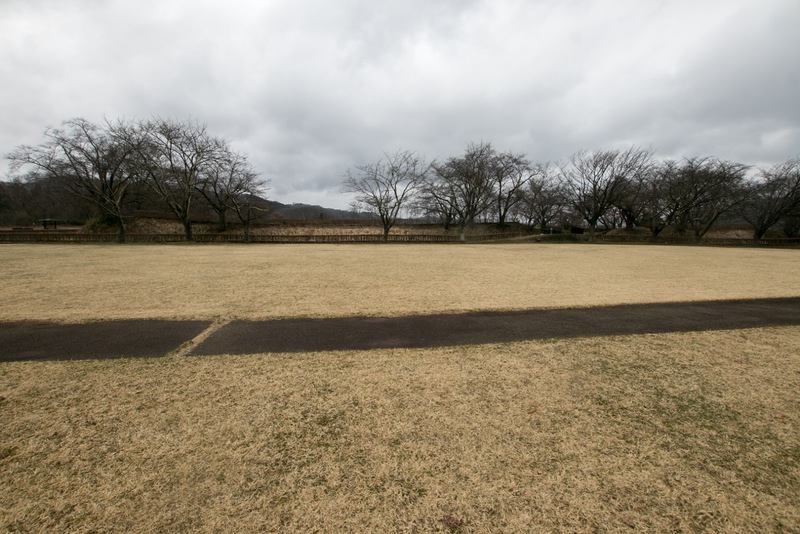 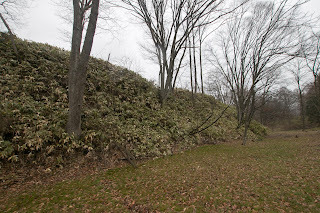 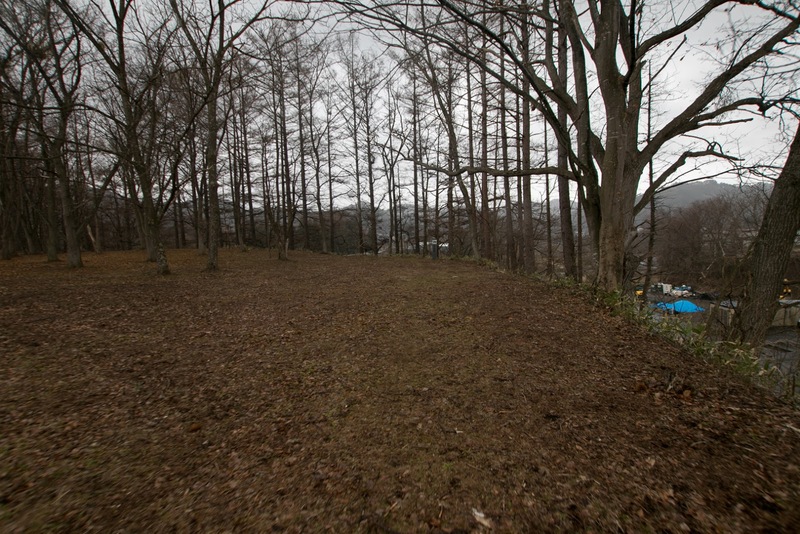 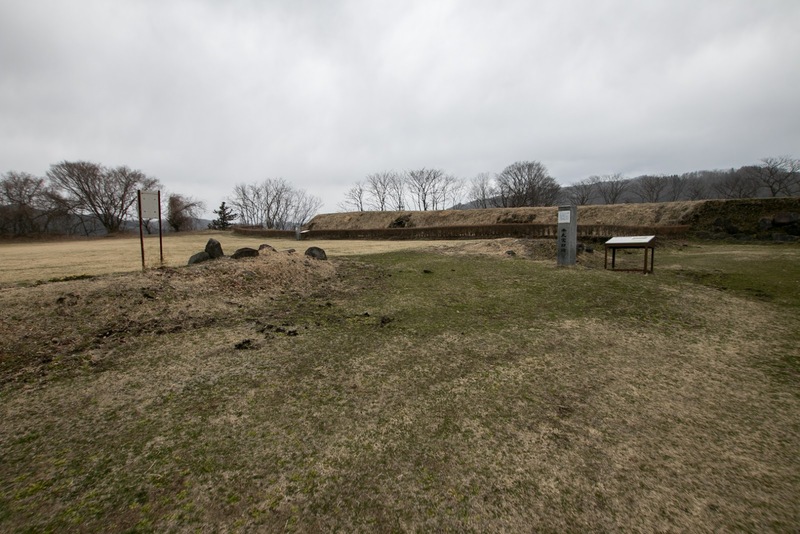 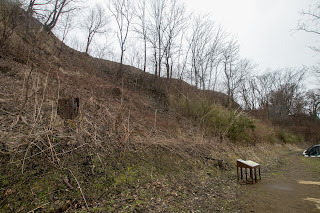 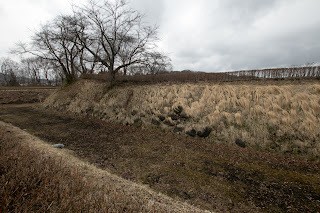 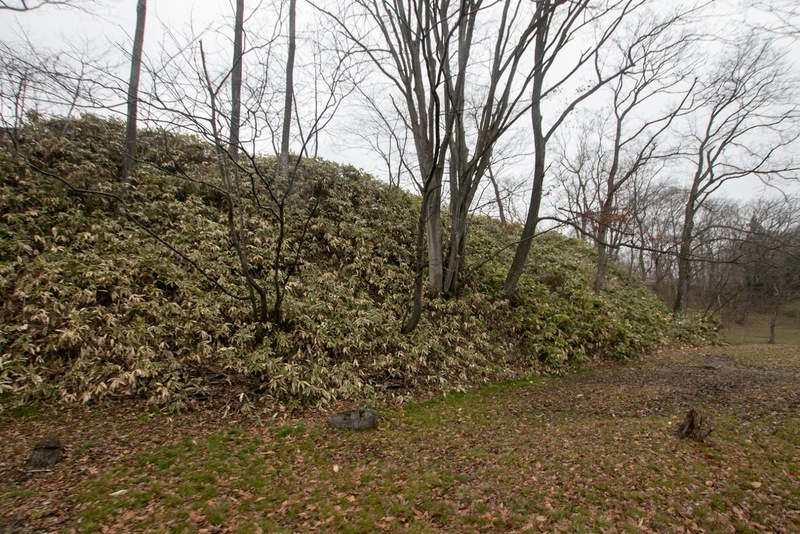 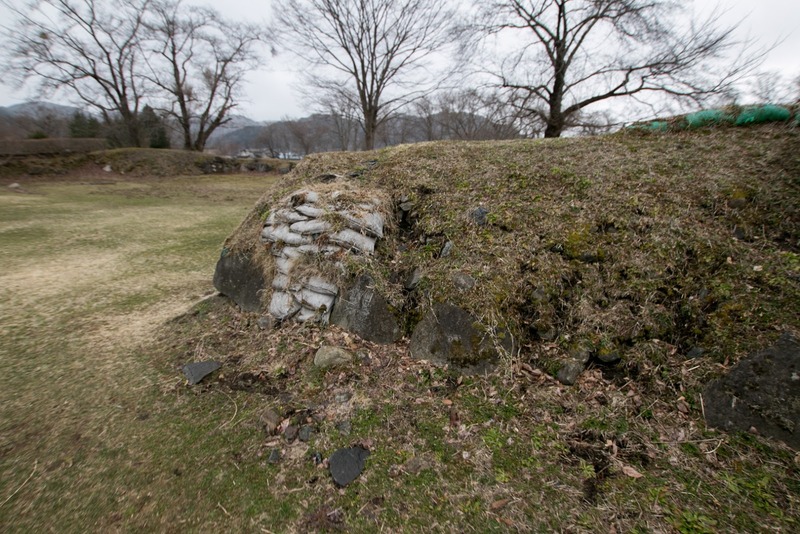 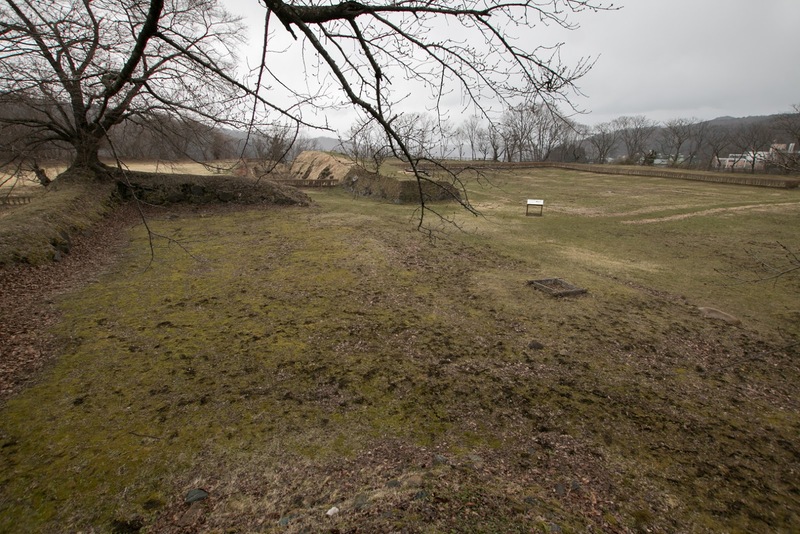 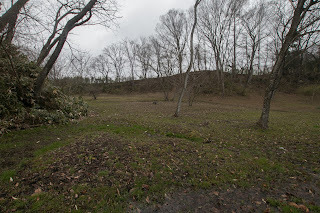 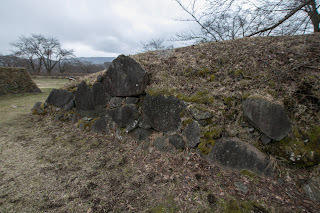 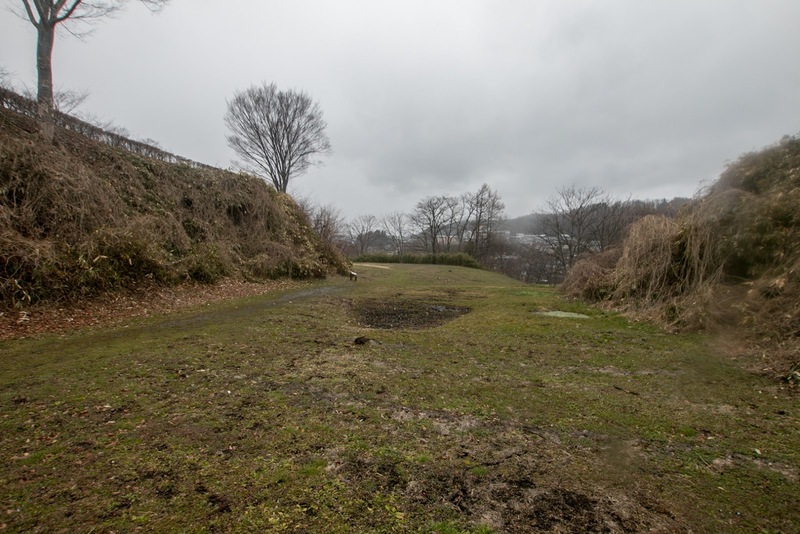 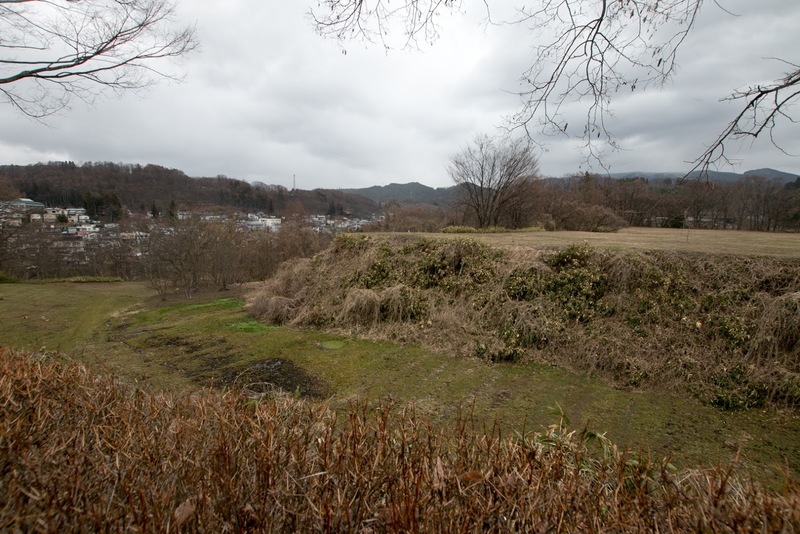 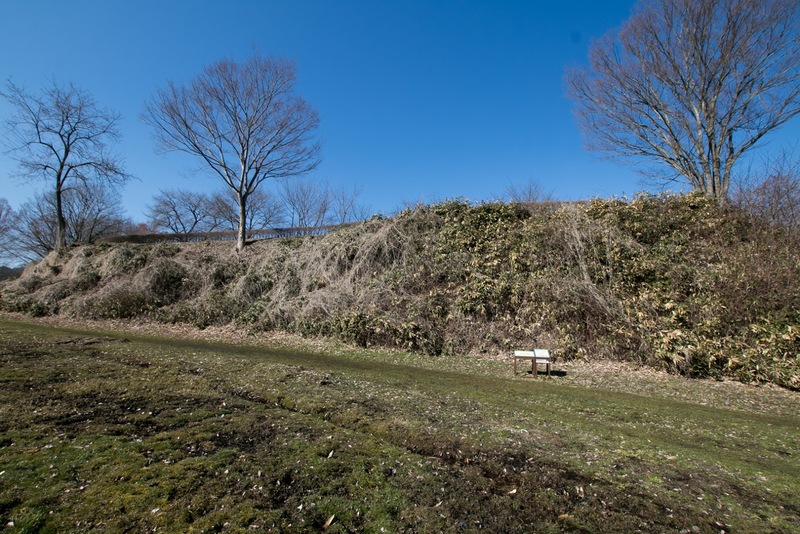 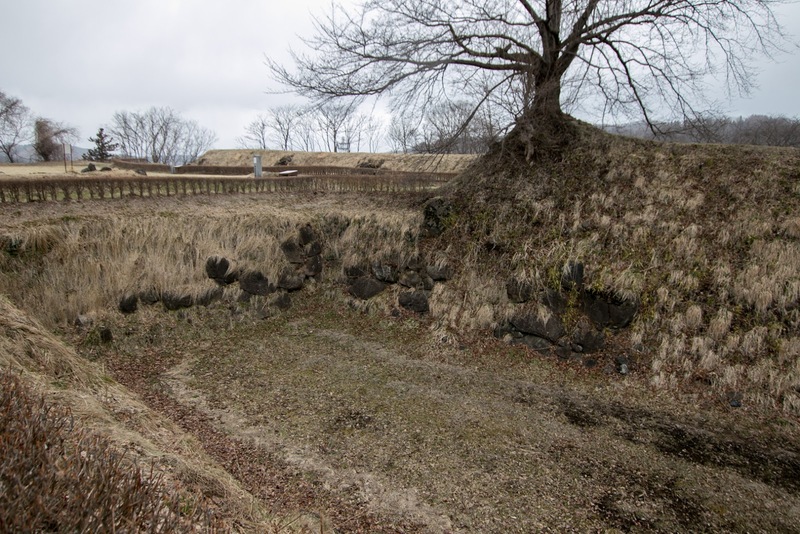 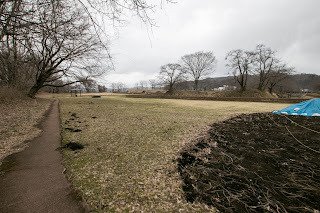 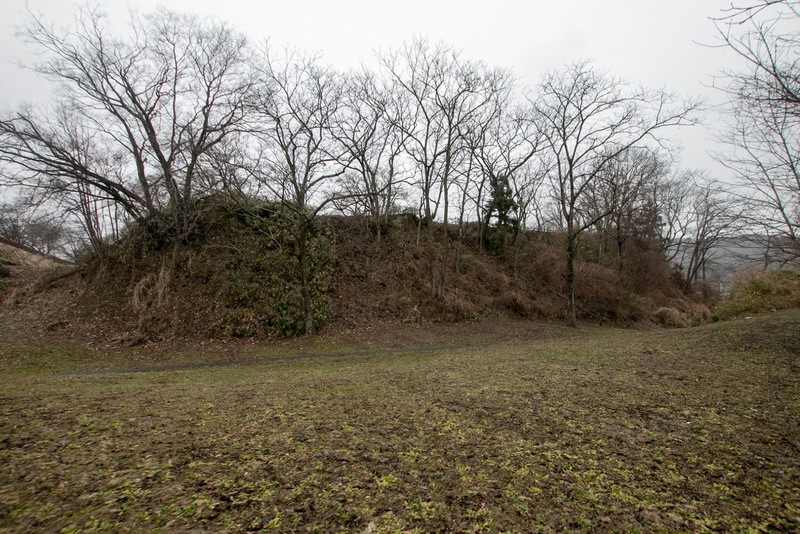 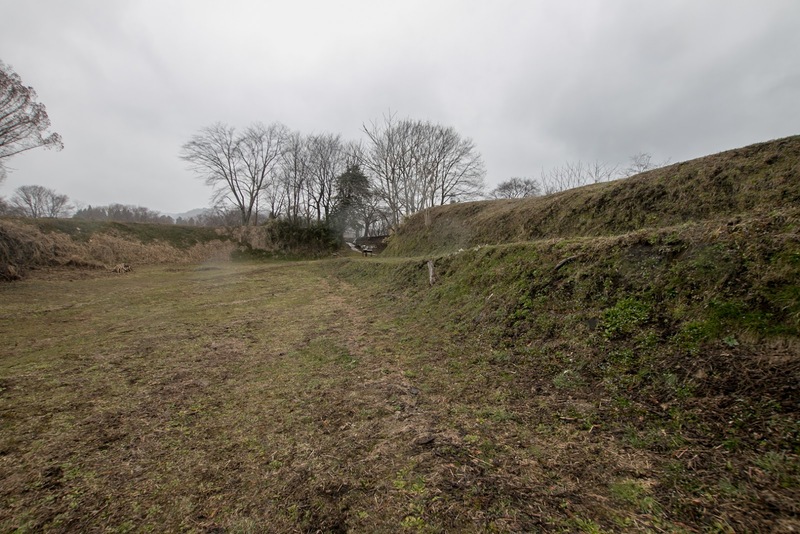 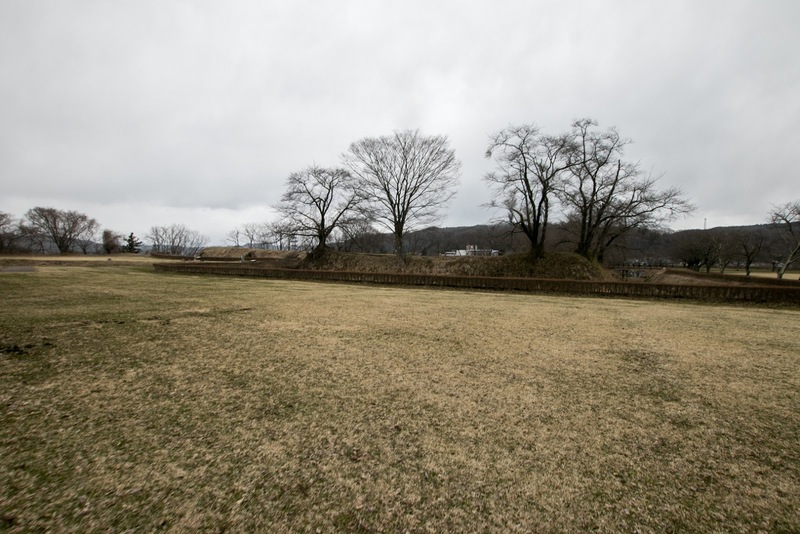 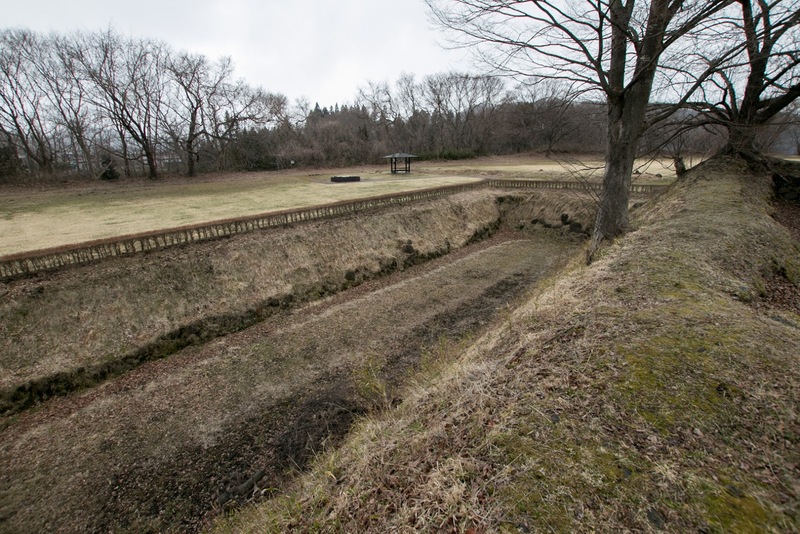 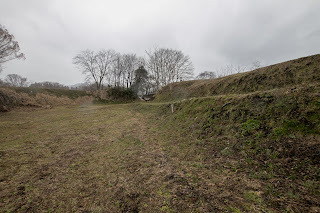 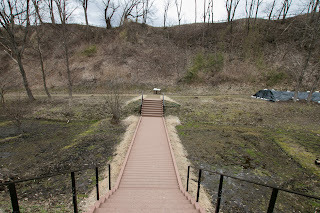 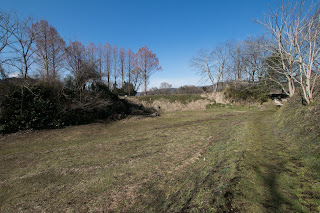 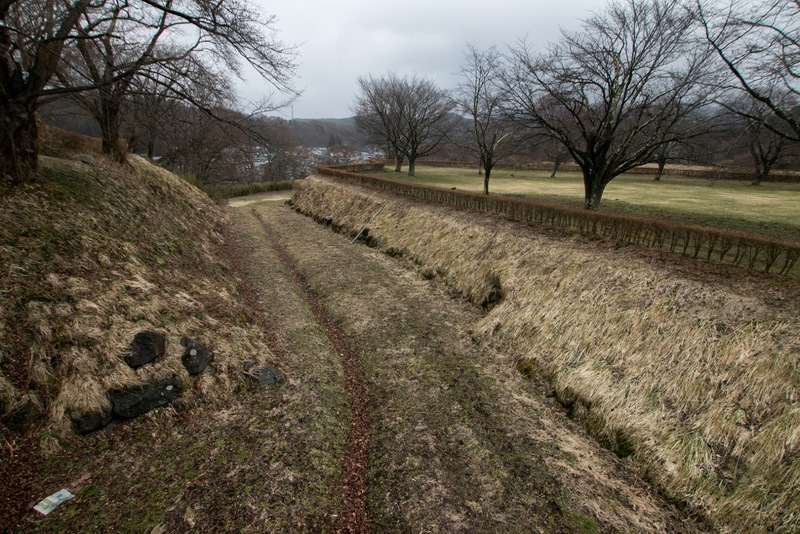 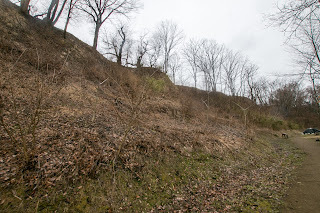 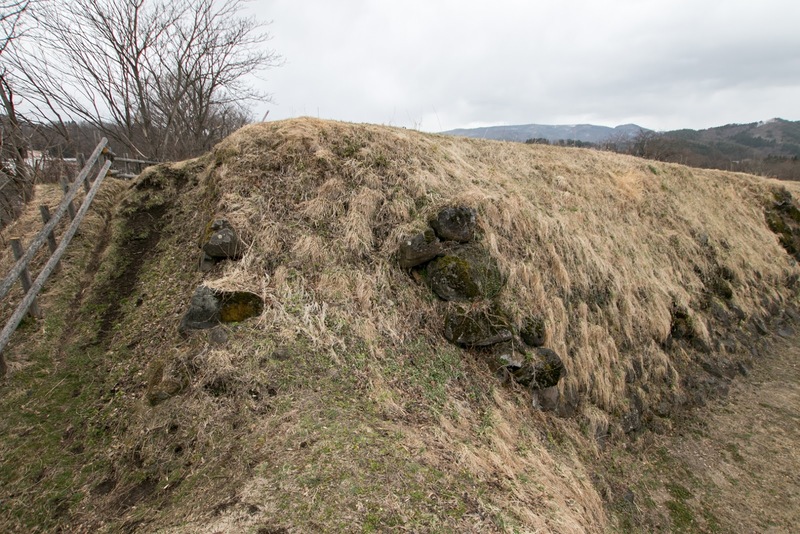 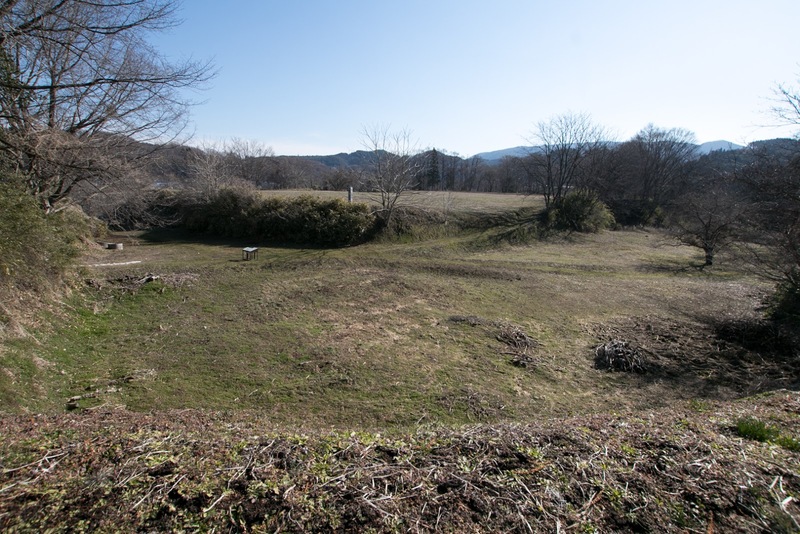 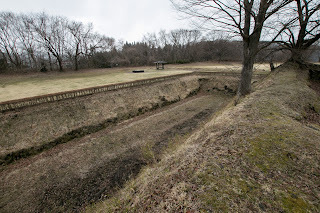 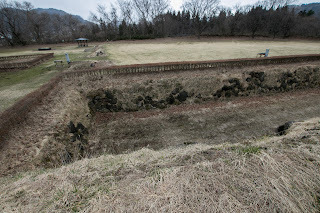 Like other castles of same age such as Nejyo castle or Namioka castle (Aomori prefecture), Kunohe castle consist of several large area of same level separated by large dry moat. 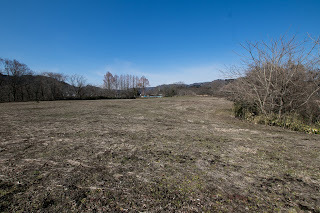 Central area face the inside corner of river terrace, and was protected by secondary area, Ishizawatate area or Wakasatate area from east side to south side. 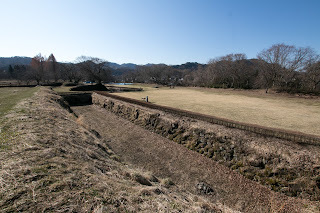 South front of the castle connected to the terrace is an expected front, thus a wide dry moat of nearly 50 meter side was built. 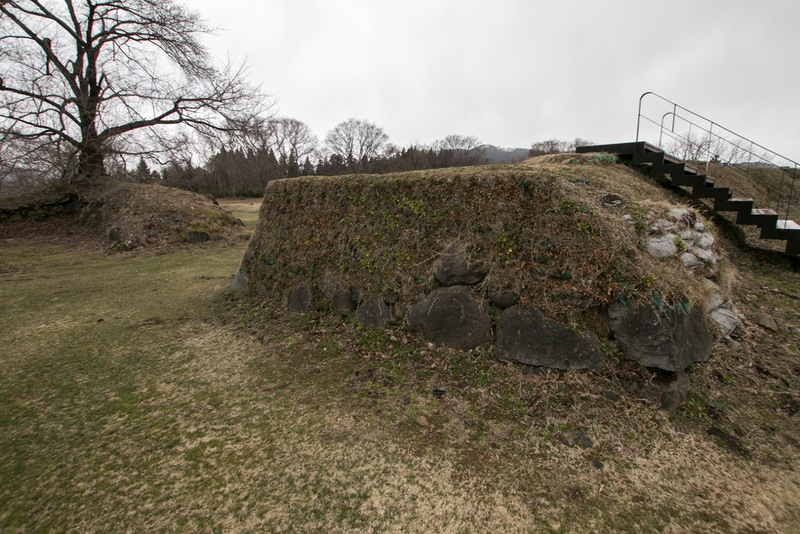 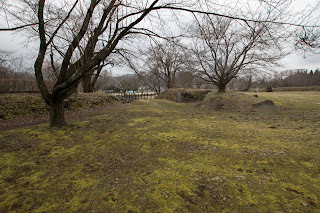 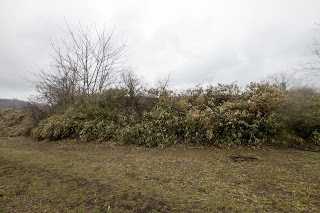 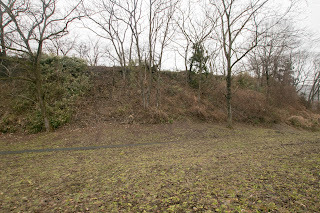 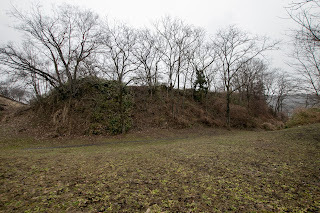 A front fort named Matsunomaru protected this side. 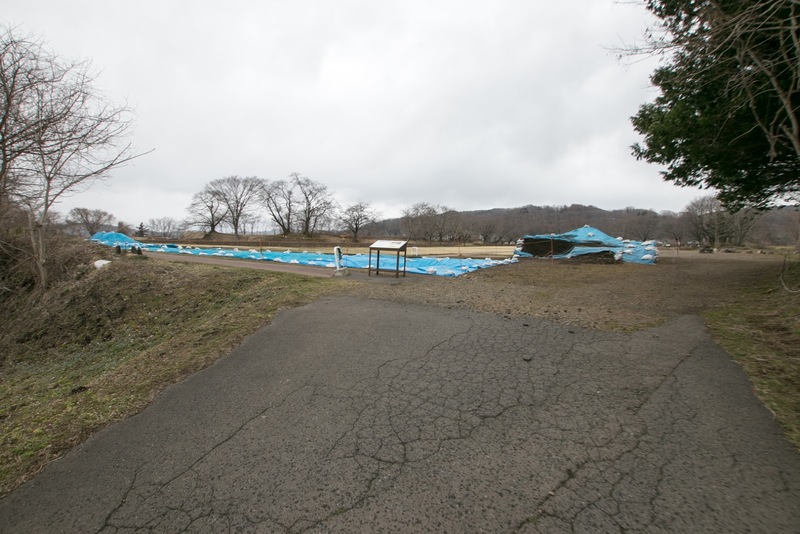 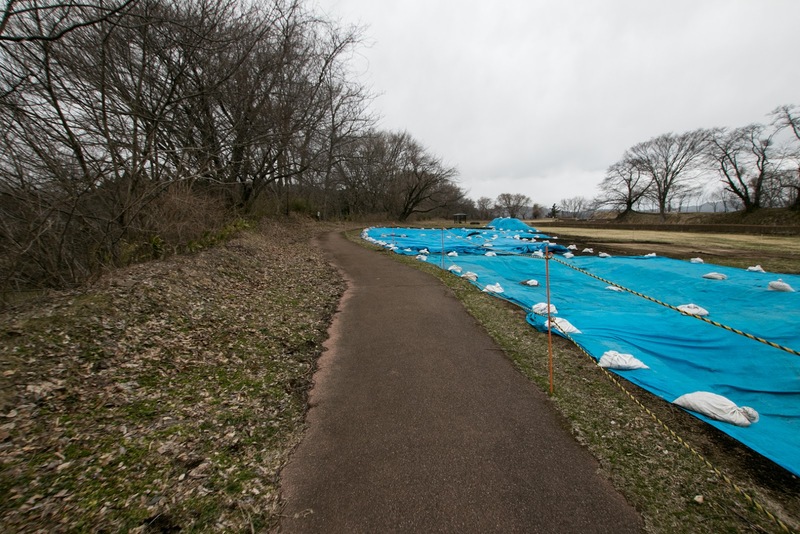 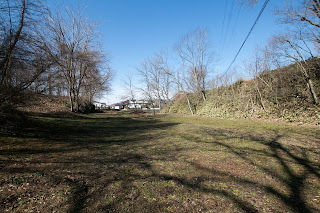 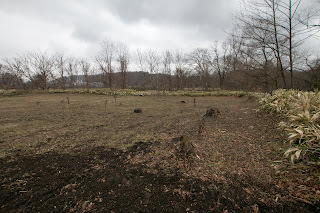 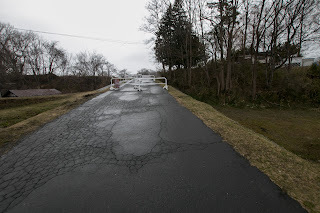 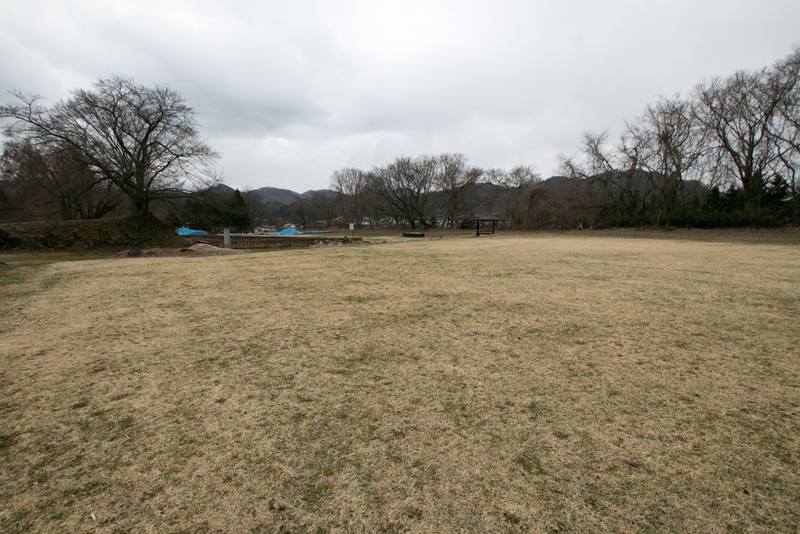 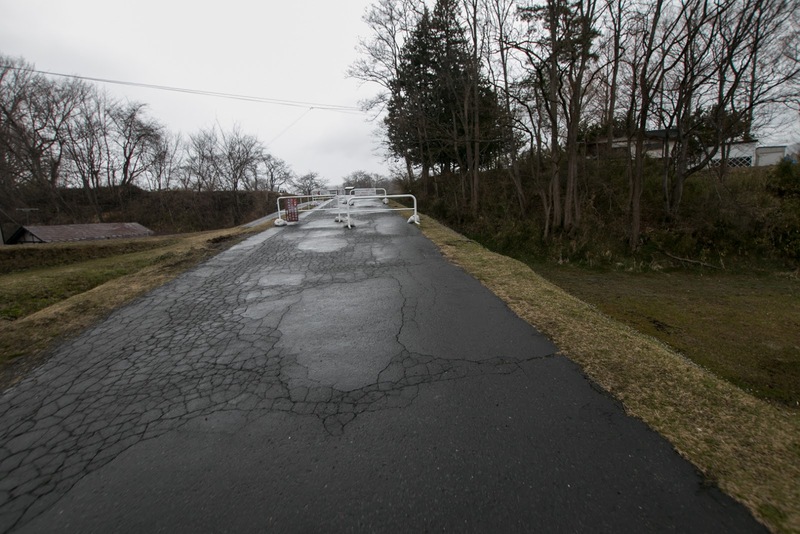 and third area spread between river terrace and Mabuchigawa river. Total size of the castle was about 500 meter square and quite large and larger than the castle of other Nanbu clan, and this exactly shows power of Kunohe clan. 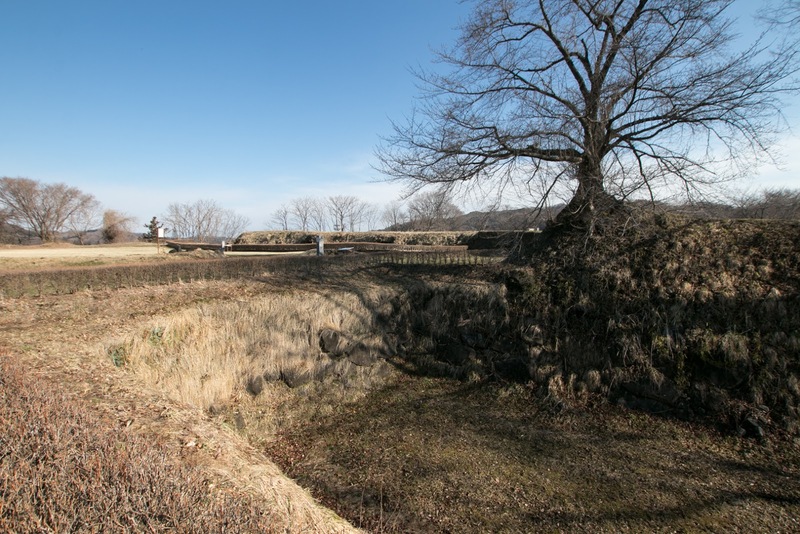 Contrary to its wide territory, Nanbu clan had a cause of dispute. 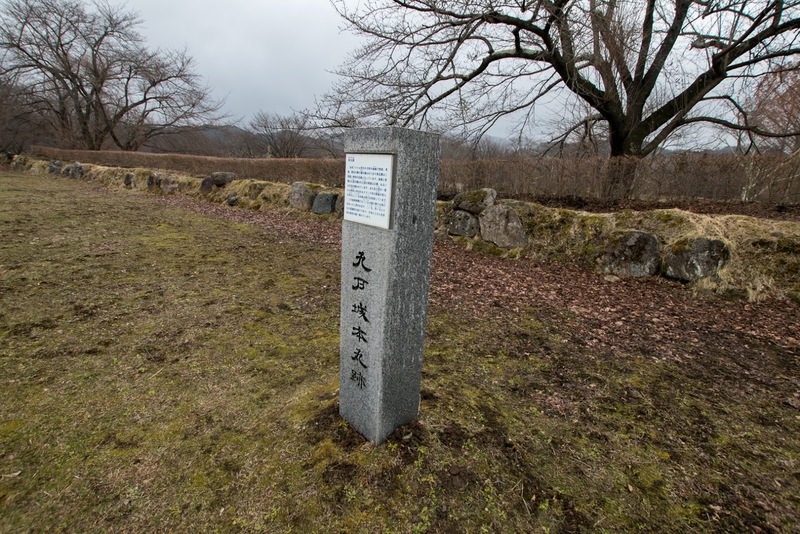 Harumasa Nanbu, the leader of the clan, did not have his own son at first, and once adopted his cousin Nobunao Nanbu (1546-1599) as an adopted son and placed his successor. 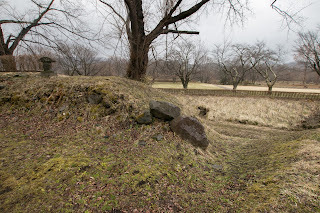 But once his own son Harutsugu Nanbu (1570-1582) was born, Harumasa became to treat Nobunao coldly, and this lead to the internal conflict between Harumasa and Nobunao. After the death of Harumasa, Harutsugu once succeeded the leader position, but Harutsugu also died just after the succession. 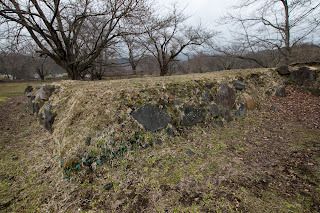 Precise reason is unknown but it is said as an assassination by Nobunao side. 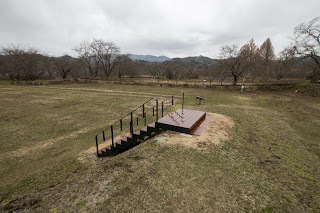 Seeing that situation, people and generals of Nanbu clan gathered to decide next leader. Masazane originally supported Harumasa, and let his younger brother Sanechika Kunohe marry with the daughter of Harumasa. Based on the military power of Kunohe clan and relationship with Harumasa, Sanechika once seemed to succeed Nanbu clan. 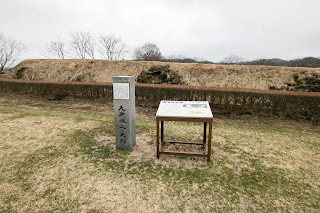 But Nobunao who was supported by other generals such as Nobuchika Kita (1523-1623) and allied with Hachinohe Nanbu clan finally seized the leader position of Nanbu clan. 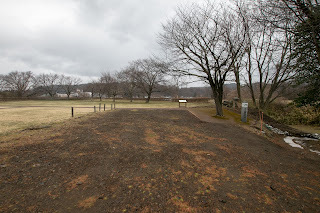 Masazane who was dissatisfied with this decision gradually keep distance from Nobunao. 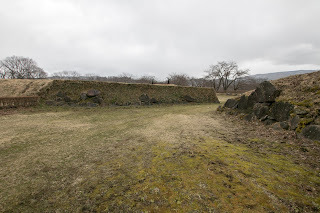 Looking at this dispute, Tanenobu Tsugaru (1550-1607) who was originally a branch family of Nanbu clan but seek chance of independence seized Tsugaru area and became independent from Nanbu clan by 1588. 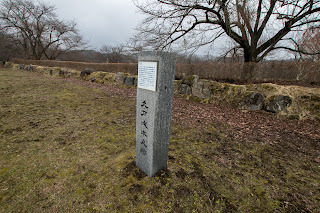 Tsugaru clan promptly communicated to central ruler Hideyoshi Toyotomi (1537-1598) and was approved his independence. In the meanwhile, Toyotomi government defeated Hojo clan which held whole Kanto region at Odawara campaign in 1590, and exercised its dominance to Tohoku region. 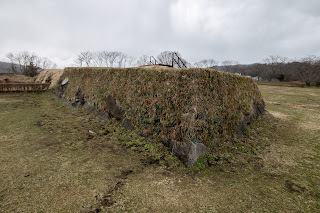 Strong warlords of Tohoku region such as Masamune Date (1567-1636) or Yoshiaki Mogami (1544-1614) subordinated to Toyotomi government, and Nobunao Nanbu also participated in Odawara campaign and was approved his position. 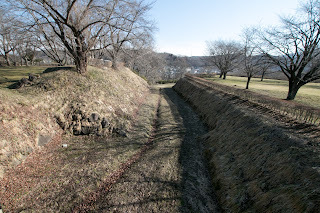 Based on the authority of Toyotomi government, Nobunao tried to control other Nanbu families and local lord. 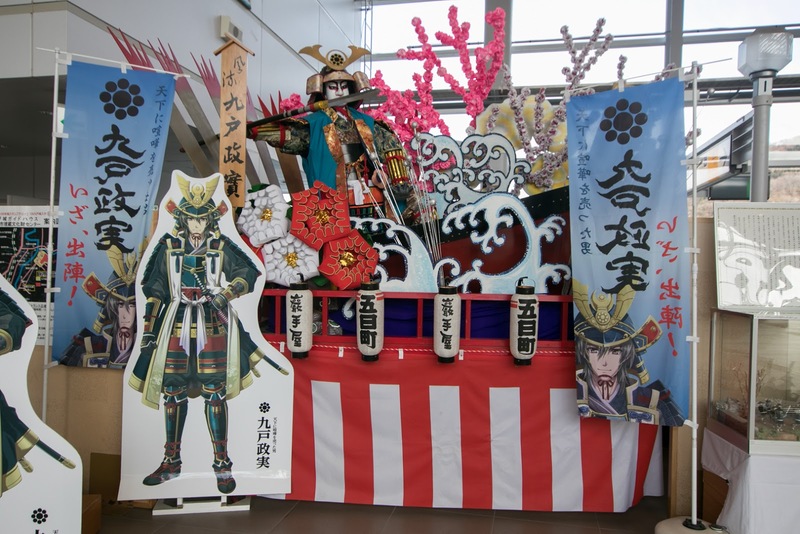 In response to this, Masazane who thought as equivalent to Nobunao and had a grunge to his succession strongly opposed to Nobunao. 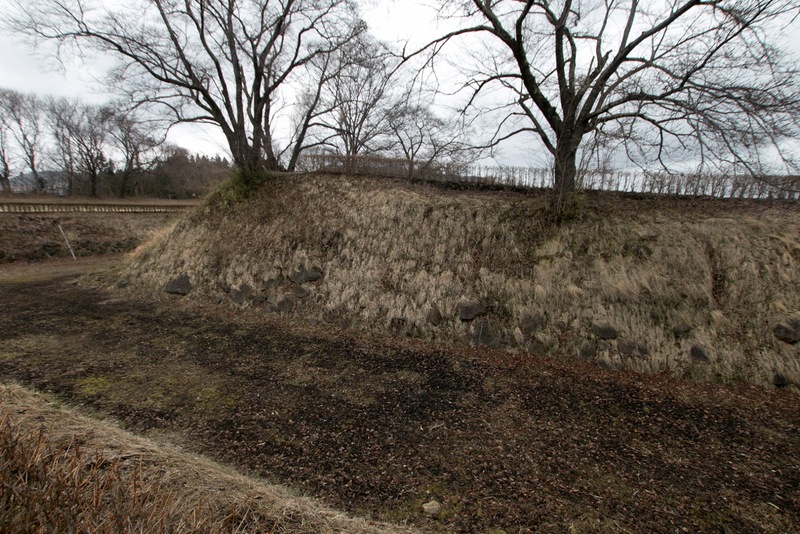 Possibly looking at independence of Tsugaru clan, Masazane might think he can do the same thing. After the return of Toyotomi army to central area, Masazane finally revolted to Nobunao with 5,000 army with non obedient other local lords. As Kunohe army was strong, Masazane captured surrounding Nanbu castles. 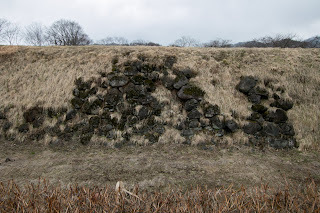 If this occurred 10 years before, this rebellion might be successfull. 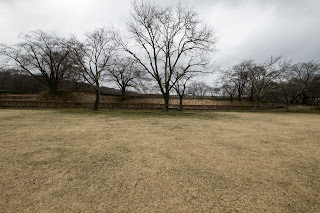 But different from Tsugaru clan case, Nobunao was a feudal lord officially approved by Toyotomi government, and rebellion to Nobunao became a challenge to the authority of Hideyoshi. 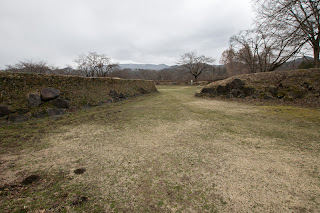 Furious Hideyoshi sent 60,000 army lead by his nephew and successor Hidetsugu Toyotomi (1568-1595), e largest lord Ieyasu Tokugawa (1543-1616) and other generals to suppress this rebellion of Masazane. 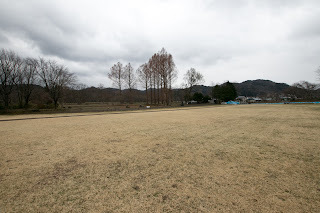 Masazane exactly was against the world. 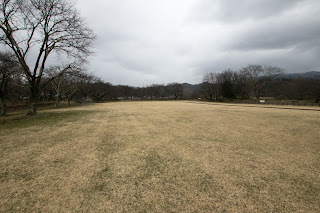 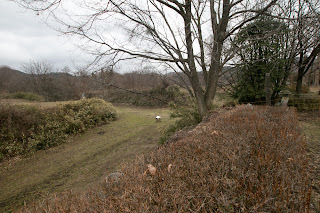 In September 1591, Toyotomi large army broke the defense line of Kunohe castle. 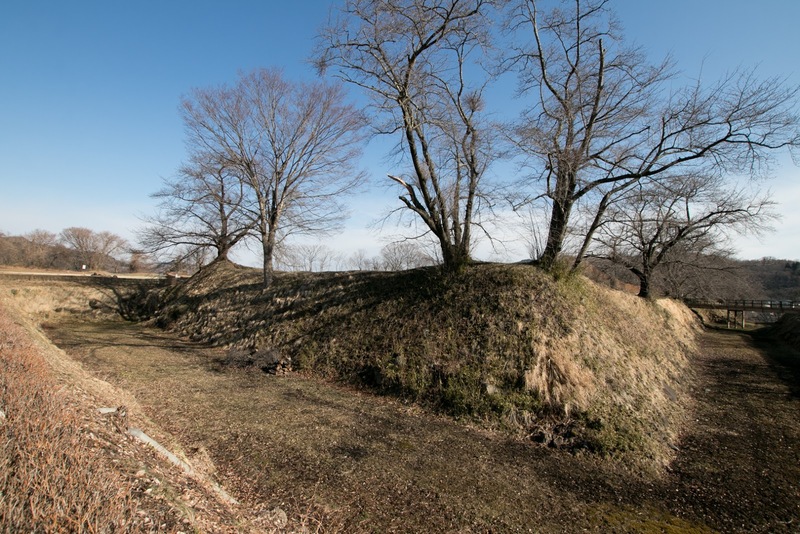 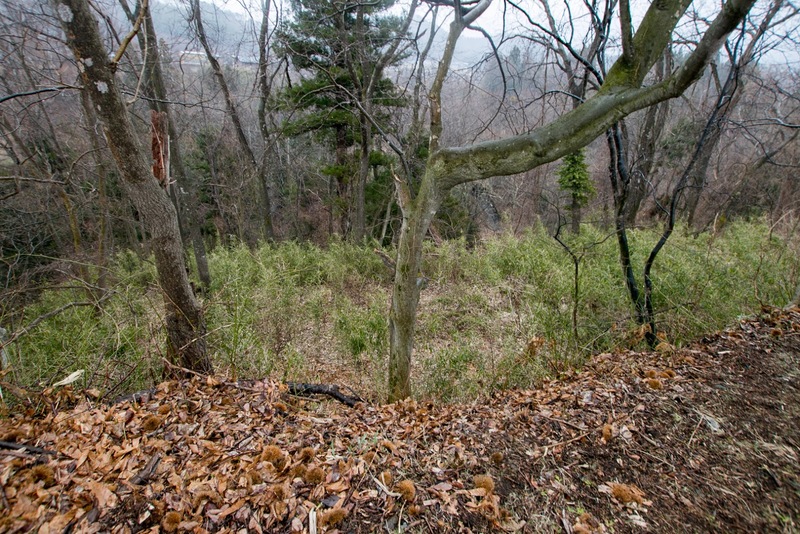 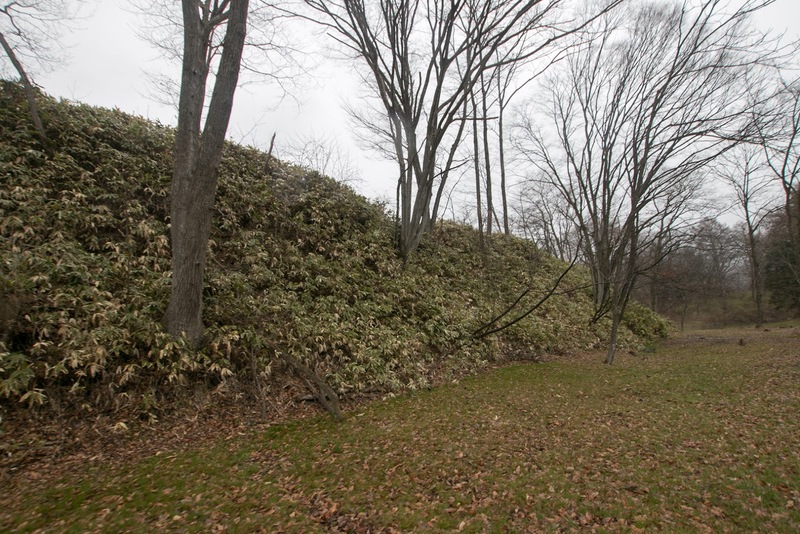 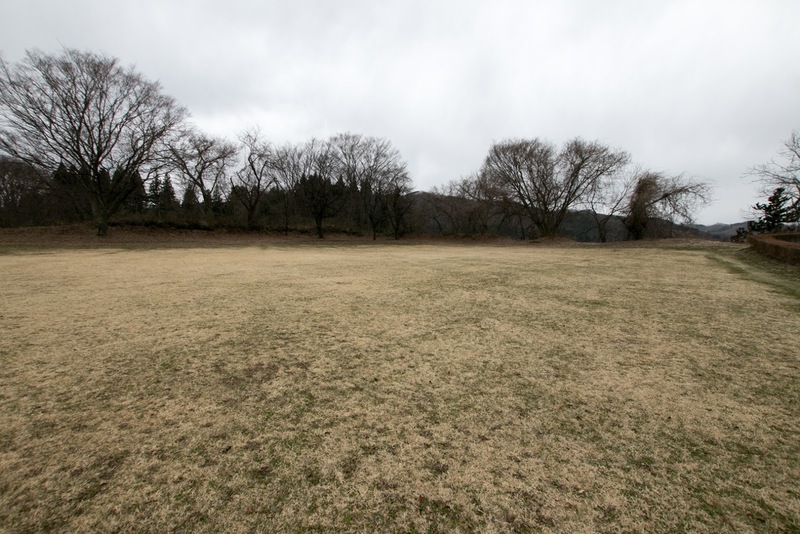 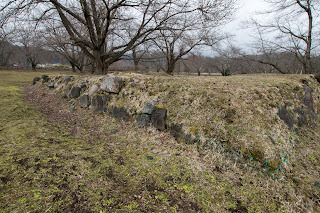 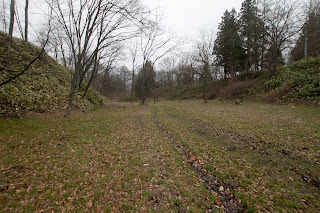 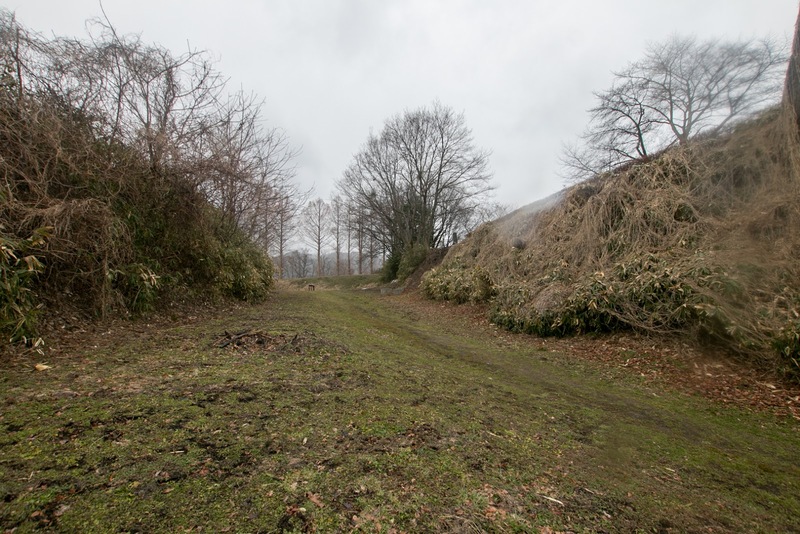 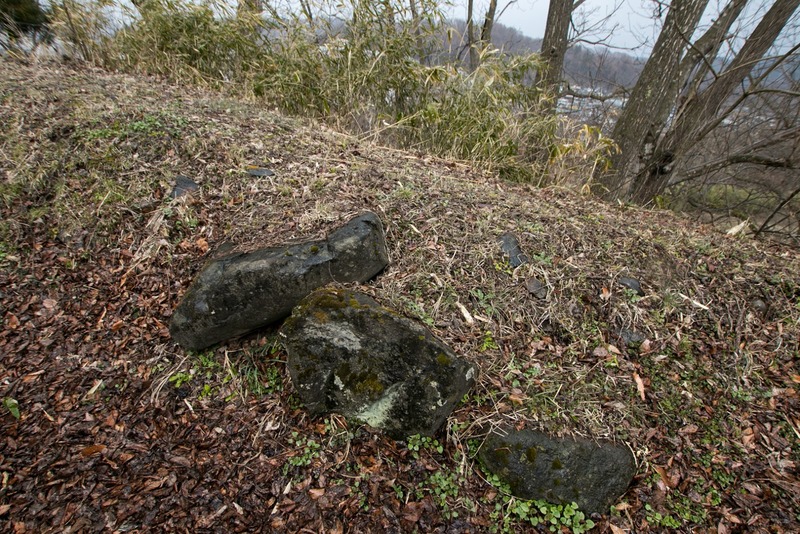 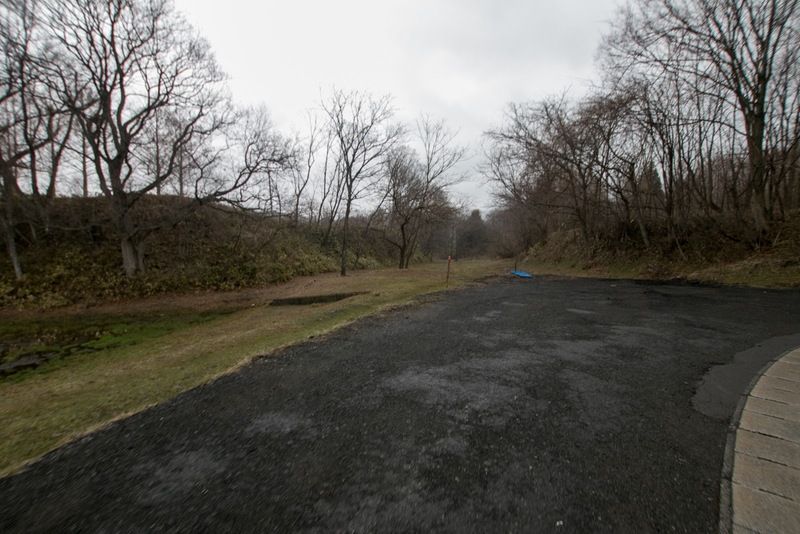 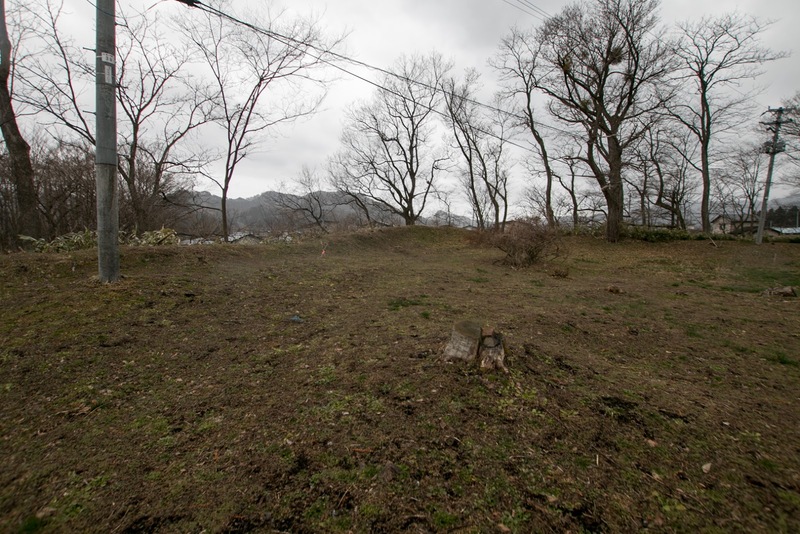 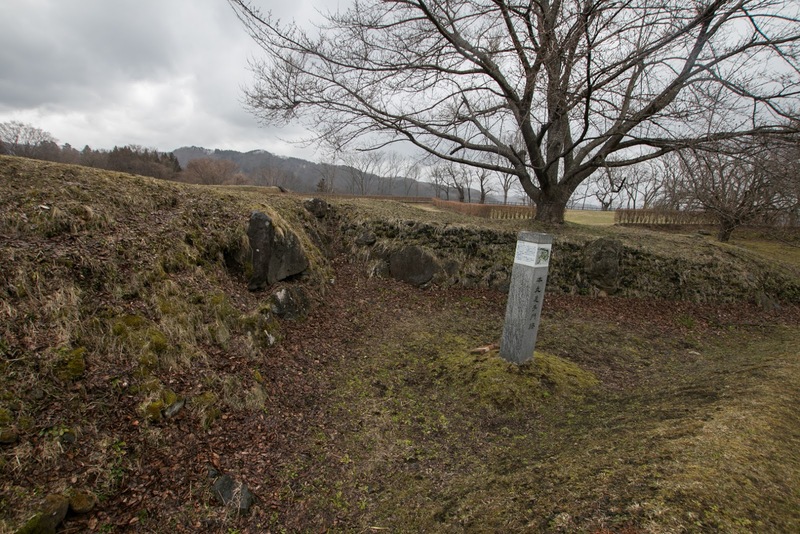 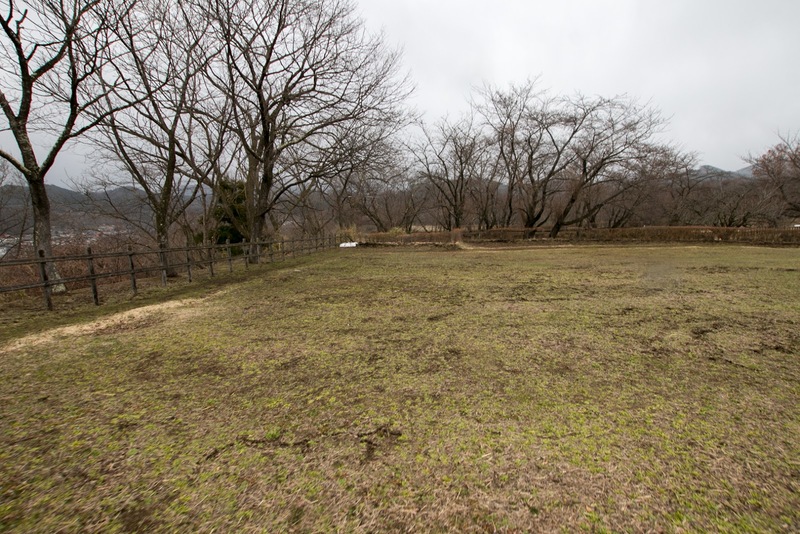 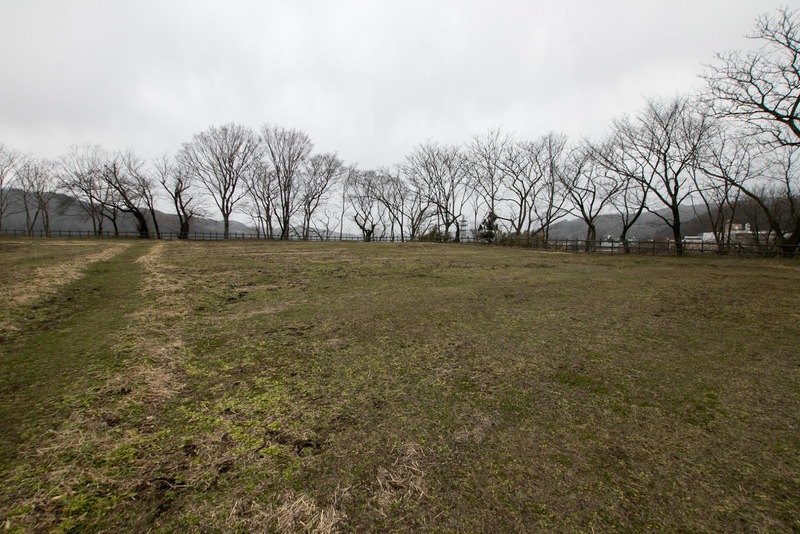 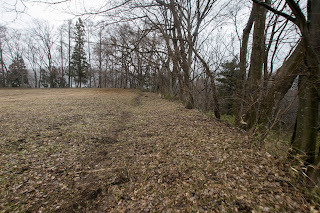 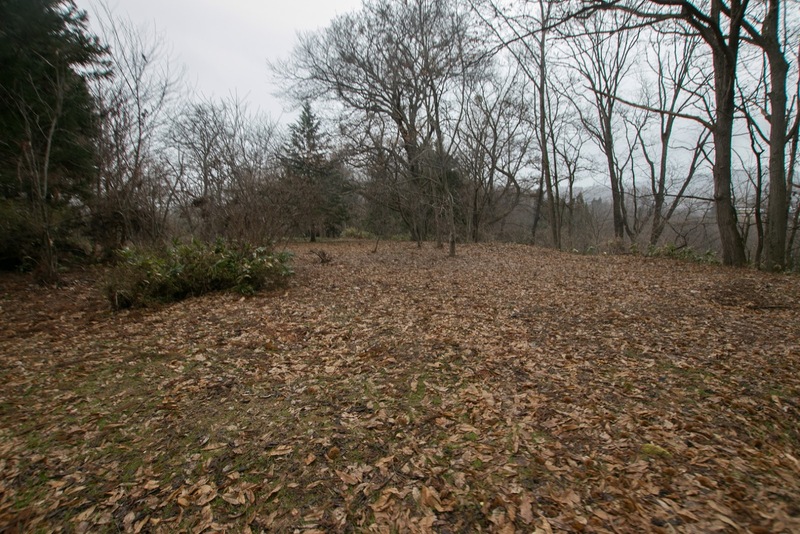 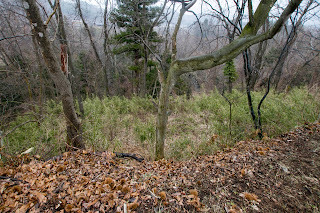 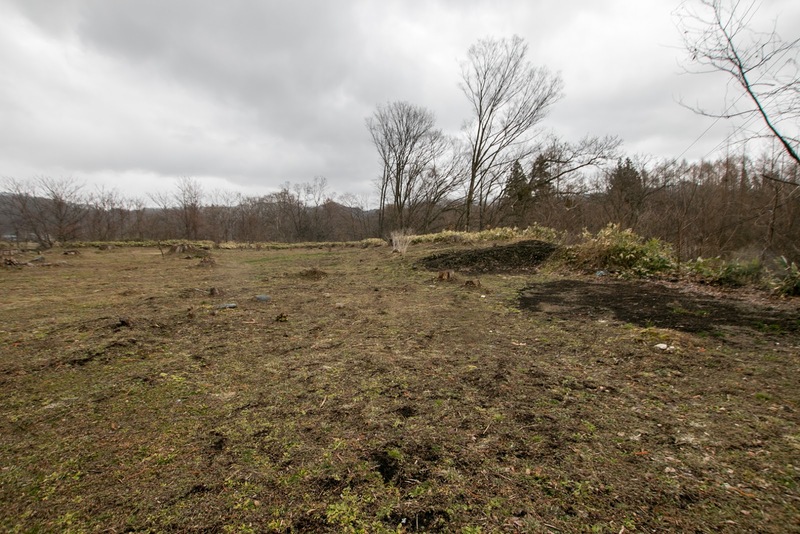 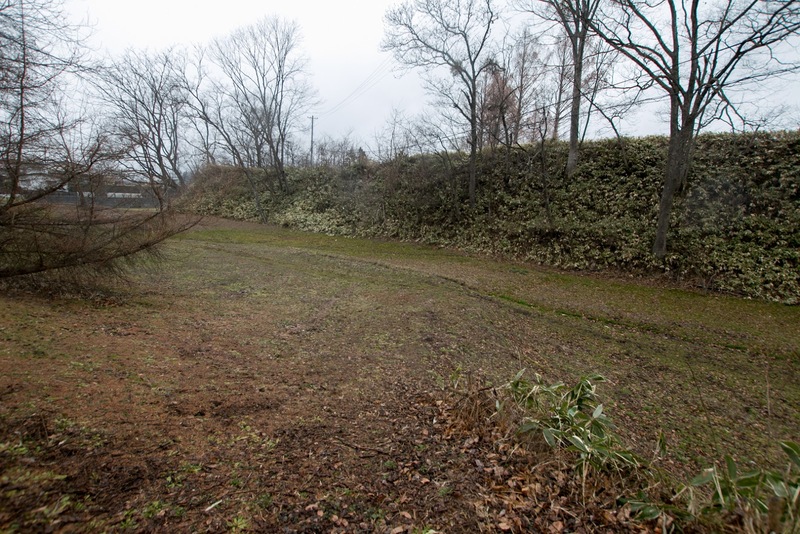 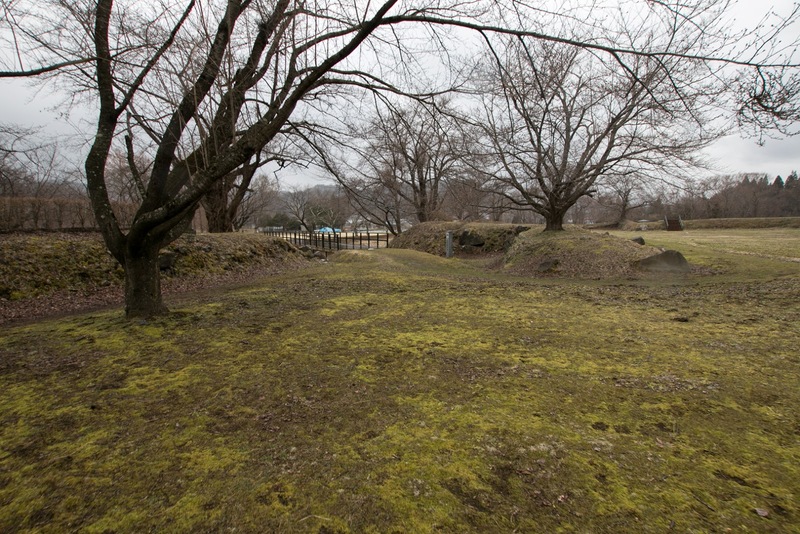 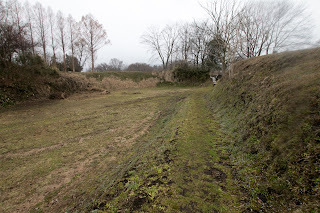 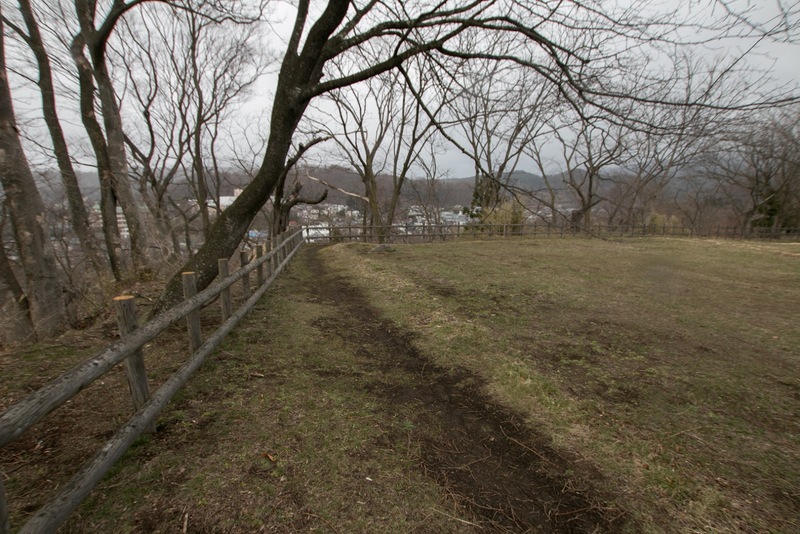 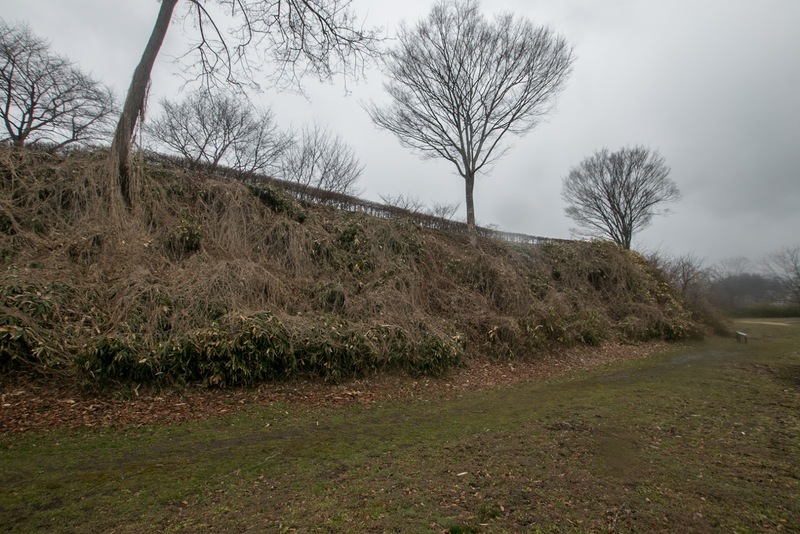 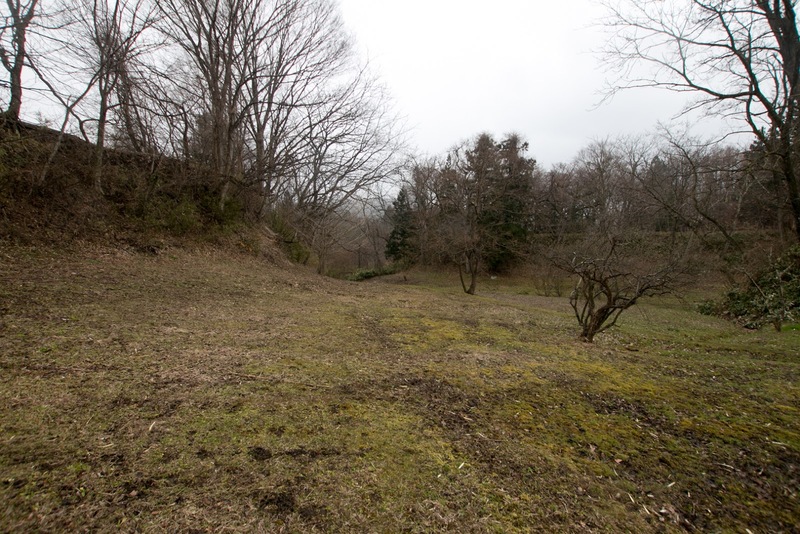 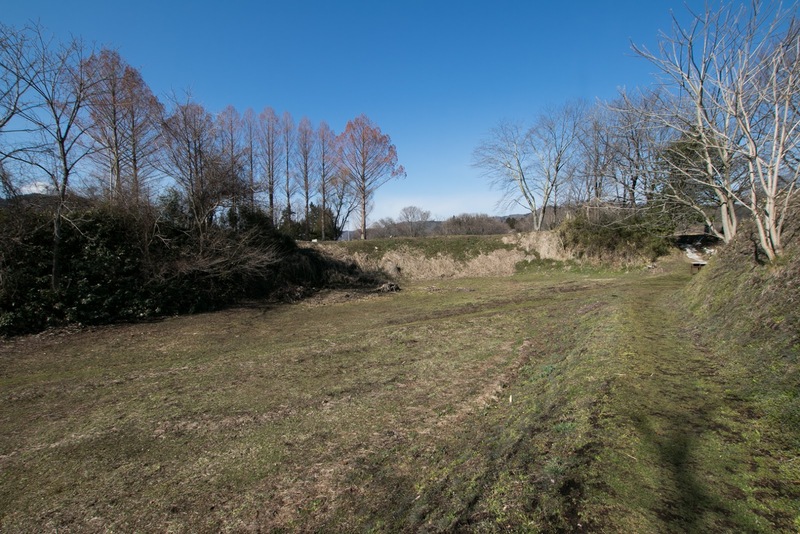 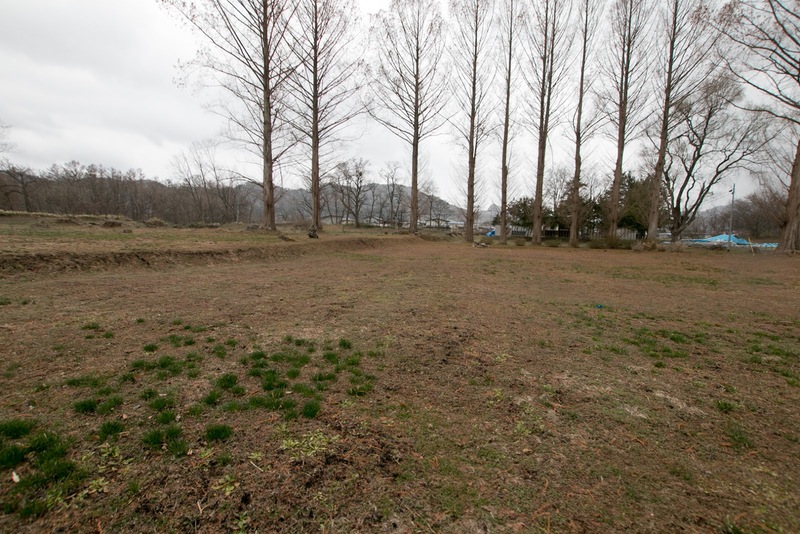 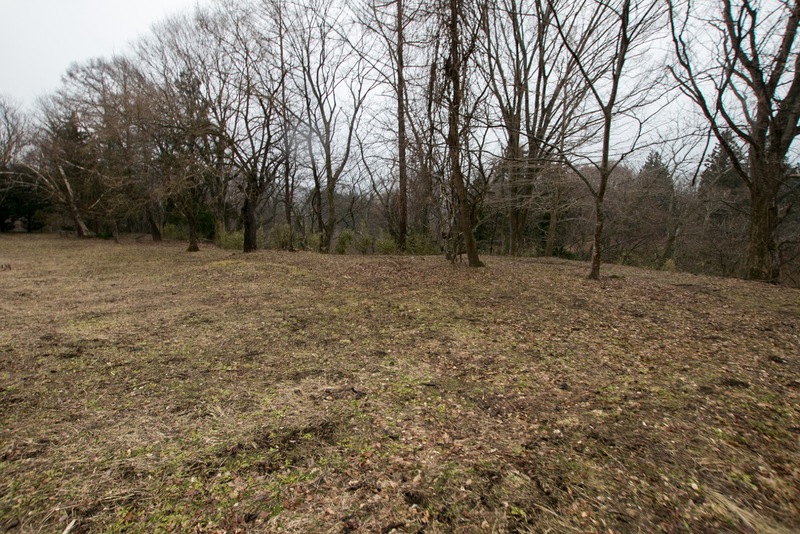 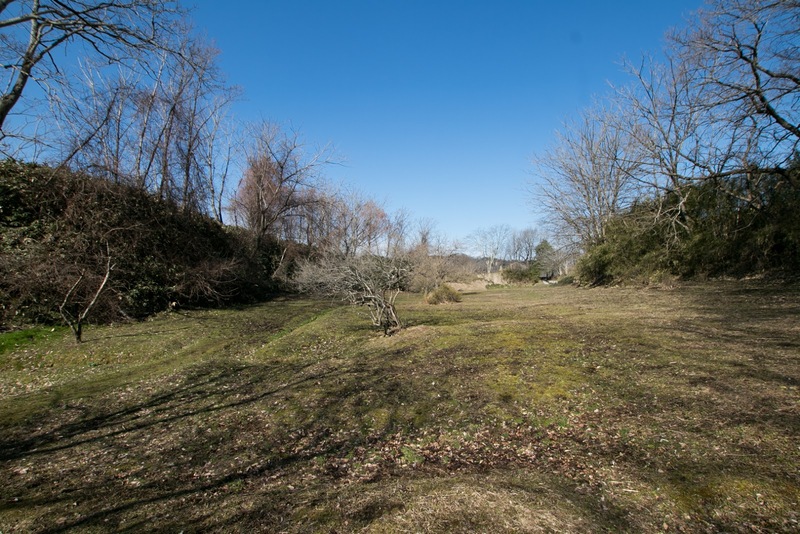 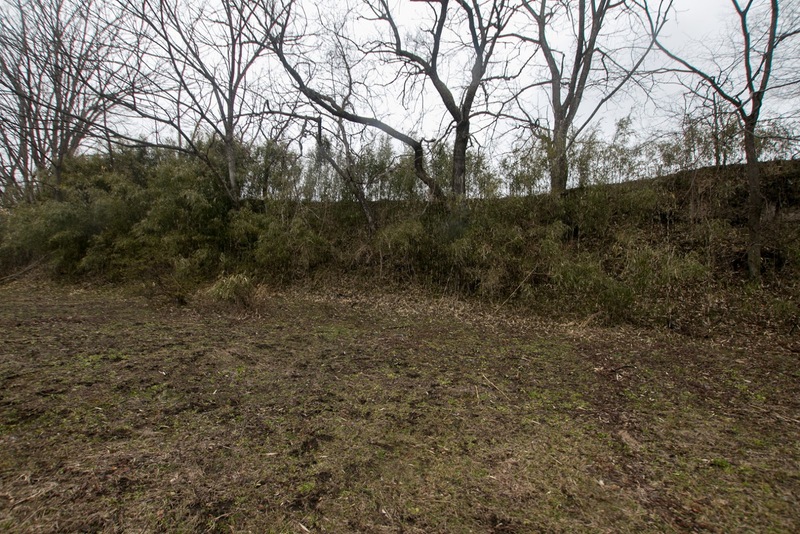 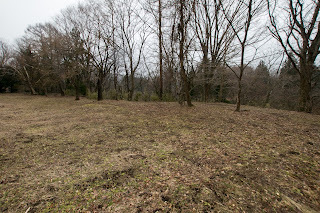 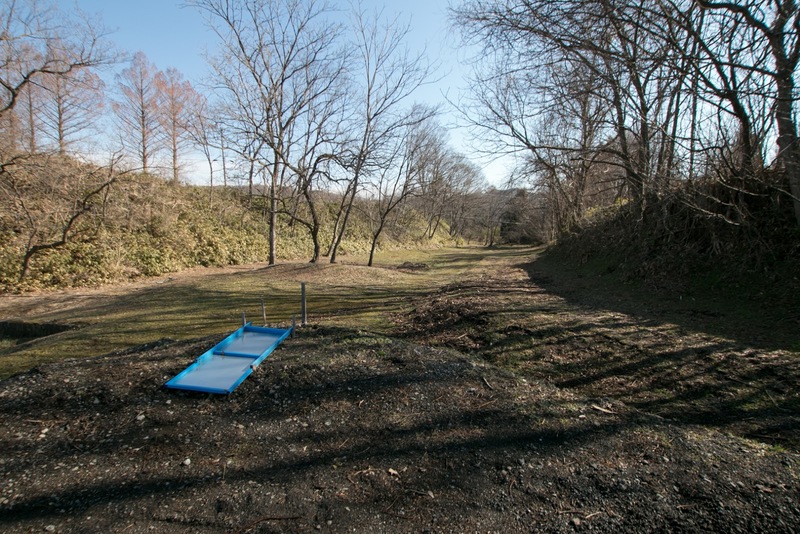 As Kunohe castle was a secure castle protected by deep valley and rivers, Toyotomi army feared damage tried to open the castle by negotiation. 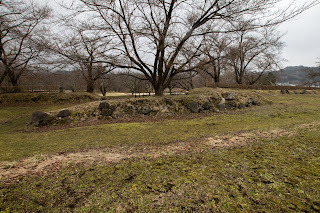 Desperately outnumbered Masazane surrendered to Toyotomi army based on the agreement of saving his life, and open the castle. 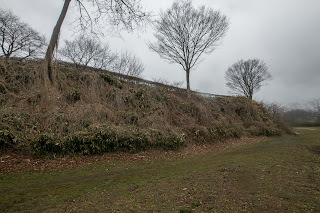 But finally Toyotomi army broke this agreement and executed Masazane, along with his supporting lords such as Hachinohe clan of Hachinohe castle (Aomori prefecture), Kuji clan of Kuji castle (Iwate prefecture) or Oyu clan of Oyu castle (Akita prefecture). 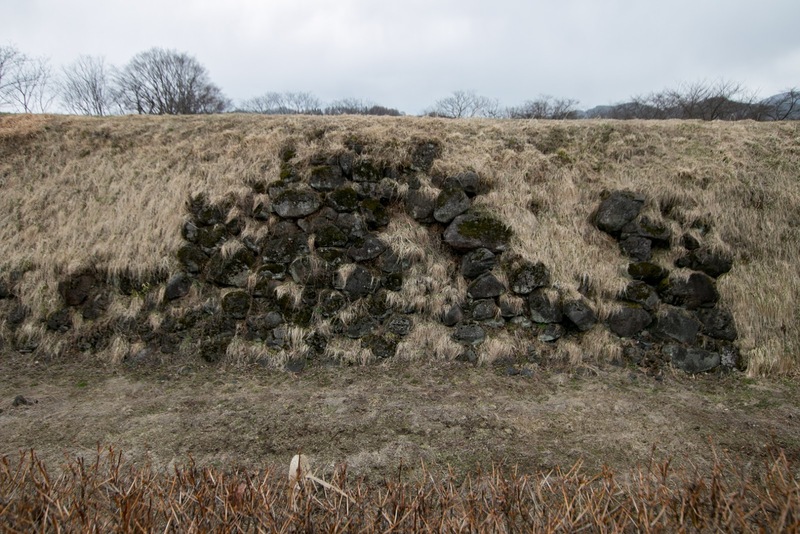 Background and suppression process of rebellion is quite the same as the one of Tanaka castle at Higo province occurred in 1587. 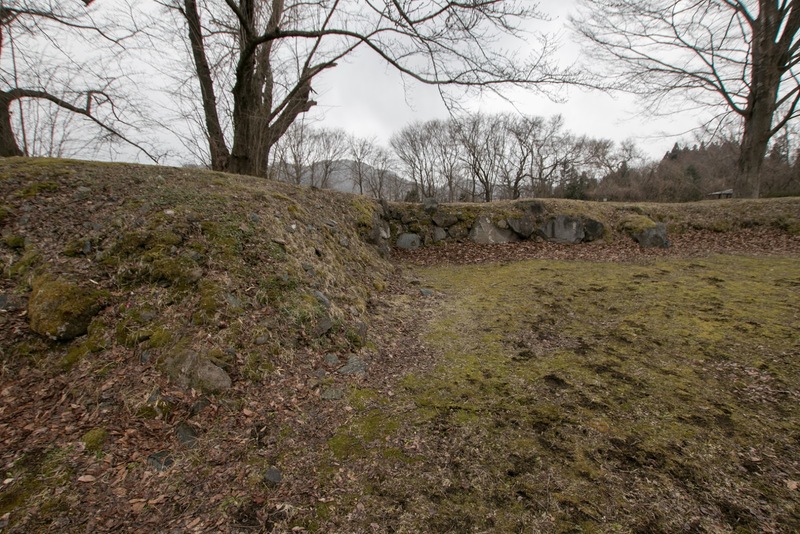 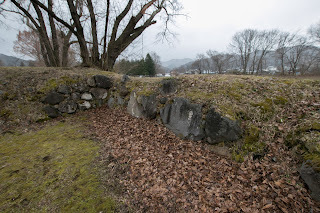 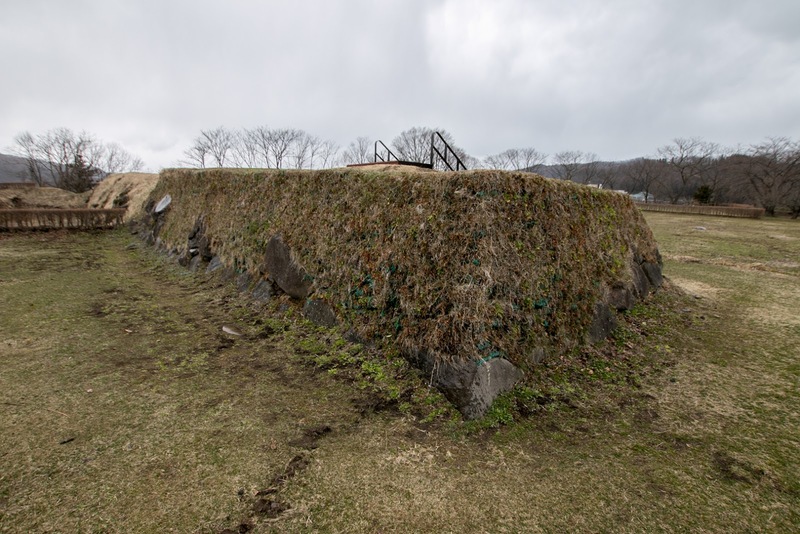 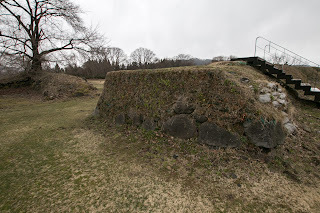 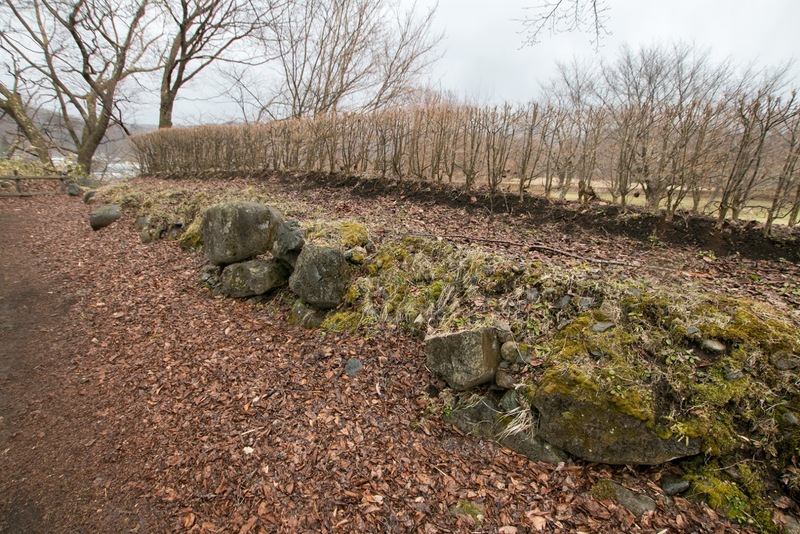 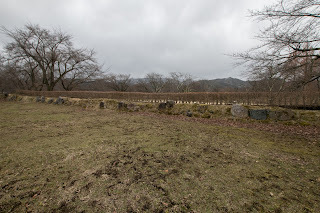 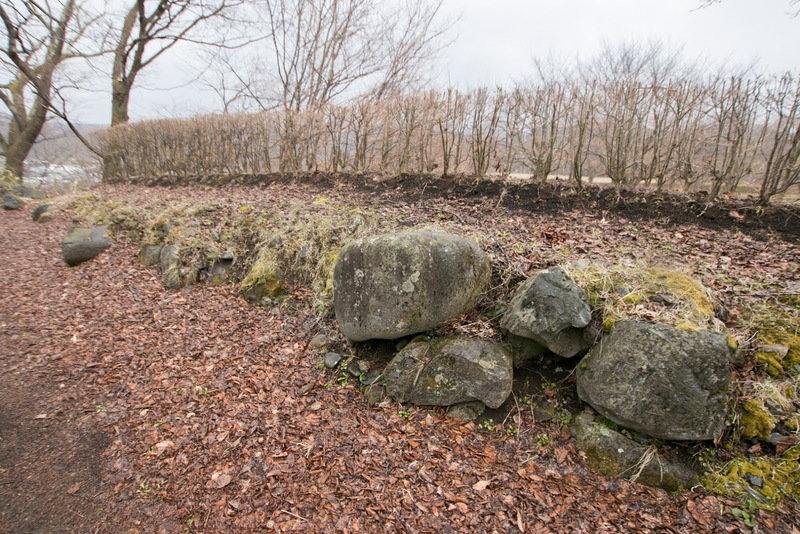 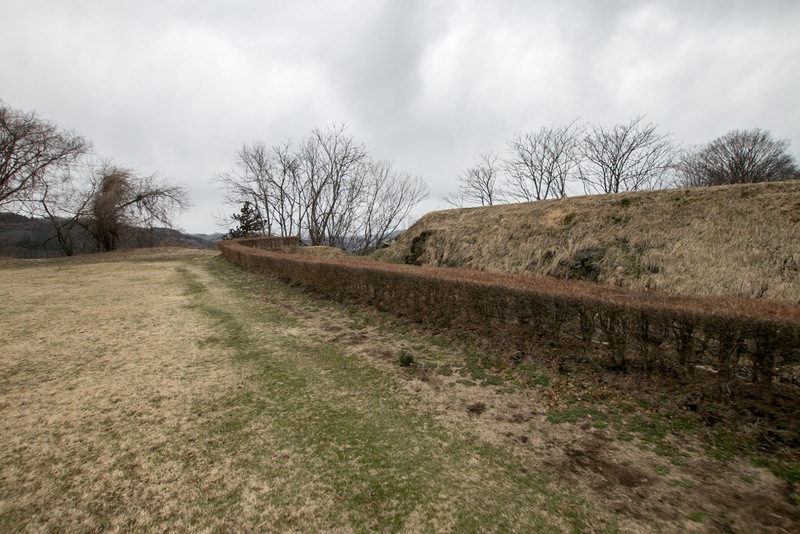 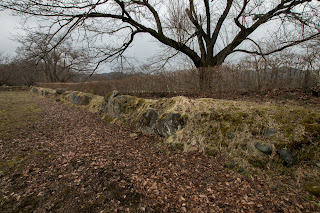 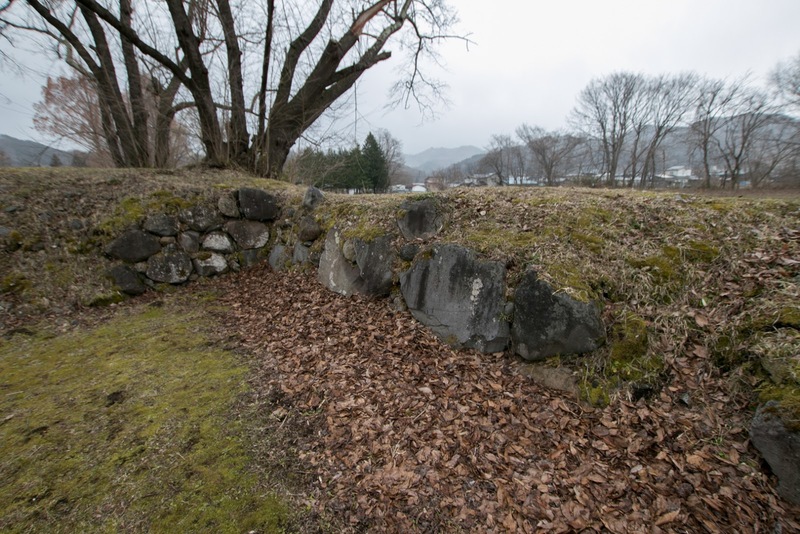 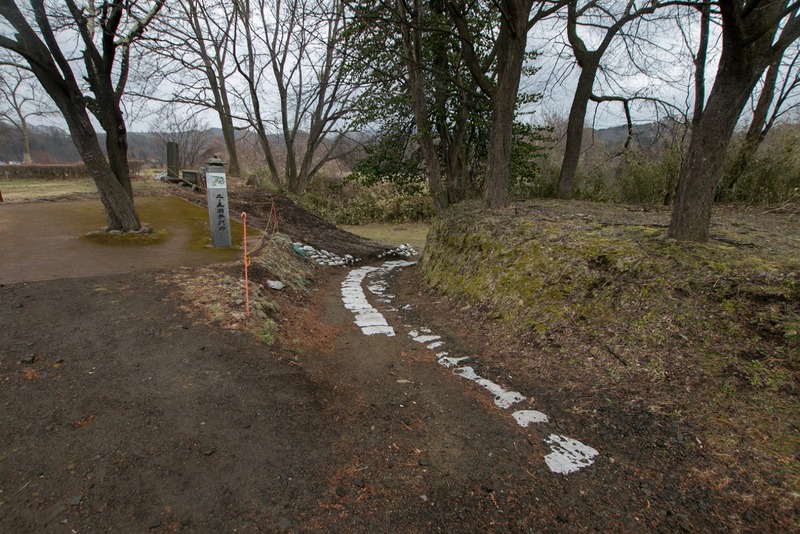 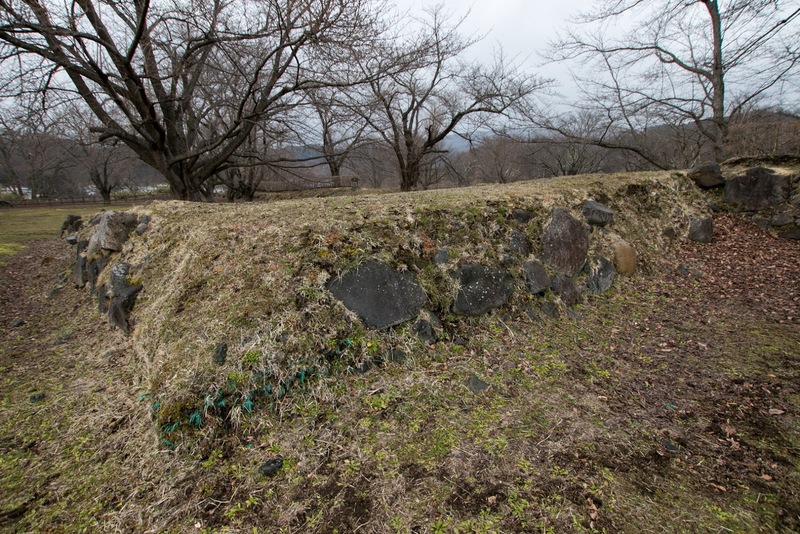 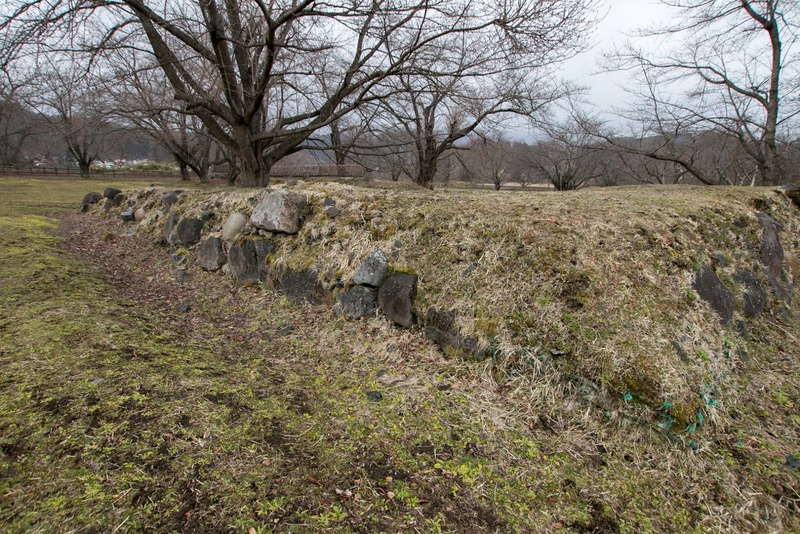 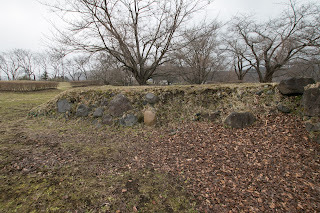 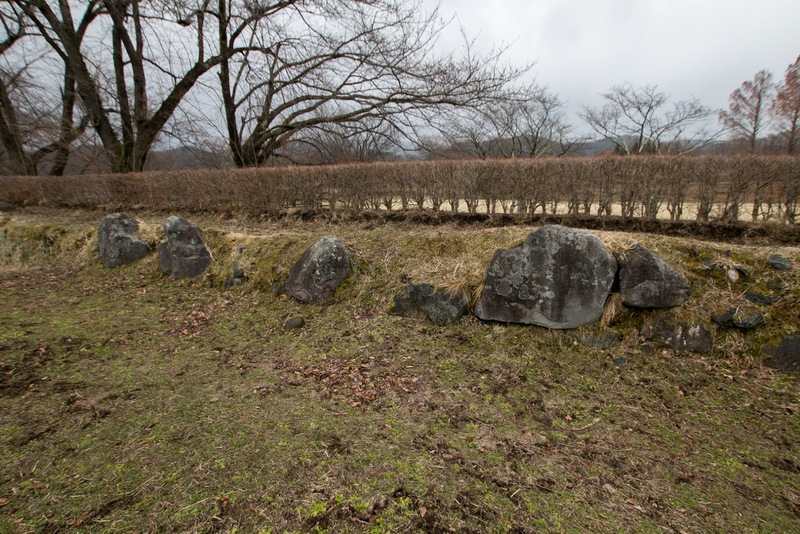 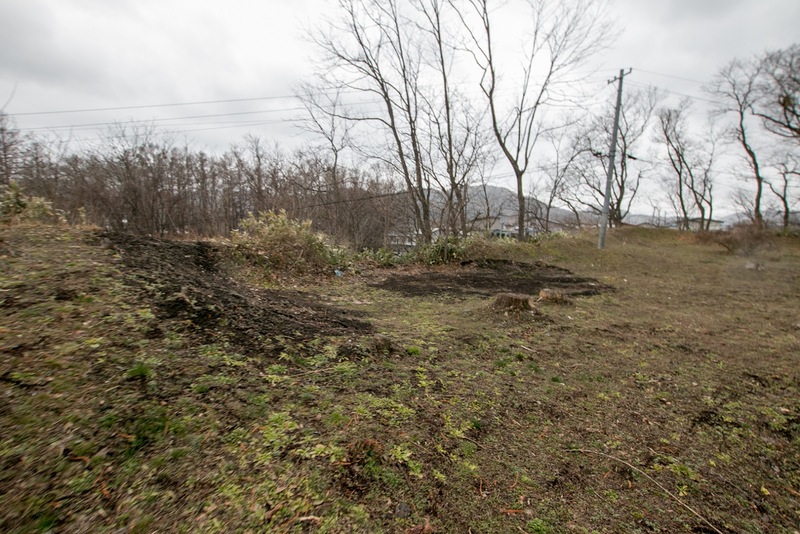 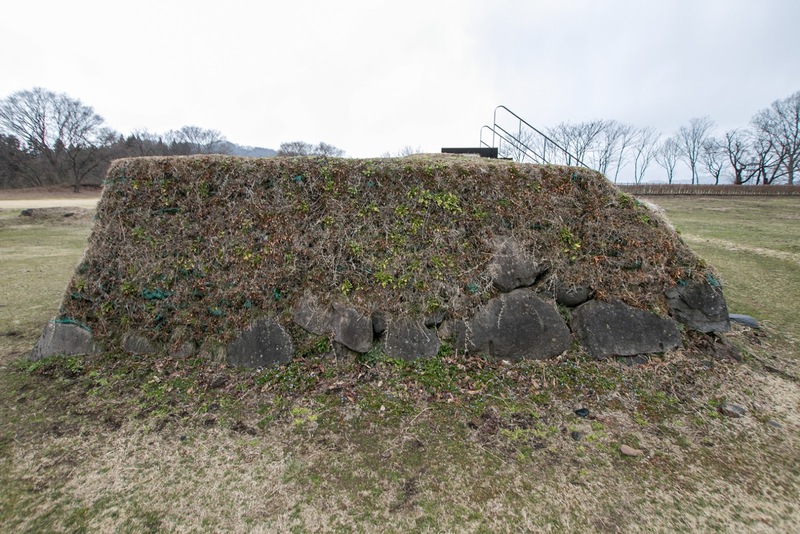 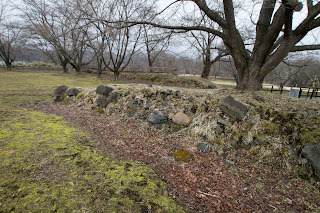 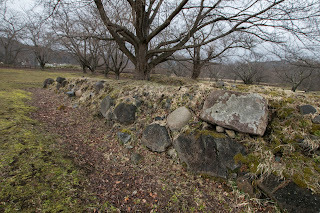 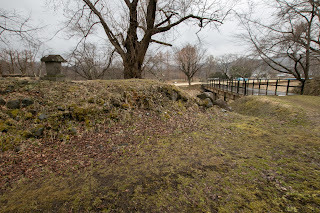 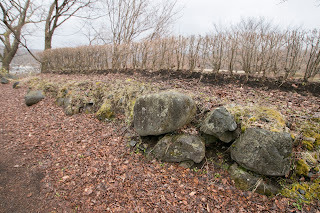 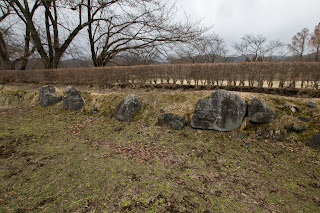 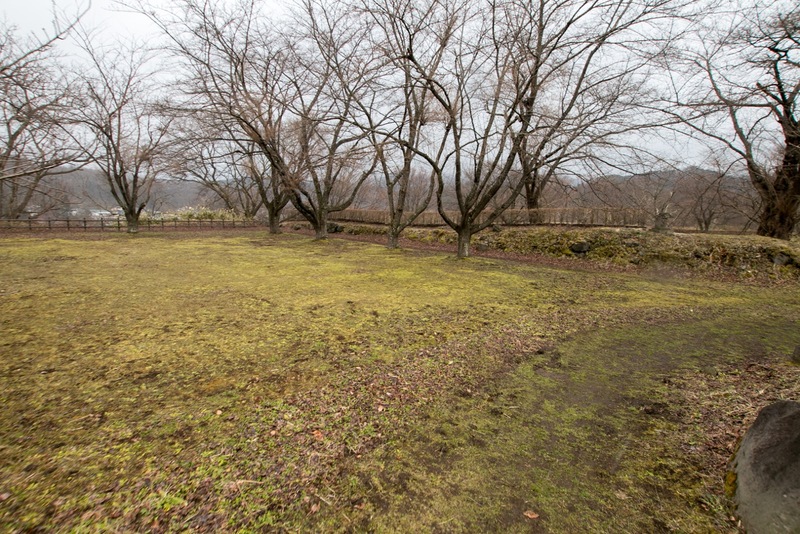 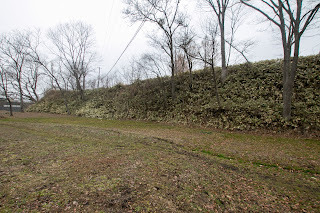 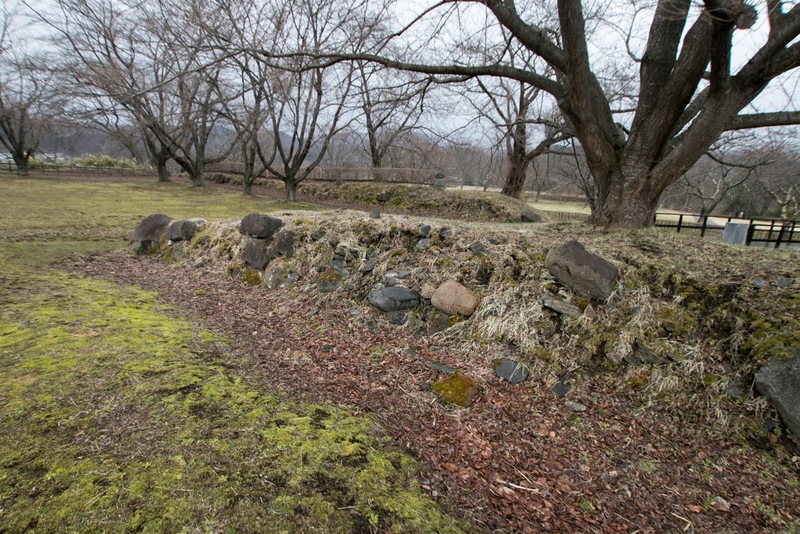 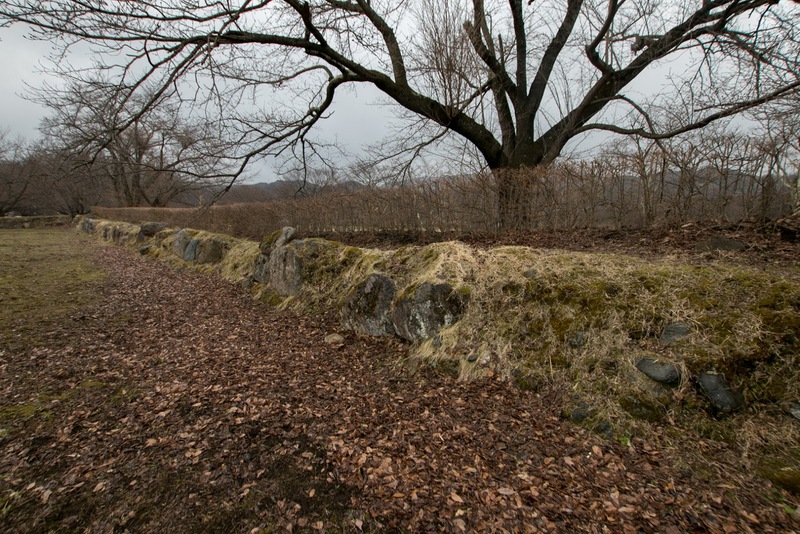 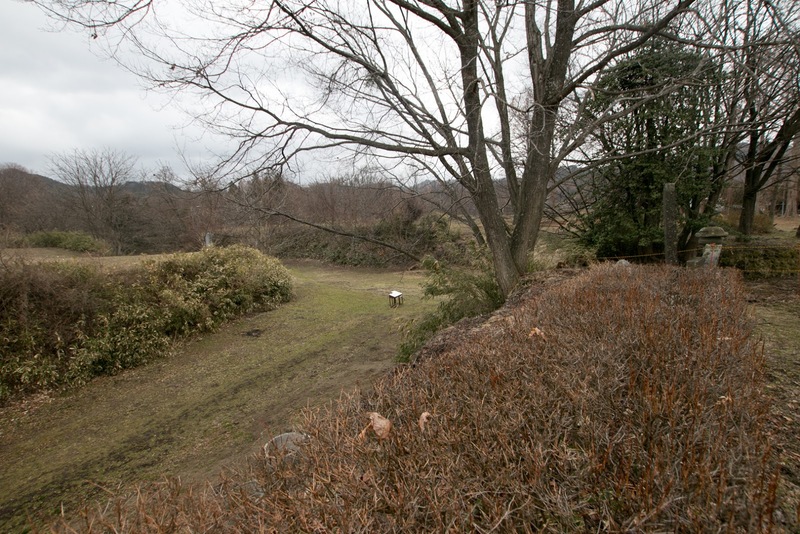 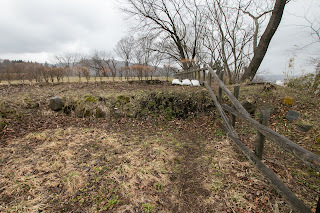 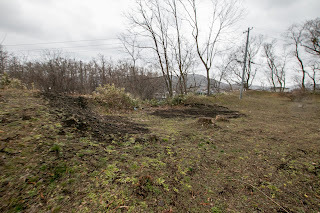 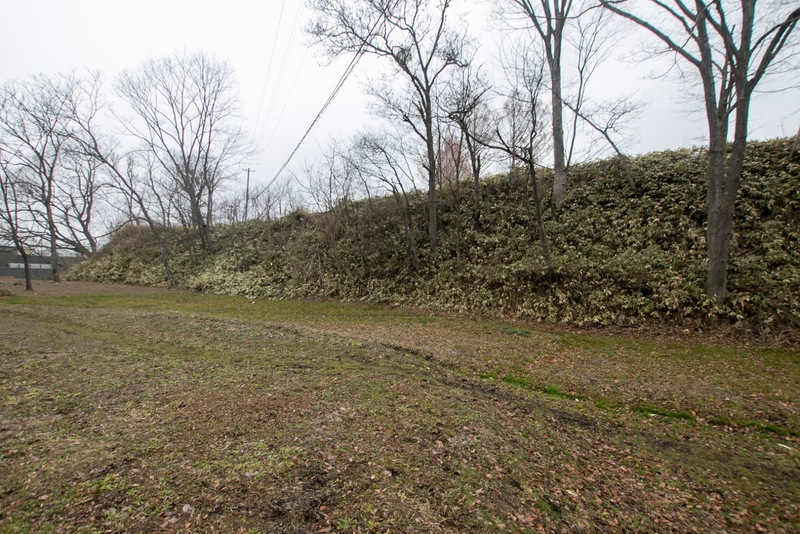 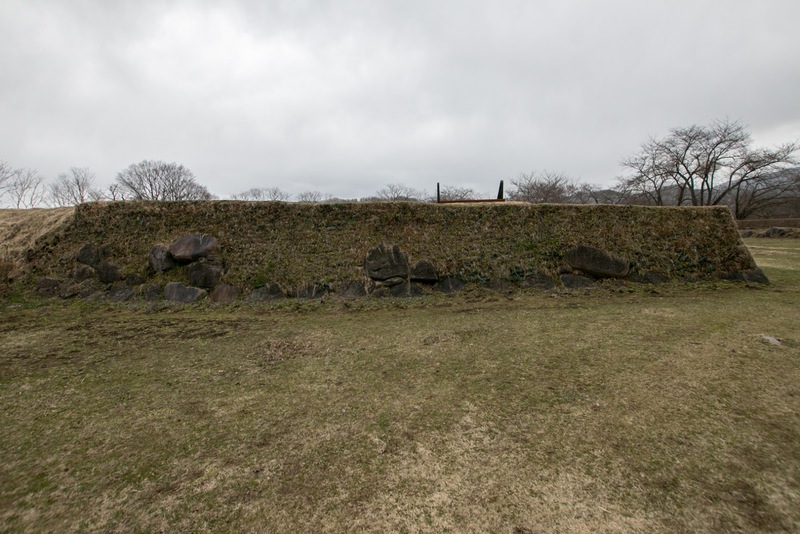 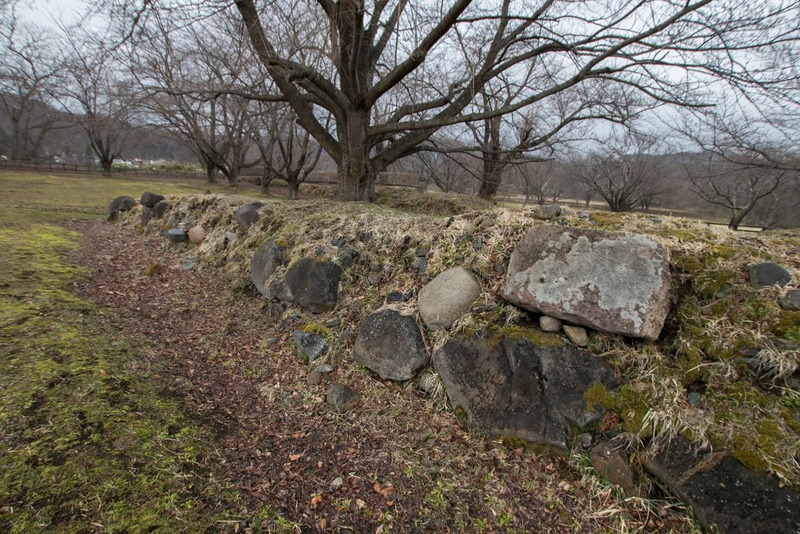 After the fall of Kunohe castle, Toyotomi army renovated central area of Kunohe castle into a modern one equipped stone wall and combined gate, and renamed Kunohe castle to Fukuoka castle. 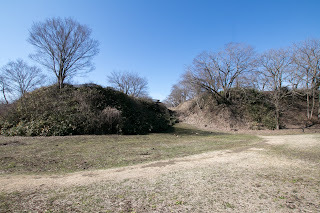 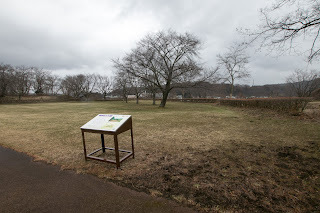 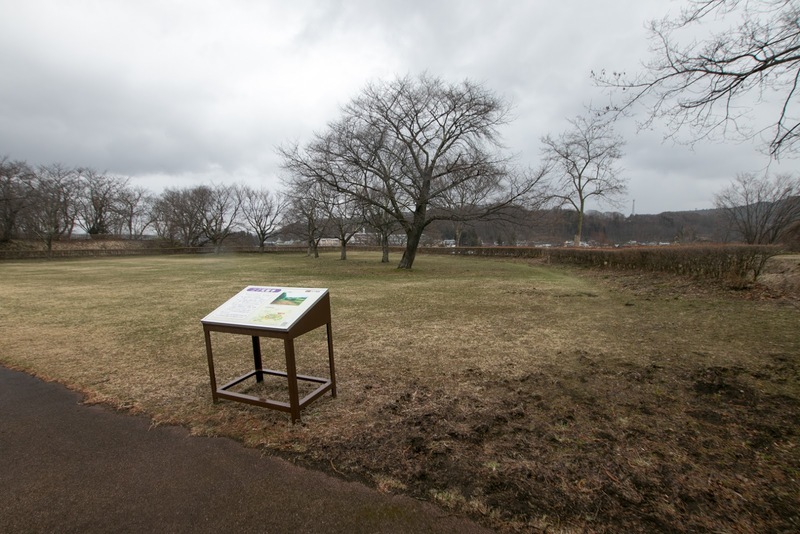 Hideyoshi sometimes built his style castle at occupied area as a monument of his reign, such as Ishigakiyama castle (Kanagawa prefecture) of Kanto region or Tachibanayama castle (Fukuoka prefecture) of Kyushu island. 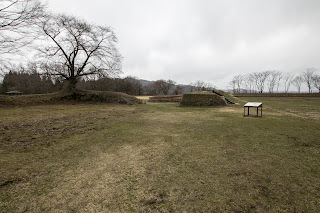 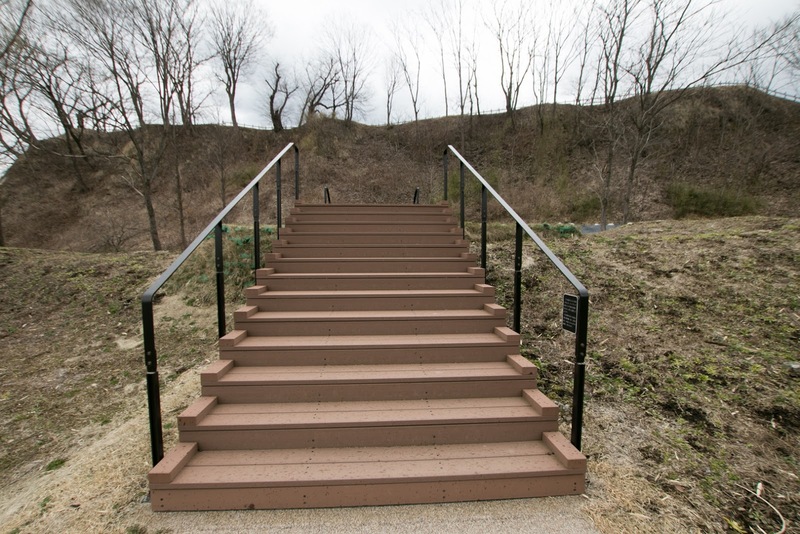 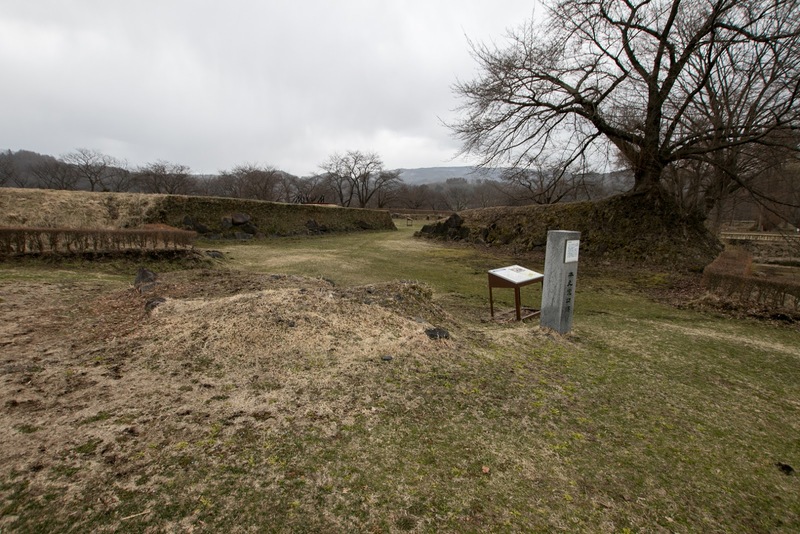 Kunohe castle was the first castle in Tohoku region equipped modern style. 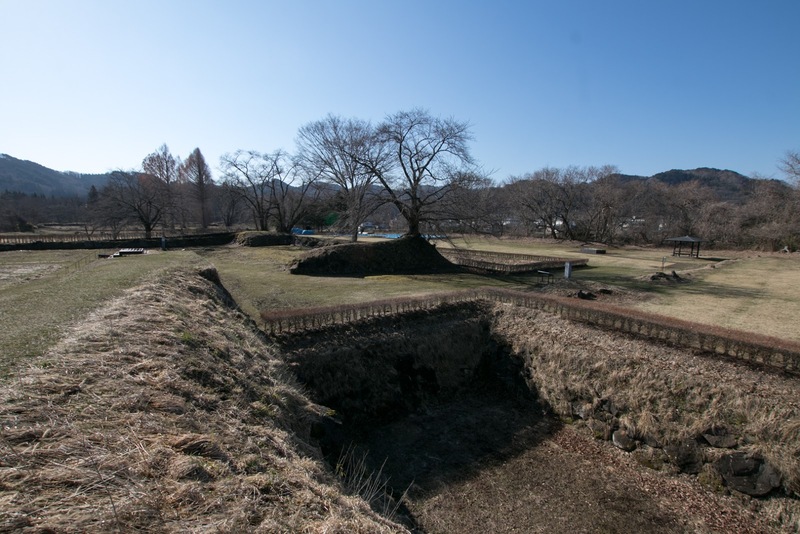 Renamed Fukuoka castle was given to Nobunao and was temporally used as his residence by his transfer to current Morioka castle in 1597. 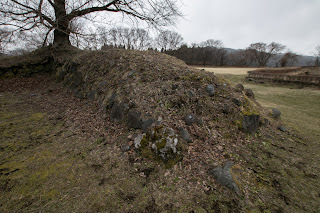 Kunohe castle still had been used after that but finally was abolished in 1632. 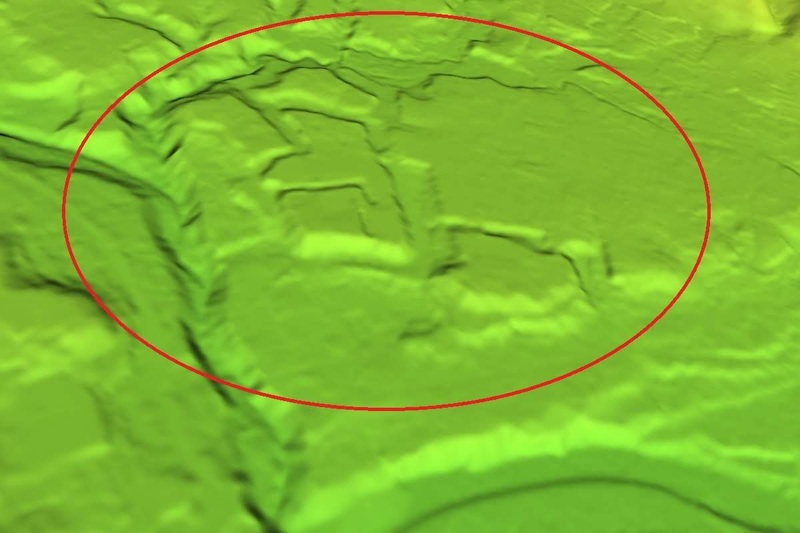 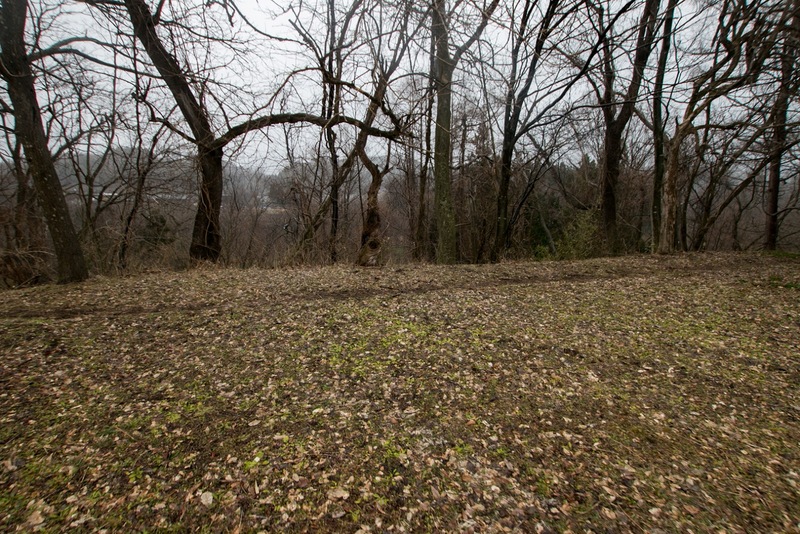 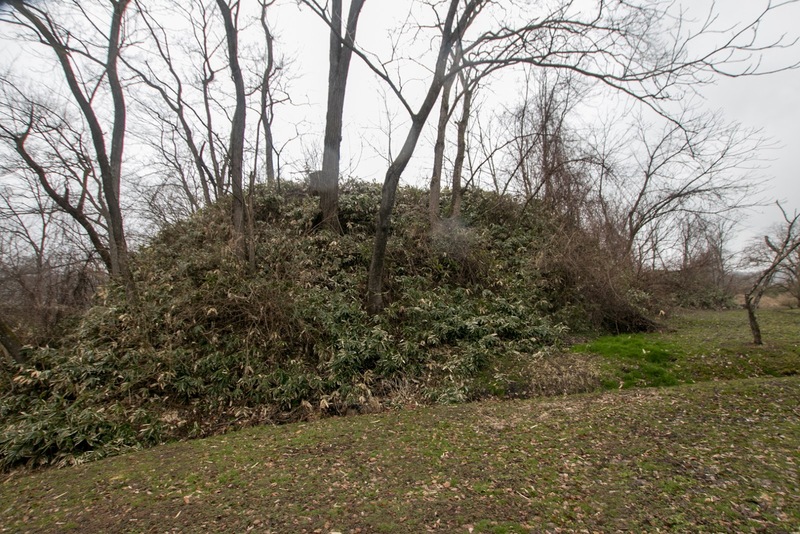 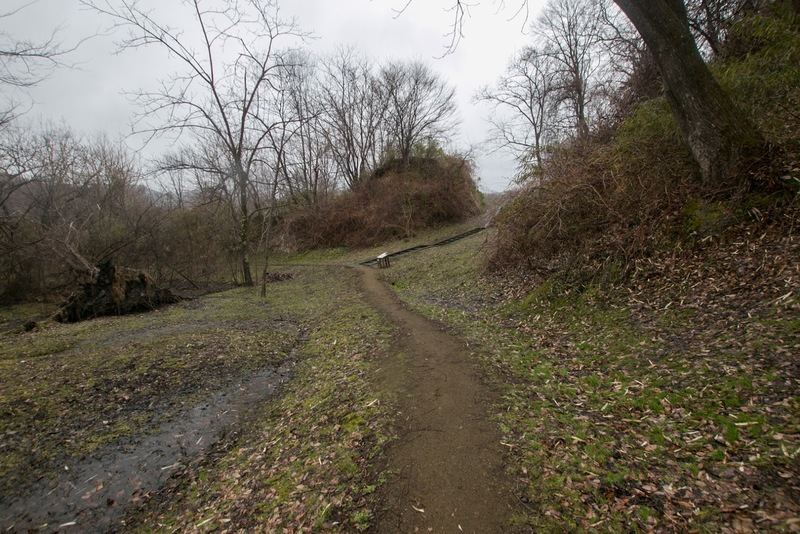 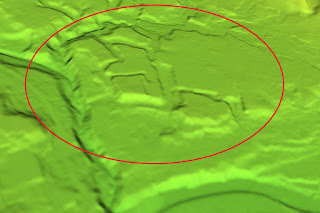 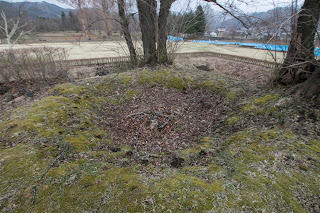 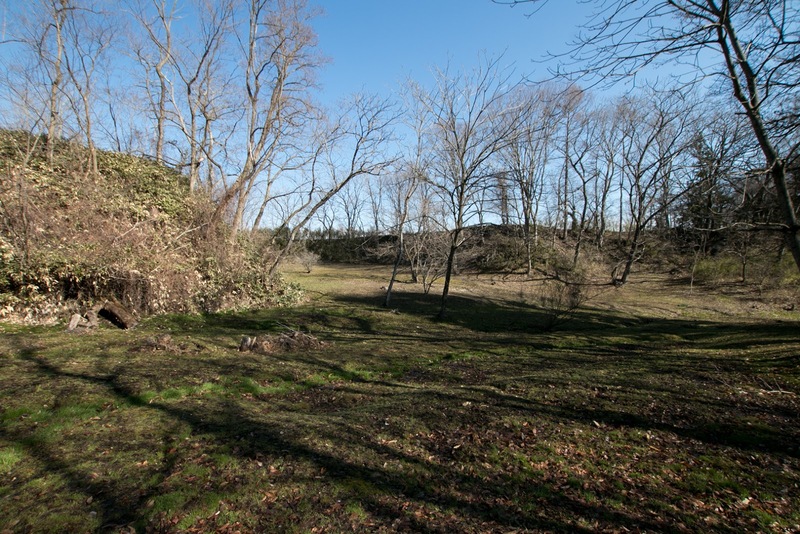 Now all buildings were lost but structure of the castle well remain over the river terrace. 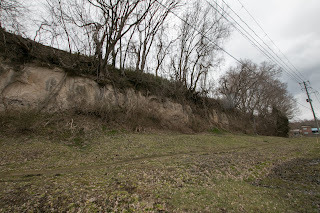 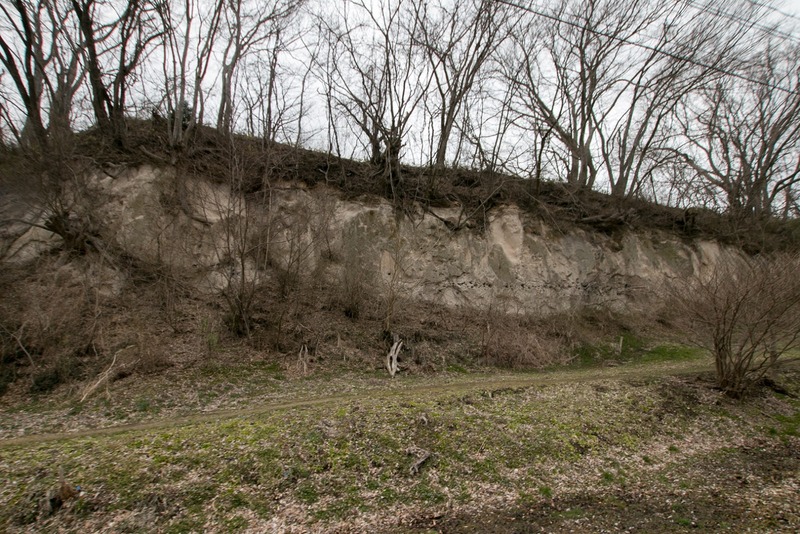 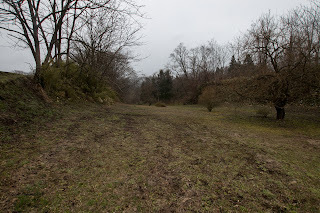 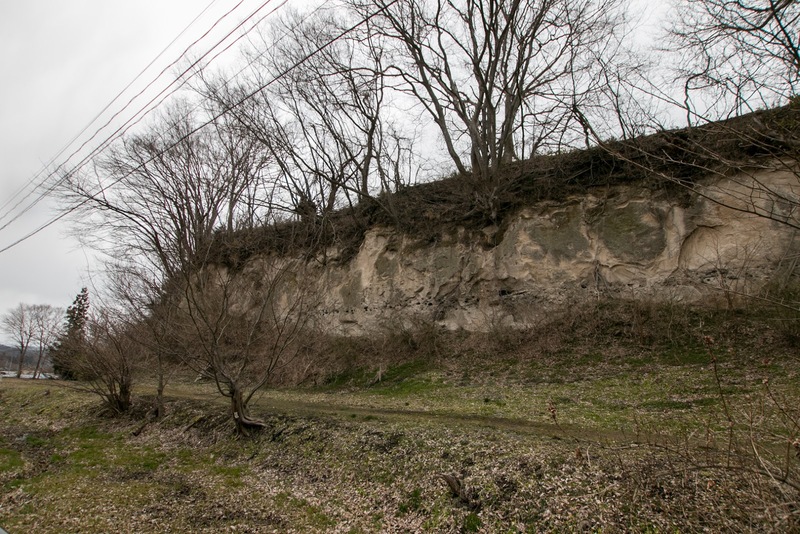 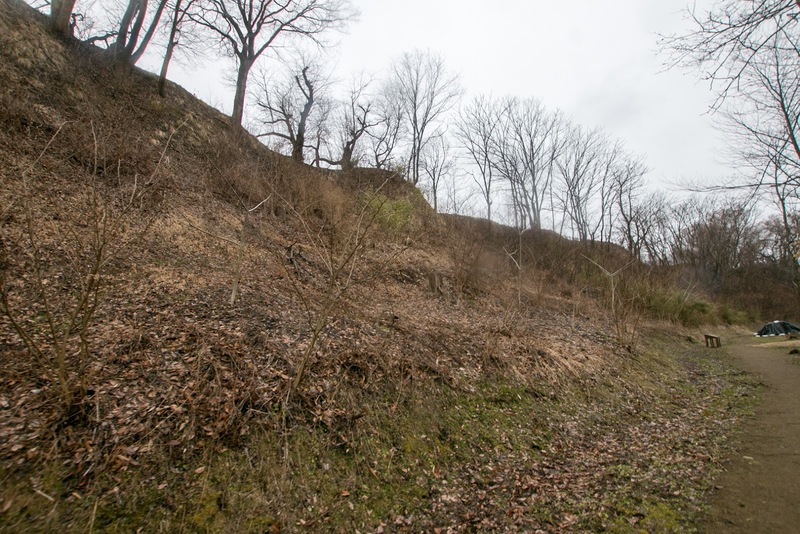 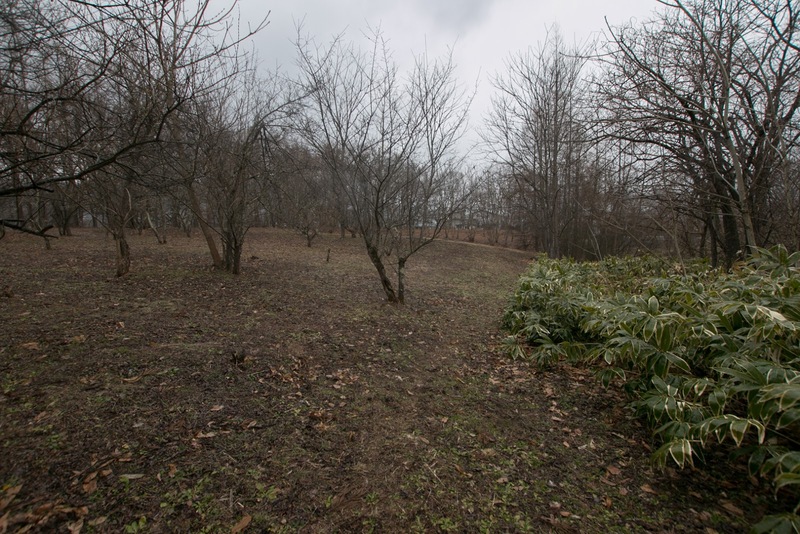 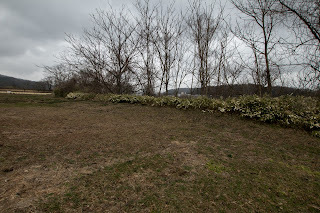 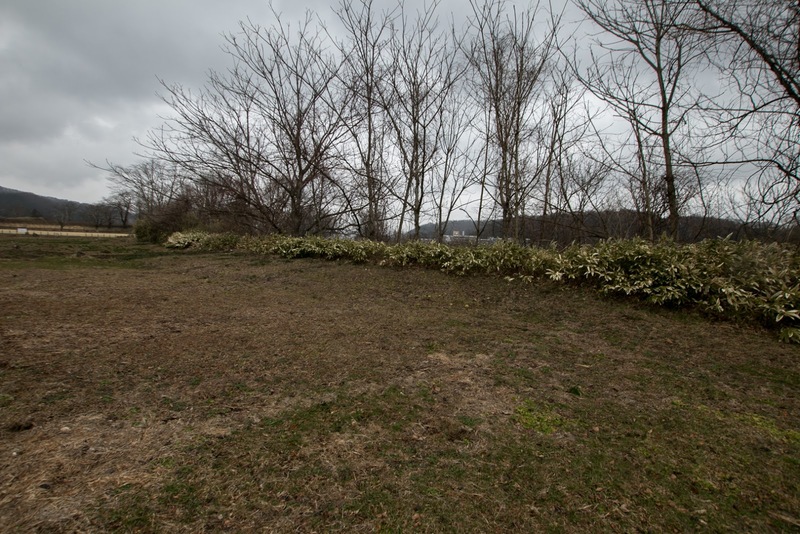 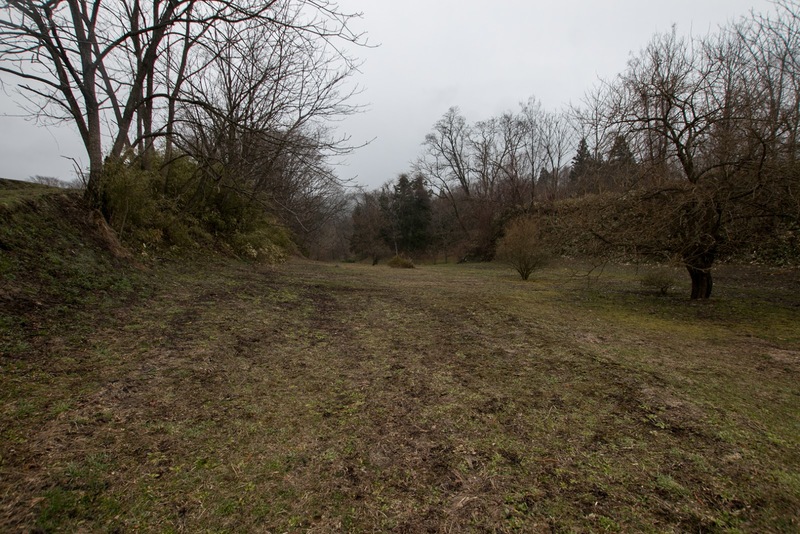 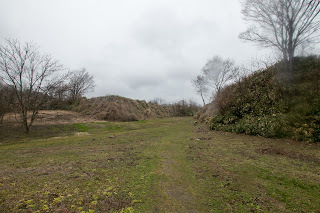 Combination of rough and sheer cliff of outer area and ruins of stone walls at modernized central area well shows the struggle of local autonomy and central authority, and also end of medieval era and coming of modern age in this region. 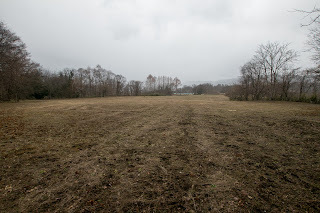 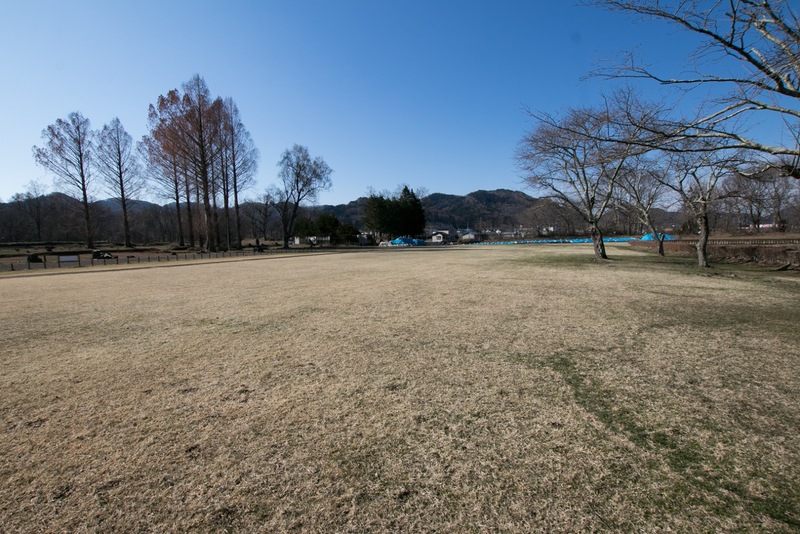 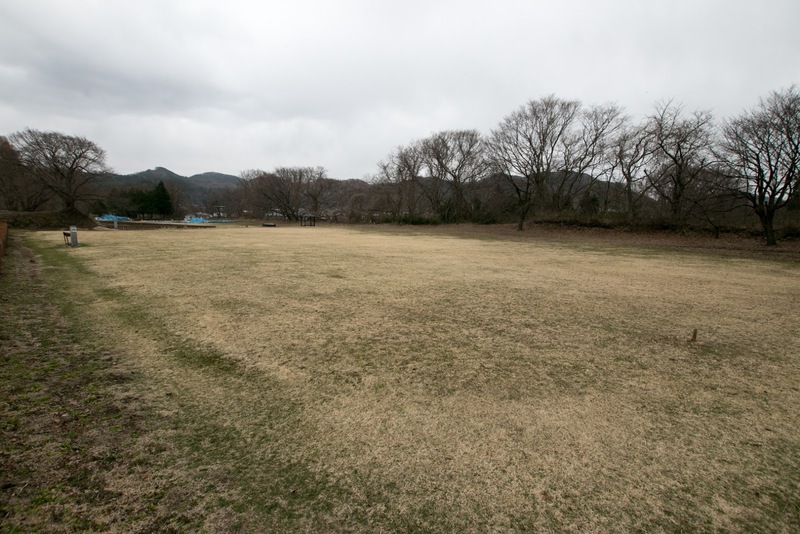 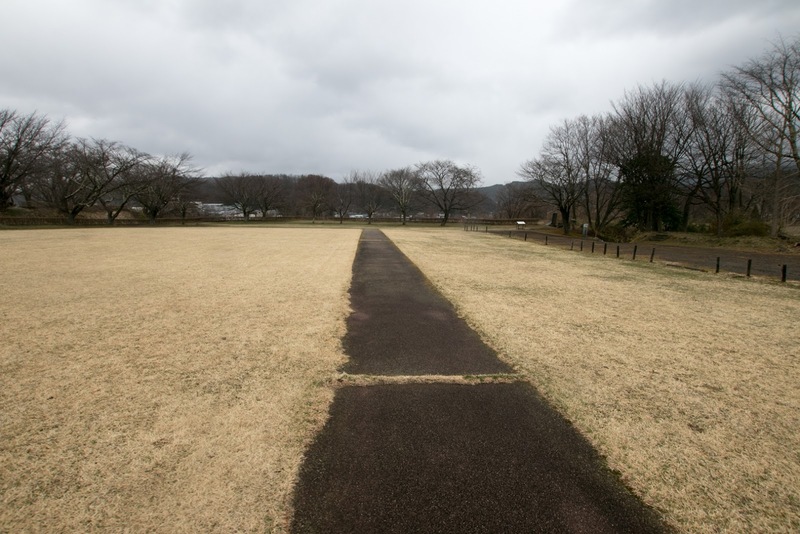 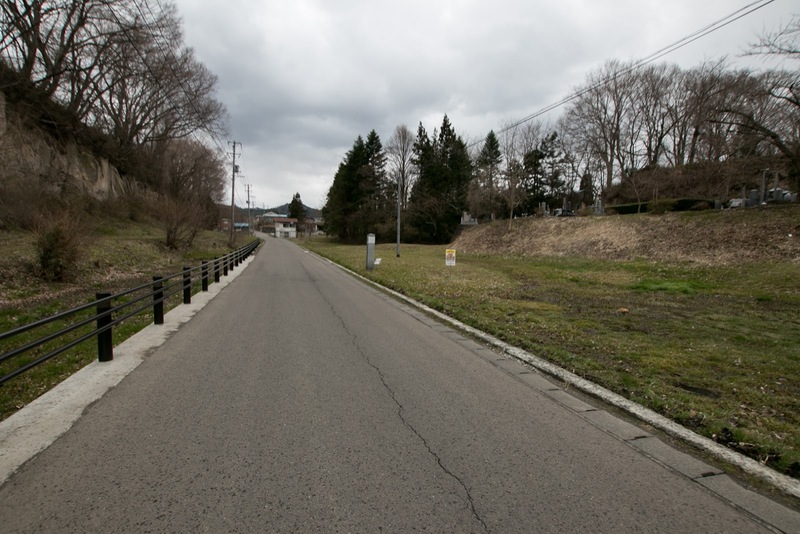 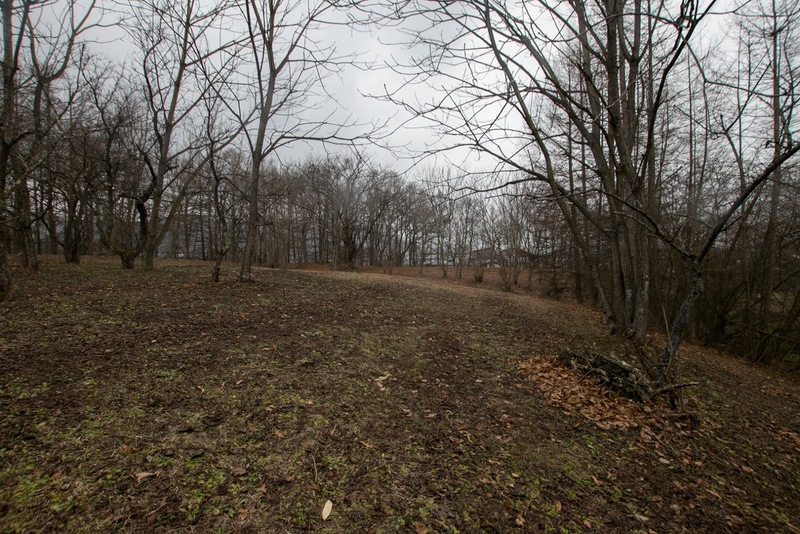 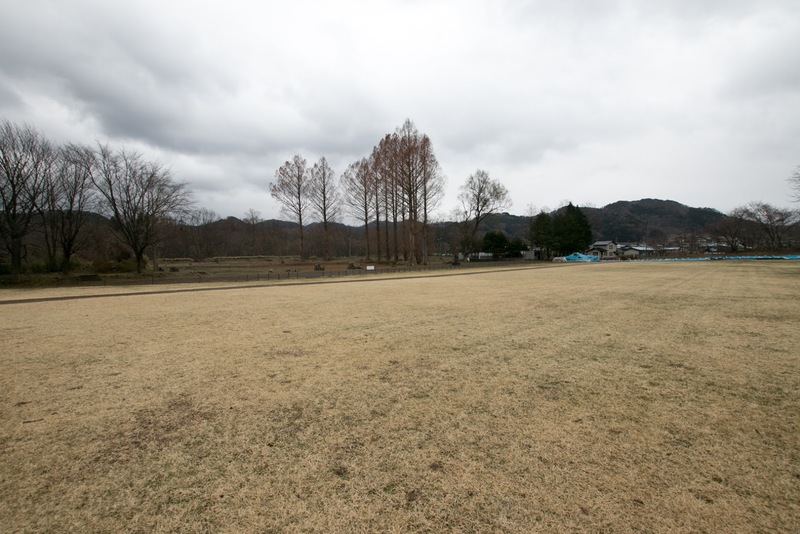 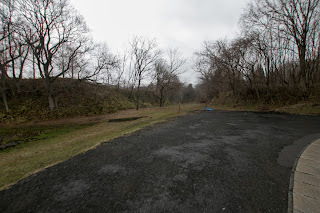 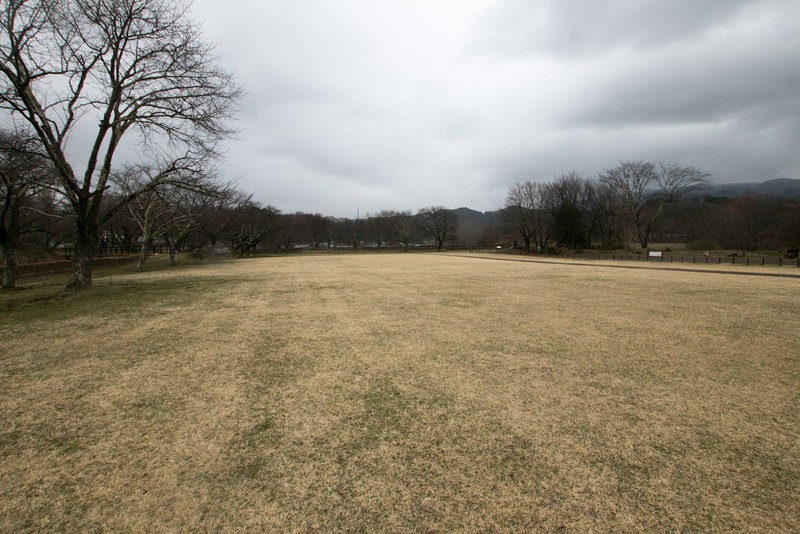 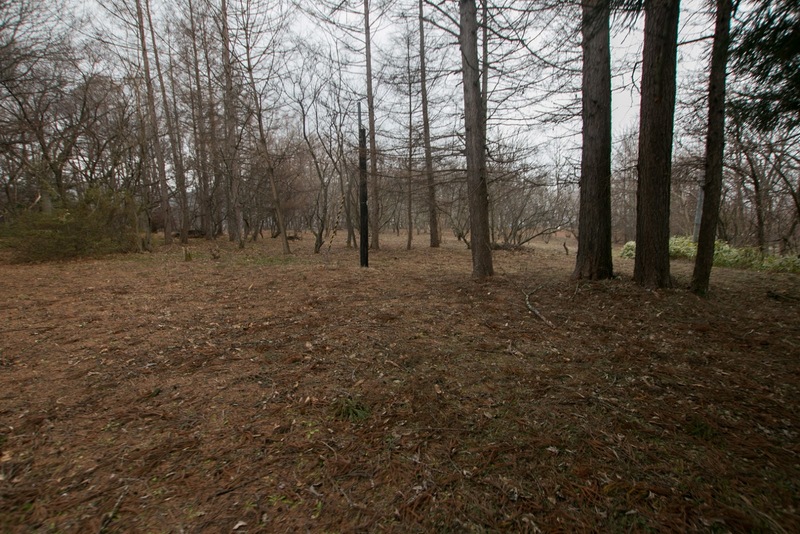 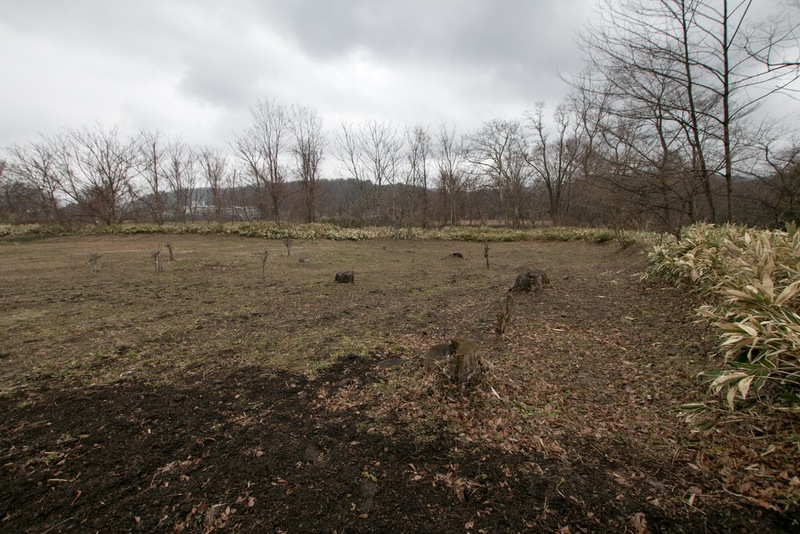 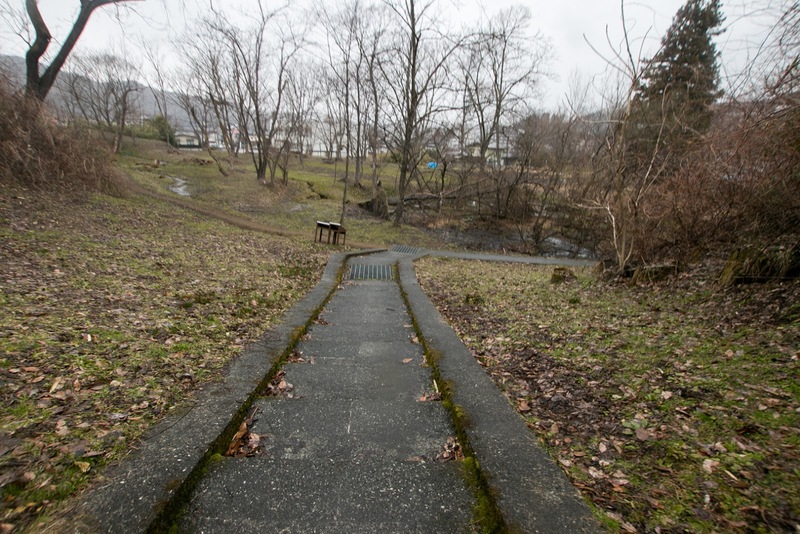 20 minutes walk from JR East Tohoku Shinkansen line /IGR Iwate Ginga Tetsudo line Ninohe station. 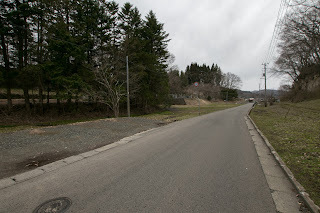 15 minutes drive from Hachinohe Jidoshado Expressway Ichinohe interchange.